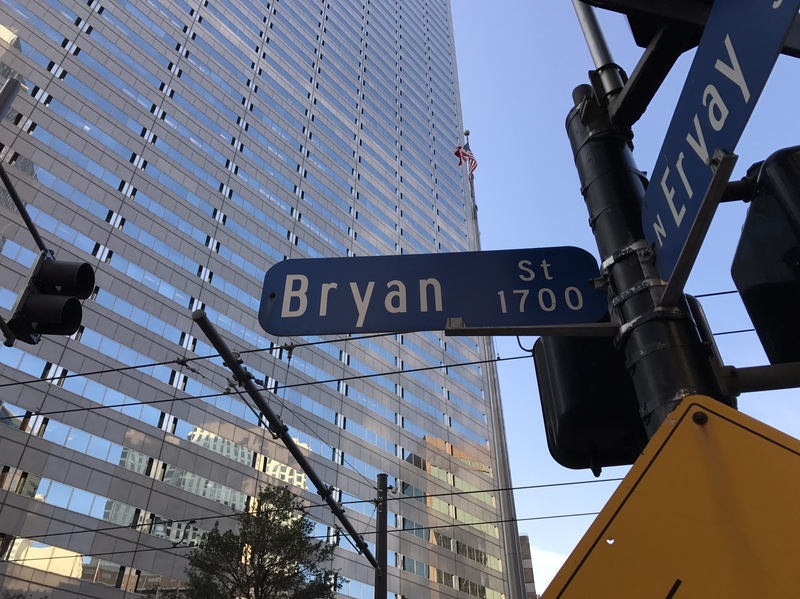 bryan – Page 2 – Live MoHo! 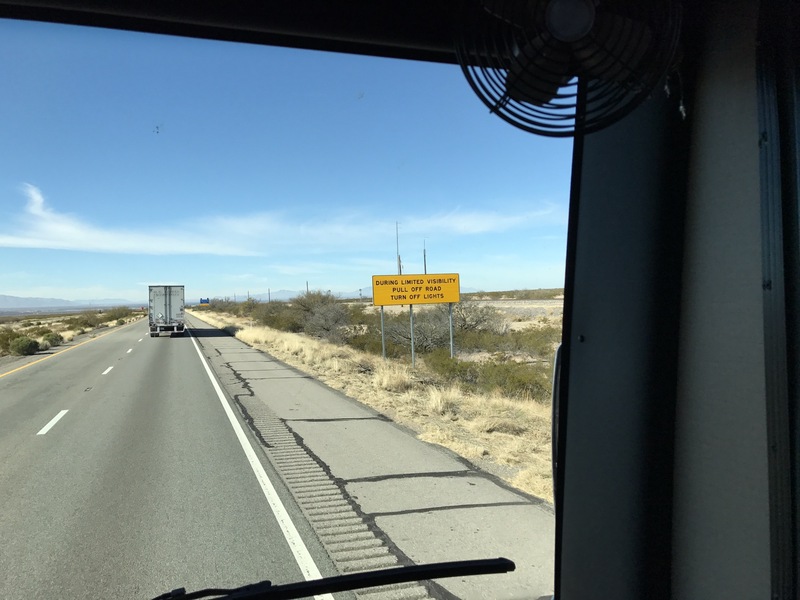 Weather was much warmer than Santa Fe, but still kind of chilly as we departed Las Cruces and headed west toward Tucson. Geography being what it is, temperatures increase significantly as we cross the continental divide and descend into Tucson. Las Cruces is at 3,900 feet of elevation, 2,500 feet. That 1,500 feet makes a difference! 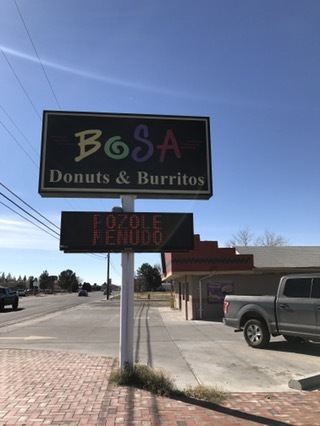 Las Cruces is not a tourist hotspot, but it does offer a variety of interesting cuisine. Like Bosa, for those times when you can’t decide if you want donut…or a burrito. Or both! The menudo is pushing it though. Maybe in addition to Burritos and Donuts they could also offer fried chicken. 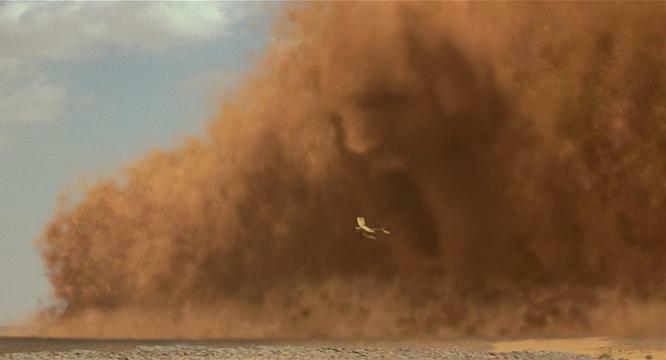 Real haboobs actually look just like the movie -minus the Mummy face. 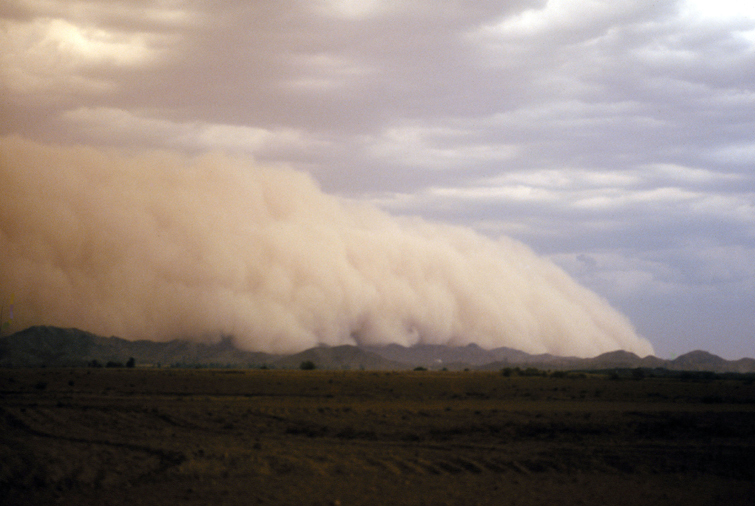 This haboob is from the movie called “Typical Phoenix Weather. ” It is showing multiple times per year all over Phoenix. Arizona is home to a unique type of RV mega-resort. Very different than the RV campgrounds we encountered everywhere else (particularly in the Northeast). These mega-communities may have over a thousand campsites (some in Phoenix are over 2,000). All sorts of activities are available ranging from pickleball and shuffleboard to water polo and glass blowing. 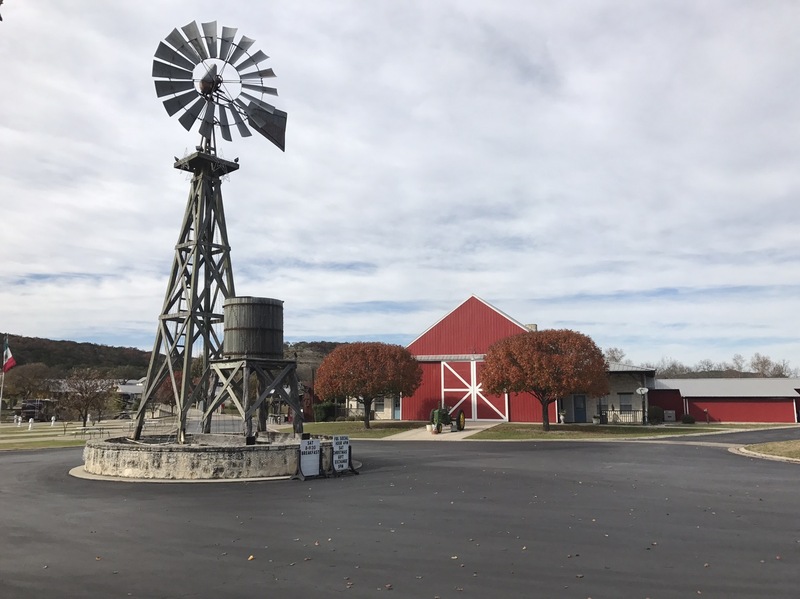 Voyager has an on-site restaurant, store, athletic center, craft room, tennis courts, several pools, a clinic, a wood shop, a business center, a massage center, and even a pet grooming center. Resorts like these focus on older retirees and snowbirds who come for the winter. Many are 55+ age and up exclusive. Activites are targeted at these groups, and families with children are actively discouraged. Canadian flags fly proudly and the mega-resorts welcome refugees from the cold and snow. Park models are quite common. Even manufactured or permanent homesites are inside the resort borders. 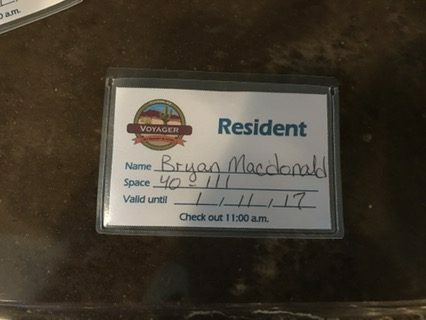 Voyager is the first place I have seen where permanent homes are available for sale. Geezers in electric (read – silent) golf cart dart around the resort like crazed teens. We had to pay attention to avoid getting hit by a granny-driven golf cart ignoring one of the stop signs. The stop signs, you see, are evidently just for show. The spot in Tucson is called Voyager and it has almost 900 sites. Previously the largest RV resort we saw was Wekiva Falls in Florida. Both Florida and Arizona are massive snowbird destinations. 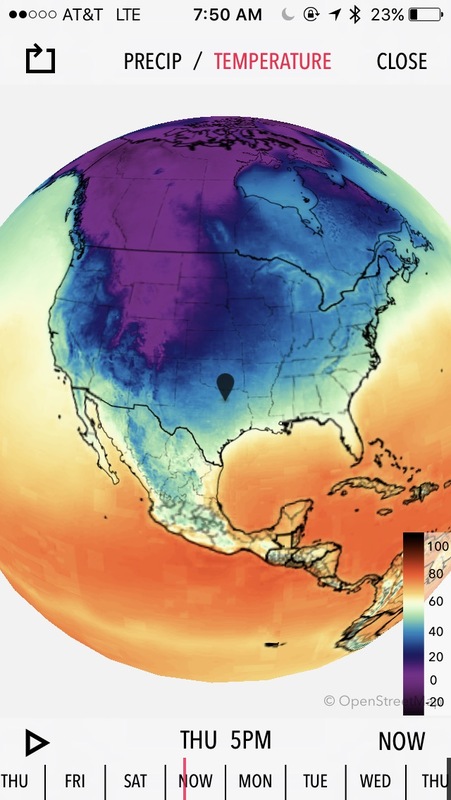 New Mexico and Texas are too cold to get in on the full winter action, California is too expensive, and Louisiana is too swampy. The choice is whether visitors want a warm and moist winter (Florida) or a warm and dry winter (Arizona). Or rather what kind of snakes/spiders are preferred? Rattlesnakes and tarantulas? Arizona. Rat snakes and golden orb weavers? Florida. Voyager required us to do something we have never been asked to do before. Wear a nametag. Huh? Yes. Apparently there are so many amenities at the resort and so many guests coming in and out that they have quite a problem with crowd control. Guests are allowed, but must be registered. Anyone walking the grounds without a nametag gets busted by the security patrols. Which are “mature” individuals in golf carts with – I am not making this up – red and blue flashing lights. 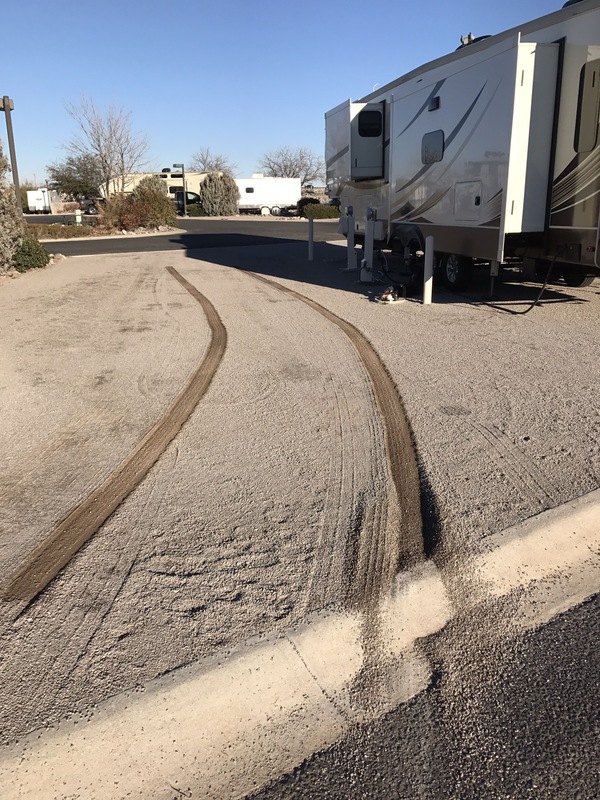 On the plus side, Voyager is also the first RV campground which permits guests to wash their RV on the site. I’m not saying I did that. I’m just saying I COULD have done that. With just a few short days in Tucson, our time had to be metered out. 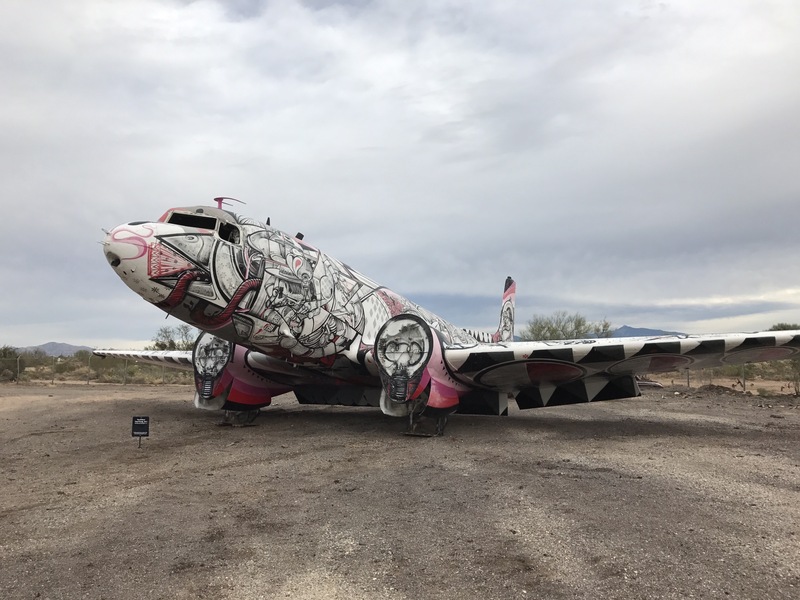 Must see for us is the well-known Pima Air and Space museum and aircraft boneyard at nearby Davis-Monthan Air Force Base. There are 5 hangars and an outdoor display area. Many of the aircraft are unique or notable, like this experimental radar aircraft. 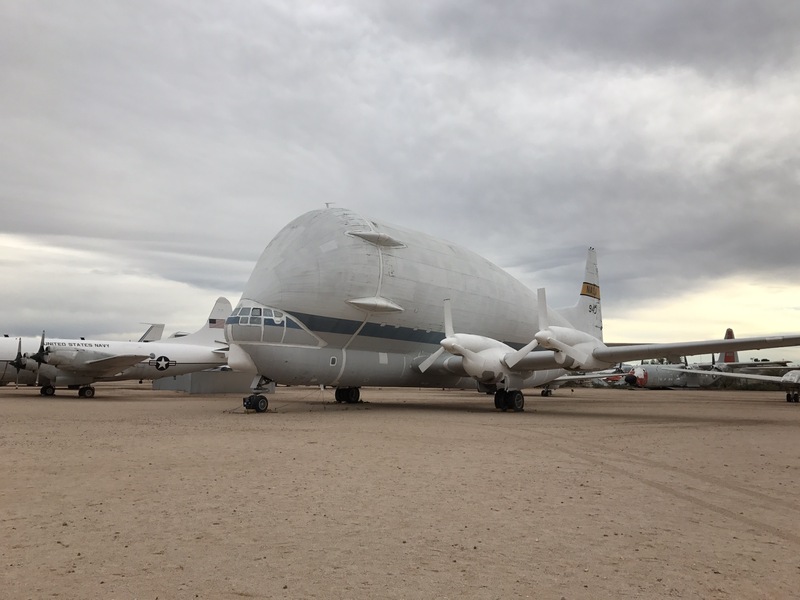 It looks like a pregnant guppy with that radar dome underneath and it looks like it was bolted together with spare parts due to the multiple propeller blades on the front. Another interesting aircraft was the B-24 Mitchell bomber. The B-24 was a remarkable aircraft. It was the first aircraft to routinely fly across the Atlantic. Production numbers over 19,000 units made it the most produced heavy bomber in history, the most produced multi-engine aircraft in history, and the most produced American aircraft in history. 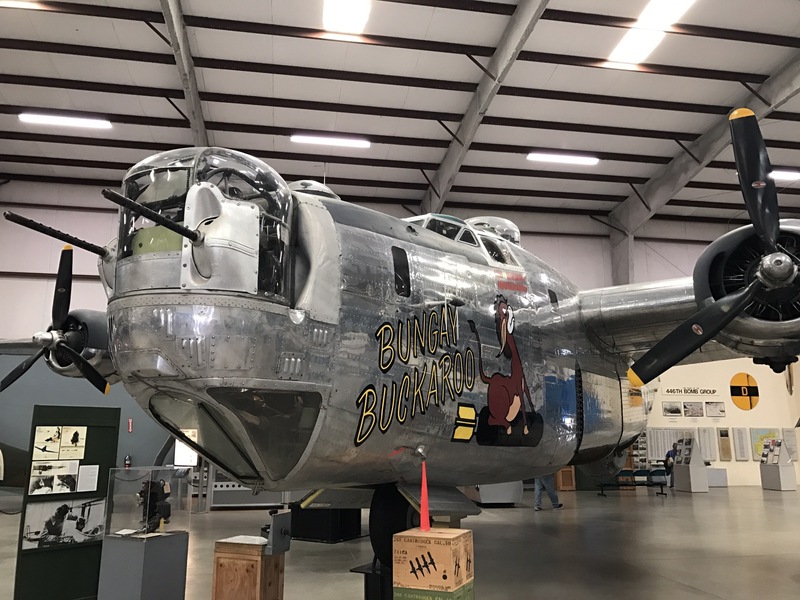 This particular B-24 was assigned to the British Royal Air Force during WWII and had the name Bungay Buckaroo. 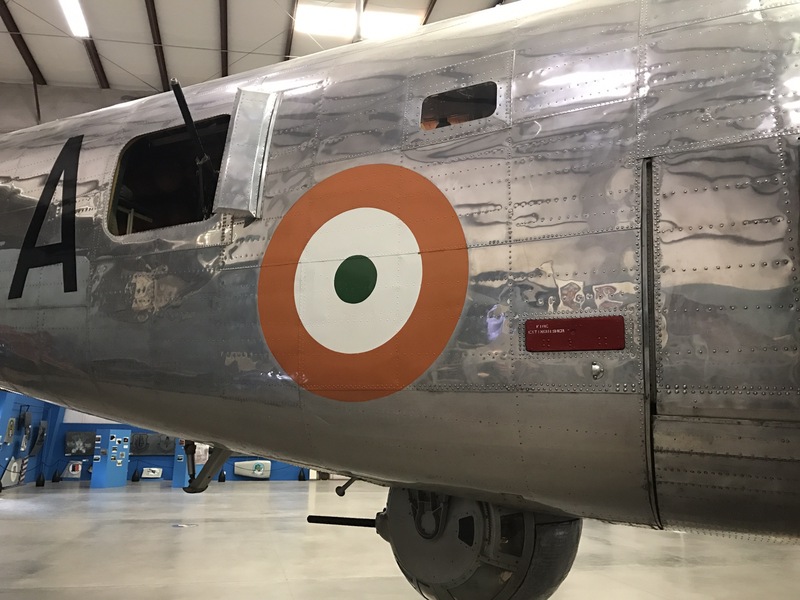 After the war it was transferred to India where it served with the Indian Air Force. As displayed, the B-24 has American/British markings on the port side and Indian markings on the starboard side, making it unique. After serving for many years without incident in the Indian Air Force, the aircraft was deemed obsolete. 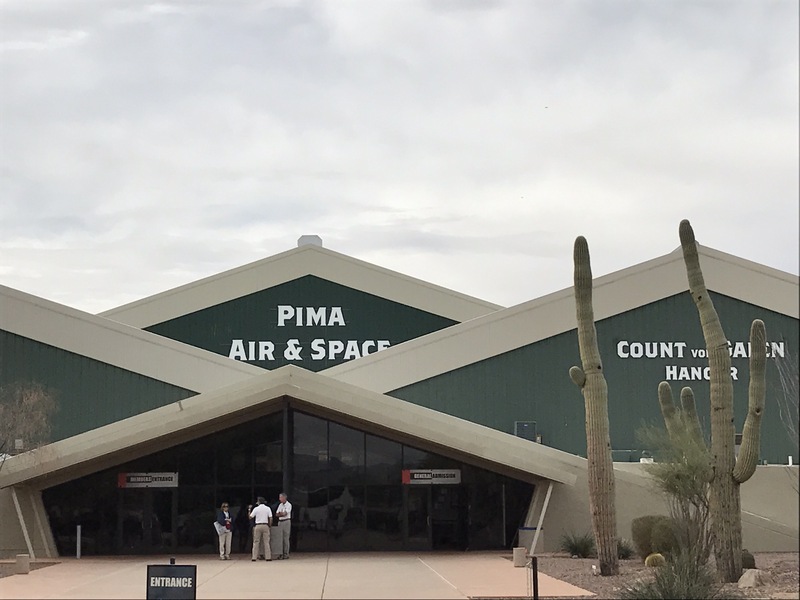 Inquires went out about any museum interested in taking the aircraft and Pima Air and Space Museum jumped at the chance. There was the little detail about getting the aircraft from India to Tucson, however. After many long hours of debate, it was decided that the best way to make the trip was simply to fly her back to the States. It took some work to find an air crew with B-24 experience to fly her, but a crew was finally found and the trip began. Just a few hours after the trip commenced it nearly ended in disaster! The crew turned northwest and began the journey home. Shortly after taking off the flight left Indian airspace on its way toward Germany. Suddenly fighter jets from Pakistan surrounded the B-24 and forced it down. The crew was met on the runway by Pakistani military police and taken away for interrogation. It seems the crew forgot two important details. First, they forgot to file a flight plan. Second, they forgot that Pakistan and India we on the brink of war. Who would have predicted that the Pakistani’s would be concerned about a bomber with Indian markings flew into their airspace unannounced? Fortunately some frantic discussions and intervention by the US Ambassador calmed the situation and the Buckaroo was allowed to resume its flight. Many of the displays are interactive. 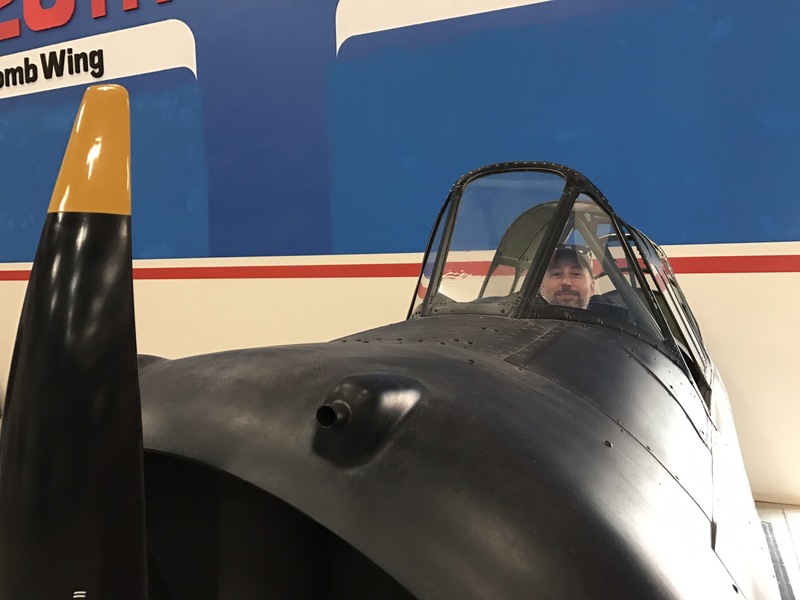 I got to take a turn at the helm of this WWII fighter. 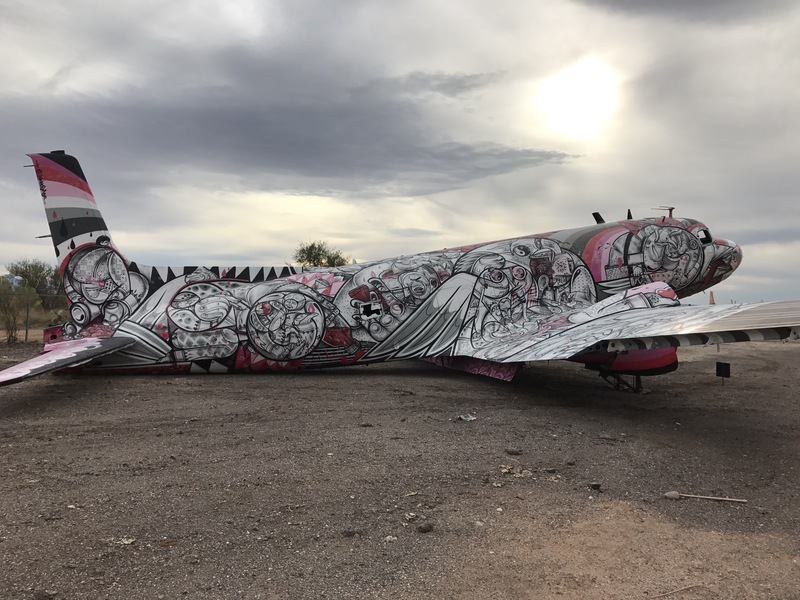 The Boneyard or aircraft graveyard at Davis-Monthan AFB is the (usually) final resting place for military aircraft which have outlived their useful lives. Occasionally one of the aircraft is reactivated, but normally they are used for spare parts or scrapped and shredded. Many of our allies operate aircraft longer than we do, and still require parts which may no longer be available from the manufacturer. 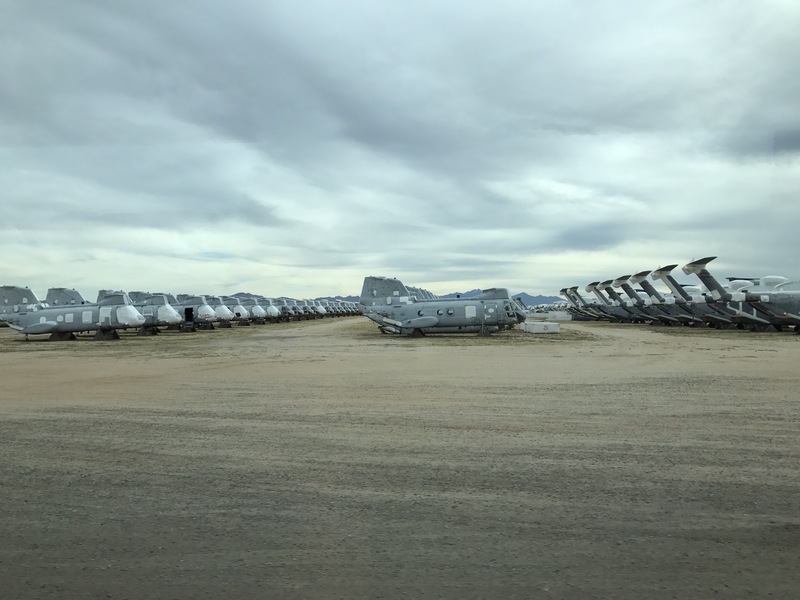 Since the Boneyard is on an active Air Force Base, touring the Boneyard is only possible via tour bus from the Museum. 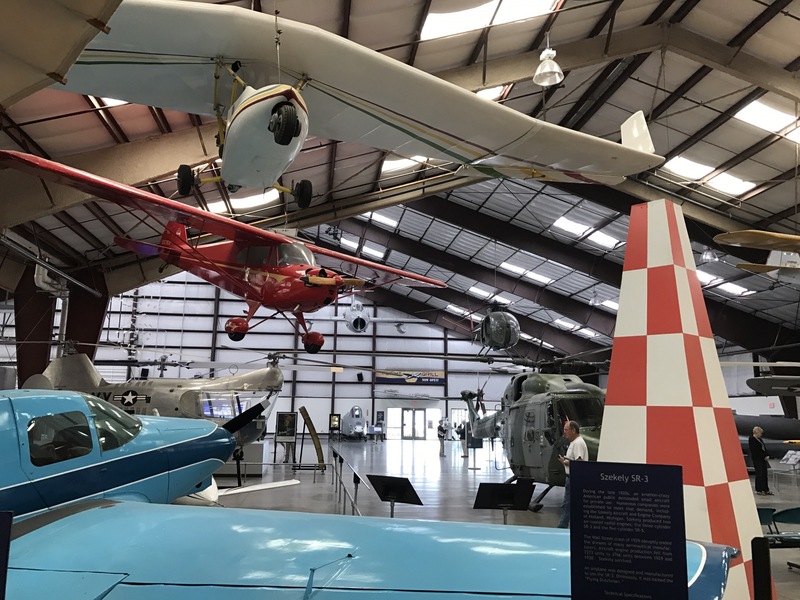 Lines of planes – there are over 3,000 aircraft here – line the desert. The dry air and solid soil permit aircraft to be stored in a state of arrested decay. White spray coating is applied to seams and windows to seal the interior from water and to prevent heat buildup. 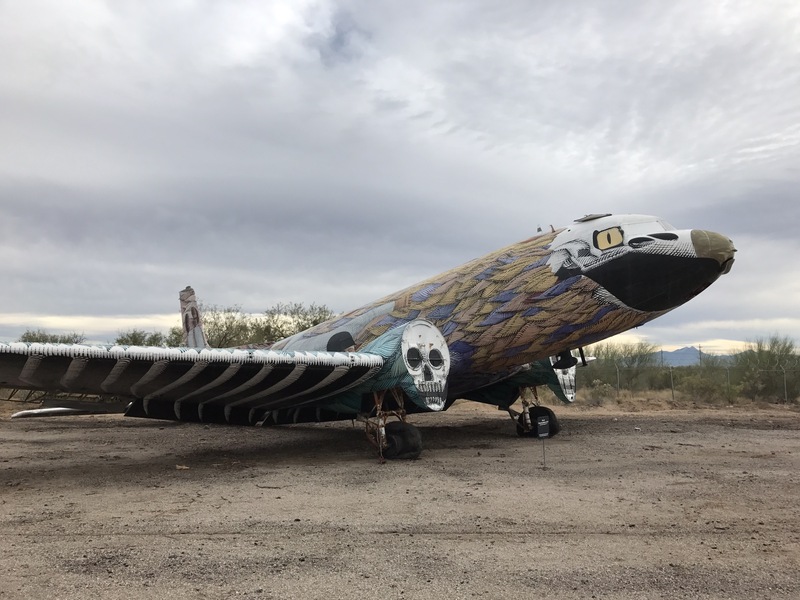 The Boneyard is a unique and interesting place to see. 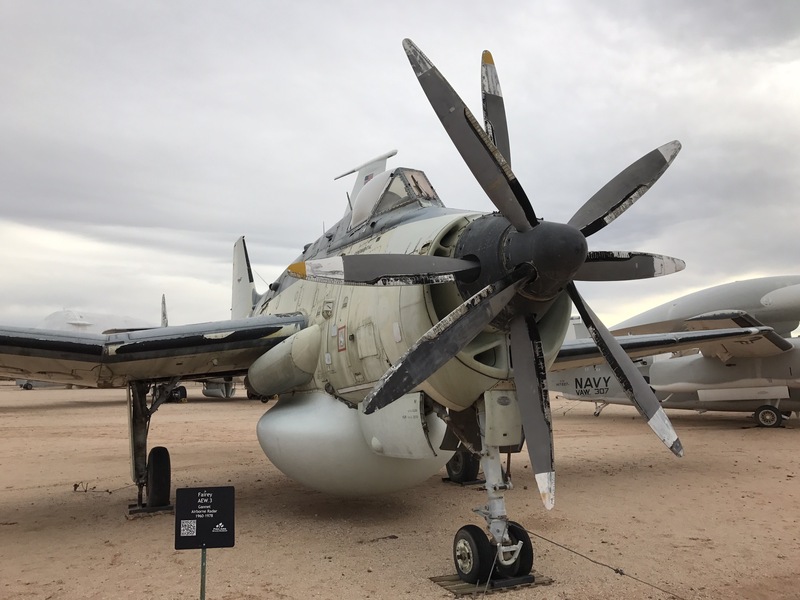 Keep in mind that a full visit of the Pima Air and Space Museum could easily take a full day, and the Boneyard tour adds a couple of hours. Fortunately the Museum has an on-site cafe with some surprisingly good food! 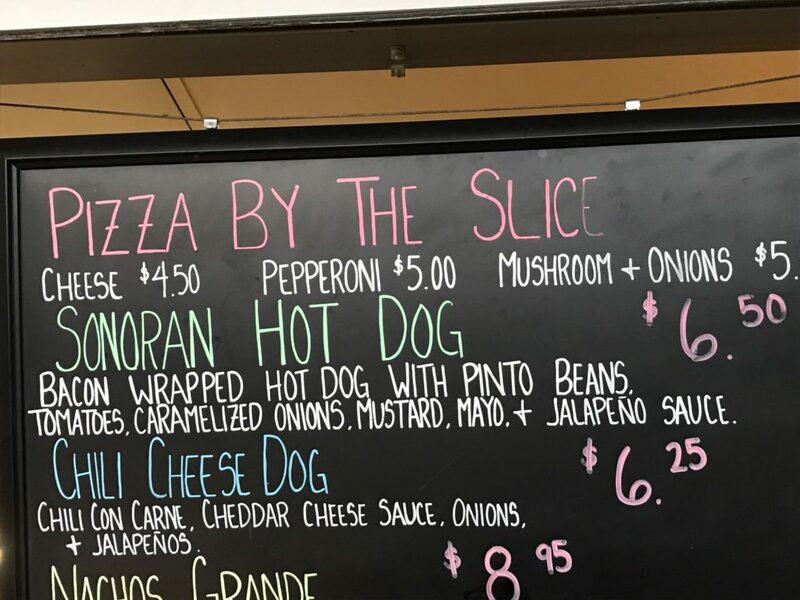 Which includes my new favorite hot dog, the Sonoran! It is a bacon-wrapped 1/4 pound dog with pinto beans, diced tomatoes, carmelized onions, mustard, mayo, and jalapeno pepper sauce. Delicious! Belly full of Sonoran dog, we continued on. Behind hangars 3 and 4 are some really trippy aircraft which have been decorated by a local artist. I’m not sure how the artist got the idea – or the permission – but the effects are interesting. Still, the fact that these aircraft are hidden behind two buildings says something about how much value the museum places in them. There are so many interesting aircraft at the museum that it would be impossible to do justice to the place. This goofy-looking aircraft was an experimental transport plane for NASA. Evidently, even they grew tired of its looks and sent it out for display. One of the hangars at the museum is dedicated to space. We took our turn standing on the moon. It was easier to breathe than I expected. Inside the space hangar we found a mockup of the Apollo moon lander. This isn’t just any mockup, however. It is the actual mockup used during filming of the movie Apollo 13 with Tom Hanks. 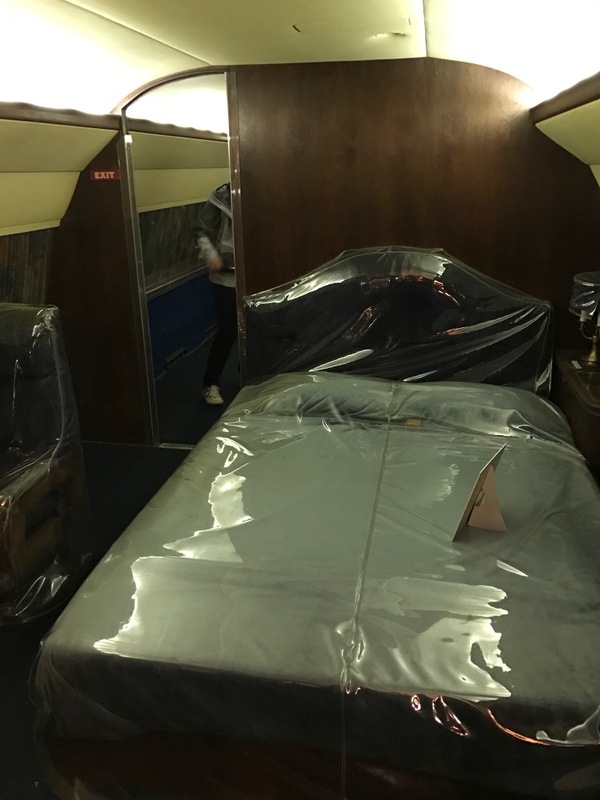 This mockup was installed in the “vomit comet” aircraft and used for filming the zero G scenes. Not only did Hanks, Kevin Bacon, and Bill Paxton have to endure repeated 60 second sessions of zero G, so did all the gaffers, sound techs, set supervisors, and camera crews. 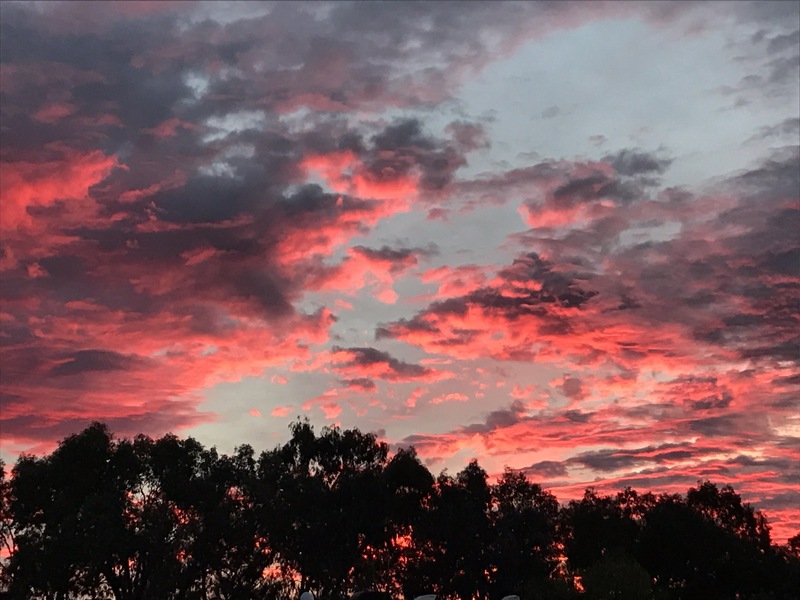 That night we were treated to a spectacular Tucson sunset. I’m told this fiery display is common for the area. It was really quite something to see. The deep red glow on the bottom of the clouds with the still-blue sky behind made for an amazing visual. on our last day, we also drove out to see the only remaining Titan missile silo and control room open to the public. It is located southwest of town about 30 minutes from Voyager. 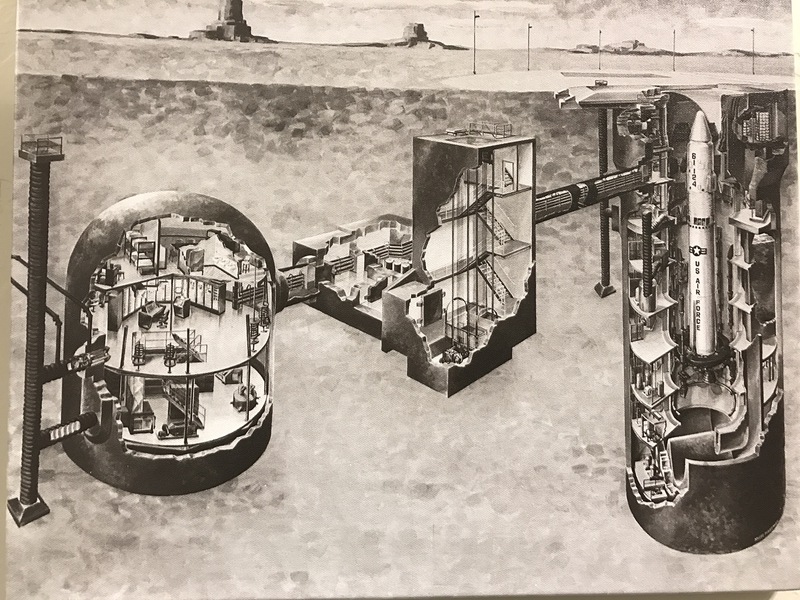 The Titan missile was the first US-based nuclear missle which could be launched directly from its launch tube underground. It also was the first to store its fuel on board. Titan’s fuel and oxidizer are stable when stored separately (which is why they can be loaded in the rocket and sit for years) but they react violently when they contact each other. No ignitor is needed for the Titan engine – simply mixing the fuel and oxidizer chemicals creates the ignition spontaneously. As a result, a Titan can be launched in 58 seconds from the time the launch order is received. Think about that. Just under a minute to unleash a missile which would completely wipe out a city like Moscow. Trivia tip #2 – the fuel was manufactured by Aerojet corp, located a few miles from our old house in Folsom CA. This may not sound like a big deal, but until Titan missiles/rockets which required liquid oxygen, liquid hydrogen, or other chilled fuels that must be stored outside the rocket. The rocket could only be fueled immediately prior to launch in a process that might take as long as 45 minutes. Since a missile from the Soviet Union or China (the only two hostile countries that had ICBMs during the Titan period of history) only need 30 or 35 minutes of flight time, a traditional missile was at high risk of being destroyed in a first strike before it could be launched. Titan was the first missile that guaranteed we could get a shot off even if we were subject to a surprise first strike. Trivia tip #3 – chemicals used in the manufacturing of that fuel along with some of the fuel itself have contaminated a huge area around Aerojet and eventually led to the complete removal of a small town. Cleanup efforts may take over 200 years and as of 2006 over $300 million dollars had already been spent. 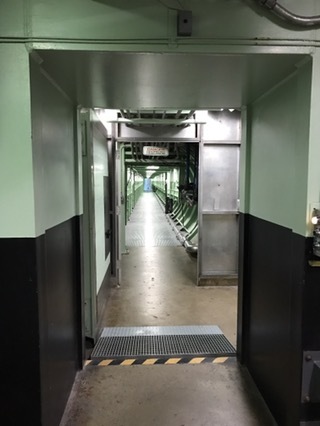 Long tunnels lead between the sections. The control room is exactly as it was when the missile was live. The entire room is suspended on giant springs designed to protect the electronics from the massive shock of a nearby nuclear blast. During the tour, one of the guests joins the guide in a simulated launch. All of the controls illuminate just as they would have in an actual launch. 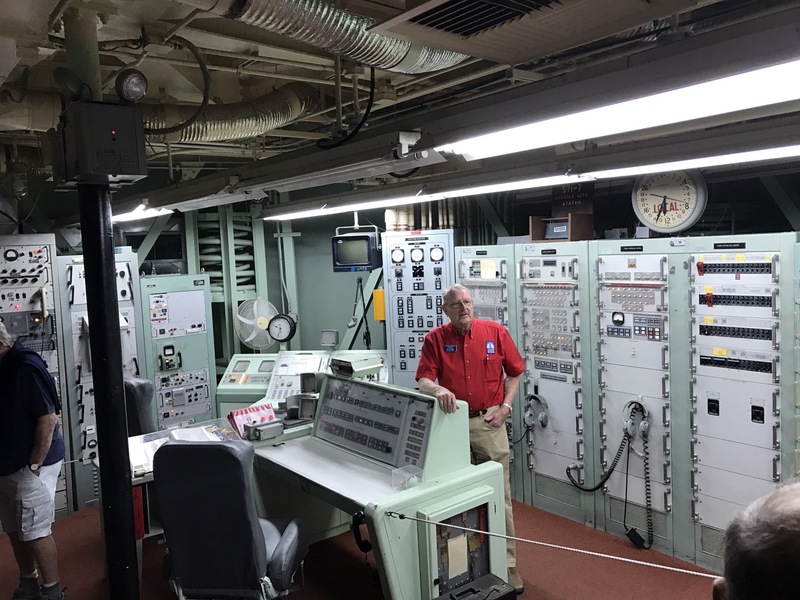 Even though the cold war is long over, it is a sobering experience to stand in the control room and watch the mock launch. Once the missile is launched there was no recall or abort. It would go to its target. Each Titan missile carried a single 9,000 Megaton thermonuclear warhead. 9,000 million tons of TNT. If that TNT was loaded on a freight train, the cars would reach from Tucson to Canada. 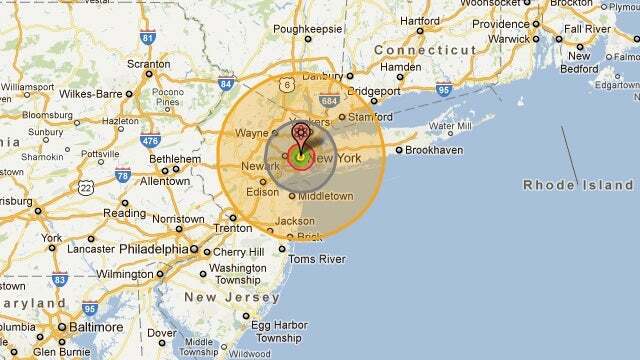 A 9 megaton explosion would erase any major city from the map, and cause serious devastation far from the epicenter. As a kid growing up in the late 1970s and 1980s, I was pretty sure this would happen someday. So it is nice to see the missile silo is now abandoned. 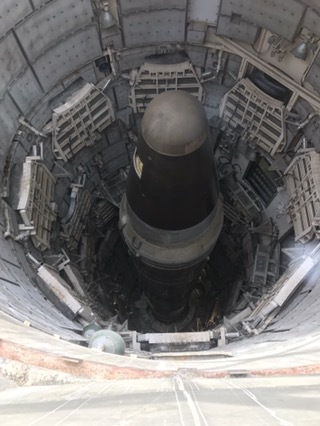 The silo still has a missile in it. The missile is obviously not ready to fire, but it is still impressive. 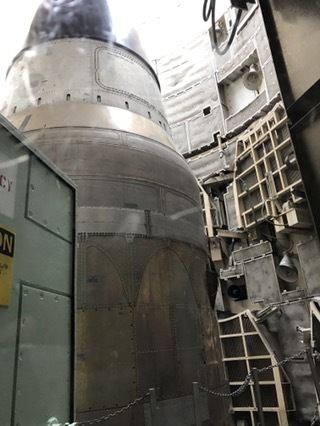 For you sci-fi fans, this is the silo used in the Star Trek Movie “First Contact.” Zephram Cochrane supposedly rides a Titan missile into space….and this is that Titan missile. The silo is 150 feet deep. Pretty amazing to see it from above with the blast door retracted. 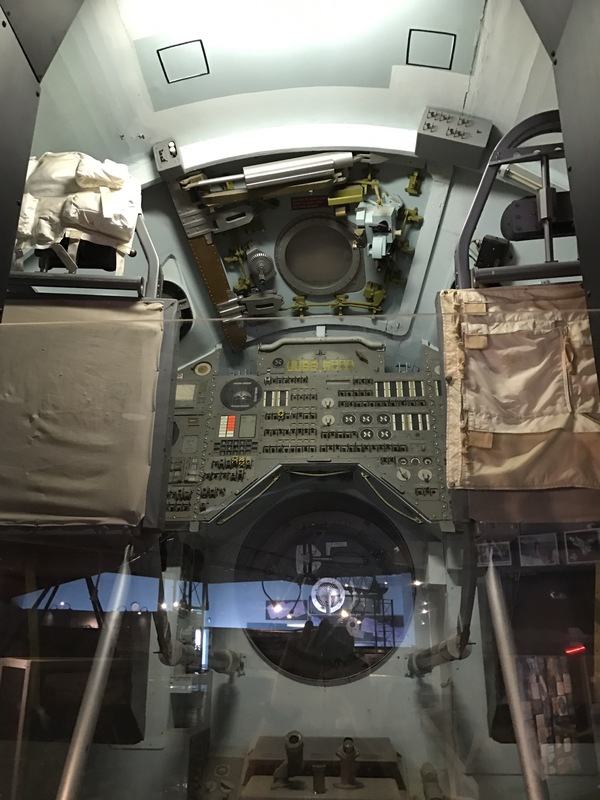 The little rectangular cutout on the left side of the warhead was put there to prove to the Soviets that this missile was decommissioned as part of our arms reduction treaty. The silo is full of sound deadening tiles designed to keep the thunderous noise from the rocket engines from shaking the missle apart before it leaves the tube. Its two rocket motors provide more power than 2 747s at full throttle. That’s a lot of power! I highly recommend the Pima Air and Space Museum and the Titan silo. It is very unusual to be able to tour an actual missile silo and this one is in excellent condition. Fortunately for all of us it was never used and is therefore on display. We didn’t have enough time to see the rest of Tucson, particularly the Old Tucson area where many westerns are filmed, the Biodome area, and some of the interesting old cathedrals. If you are planning a trip, I think at least 4 days would be necessary to see the highlights. More if you plan to wash your MoHo (because you can) or hang out by the pool. 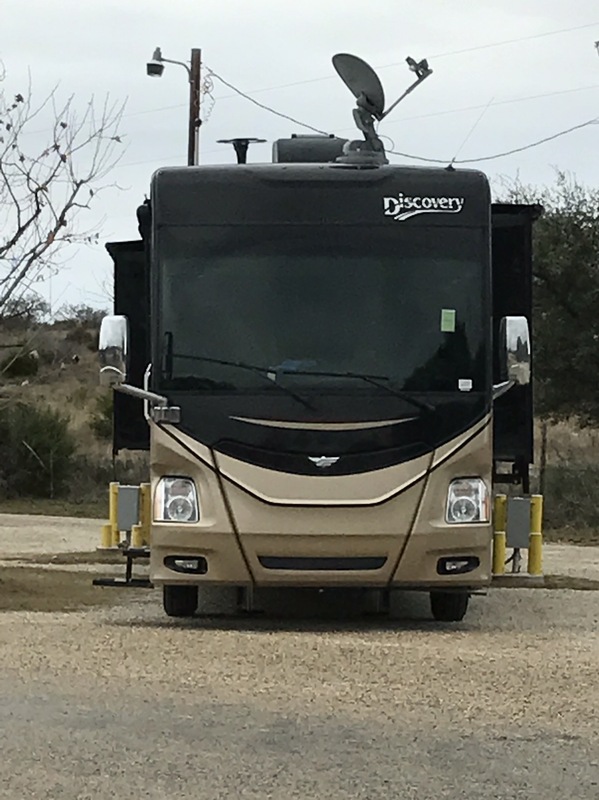 Hacienda RV Resort hosts a lot of one-day visitors by virtue of its location halfway between DFW or San Antonio and Phoenix. 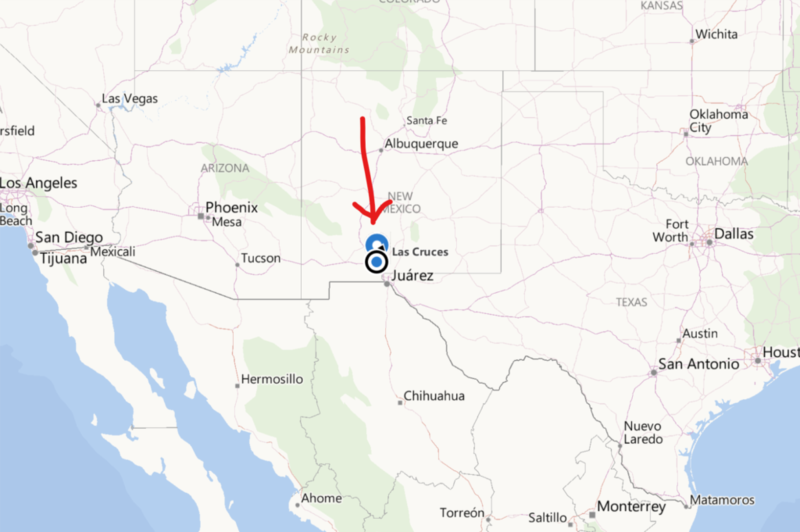 More specifically, Las Cruces is one of the only decent places between Fort Stockton and Tucson that is right on I-10. To its credit, Hacienda does not just coast on its location and is a very nice campground (except for the WiFi which is totally unusable). Yesterday, as the sun was starting to set, a Bounder pulling a CRV turned up (down?) our little street. The driver paused for what seemed like 5 minutes (but was probably only 2 minutes), completely blocking the road as he tried to understand how the universe decided to angle itself against him. Eventually, he moved forward. Realizing he simply needed to circle the campground a few rows and then come in the right way? Wrong. Instead of doing that, he came back in the wrong way (again), this time from the opposite direction and cut the corner really hard! It was possible to get into the spot from the wrong direction if he came in that way. Well, except for pulling his toad over the curb you see in the middle of the photo. But that wasn’t the most eye-opening part. You see, the sites sit about 6 inches above the road and getting to them means driving up and over the curb. Well, this guy hit the curb – at an angle no less – so fast he might actually have caught air! His Bounder rocked back and forth so hard going over that curb that every cabinet inside surely must have popped open and flung its contents all over the floor! It was like watching a cargo plane make an emergency landing in bad weather! The next morning around 10:00am, he prepared to leave. It must have taken him all night to repack his cabinets. A series of questionable jockeying maneuvers began. After a nearly endless symphony of backing up, pulling forward, backing up, pulling forward, he was finally ready to go. He put his rig in gear one final time and pulled forward. The campground filled with a loud gravel dragging noise. Followed by a sickening scabbering sound that moved behind us. Did he hit something and was he dragging it along behind him? 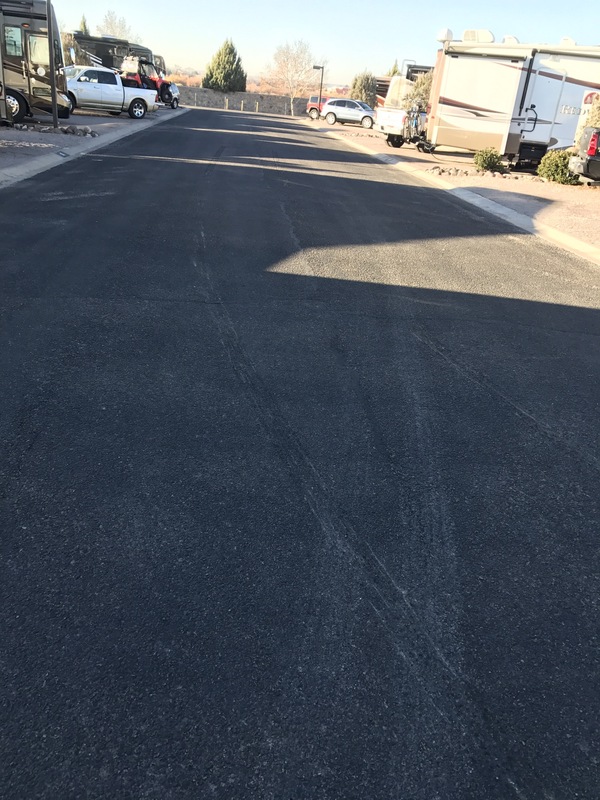 I looked out the window in disbelief as I saw two deep drag marks in the gravel of his site. It seems like such a minor detail…neutral. Its a soft word…neutral. A harmless word….neutral. But it turns out the fricken’ wheels don’t rotate unless the transmission is in neutral!!! He dragged that poor Honda CRV all the way of the site and at least 50 feet down the road before he realized something was wrong. His locked CRV tires actually left drag marks IN THE ASPHALT. It was a reminder that even if you can park a Bounder like you are landing on the deck of an aircraft carrier at sea, you still need your checklist. Author bryanPosted on January 8, 2017 January 8, 2017 Leave a comment on Checklist people! Checklist! There can be no question we are headed west. As they say “Dallas is where the East ends; Fort Worth is where the West begins.” That is probably about right. Although we went due South from DFW to Waco and then Austin before turning west. Hill country in Texas is definitely not “the South” like we have been used to, but its also not the desolate western landscape that we encountered west of Kerrville. I would have to say that for us Kerrville is really the border area. 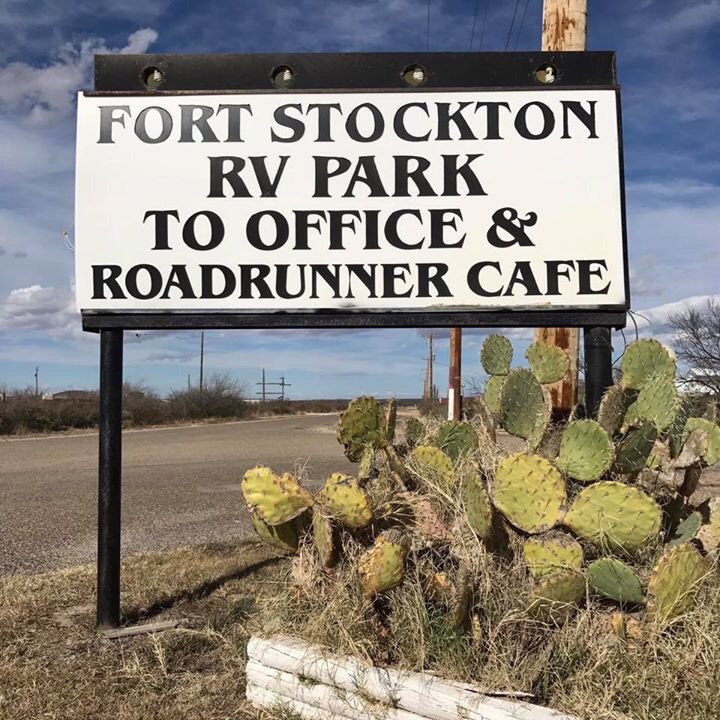 We stayed at Fort Stockton on our way out East and knew what to expect. It is a former KOA that the owners have really invested and improved. Sites are reasonably wide, flat, and pull through. WiFi worked, but was slow. I’ll settle for that. 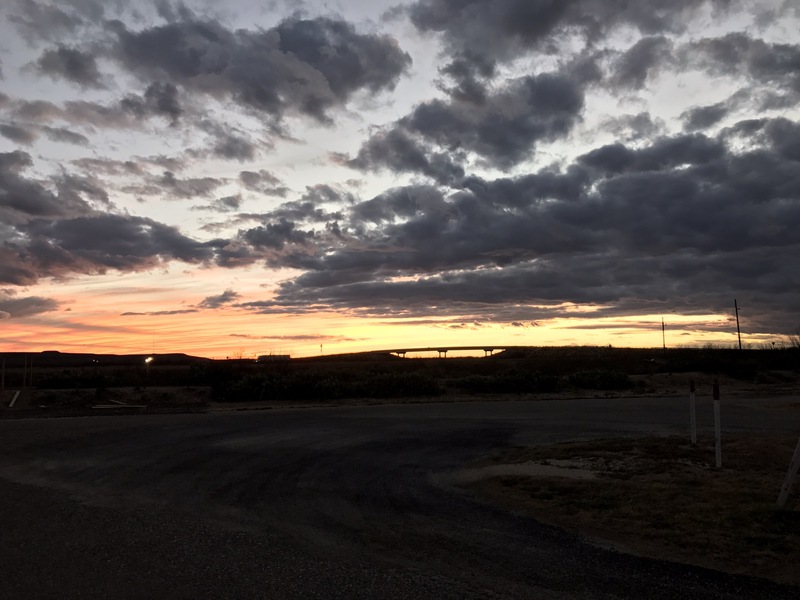 This campground is located along I-10 and it is midway between Kerrville and Las Cruces. That means most guests are one-nighter’s travelling along I-10. We saw perhaps 30 RVs and towables pull in and then leave again the next morning. It also happened to be where we would spend New Year’s Eve. One of the big perks is that the campground has its own cafe – the Roadrunner Cafe. Food is far more delicious than one might expect from its humble location. They source their meat and eggs from local suppliers. Chicken fried steak, which they say is in the top 10 in all of Texas, is hand breaded on site. I wouldn’t disagree with that rank either, it is actually the best chicken fried steak I have had in Texas. Most places claim to offer “home cooking” but the Roadrunner really does! 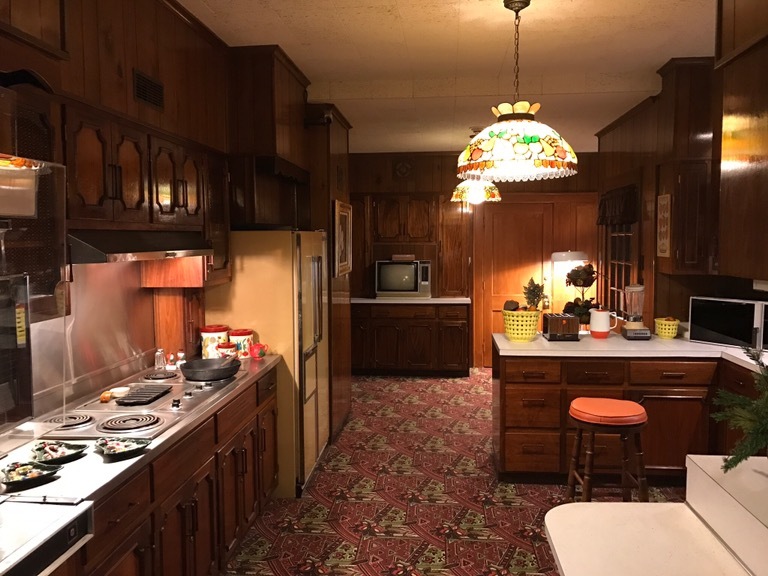 It is like eating in your grandmother’s kitchen! We were pleased to see the cafe was going to open at 5:30pm on New Year’s night for supper so we cleaned up and made our way over there. It did not disappoint. If anything it was even better than last time! The price is reasonable at around $30/night – mostly because this part of Texas is not a tourist destination. In fact, its mighty desolate. We walked down to the end of the road and found that it is, quite literally, the end of the road. After supper, we watched the West Texas sunset. There weren’t any fireworks, but this was better than fireworks! Plus, with the time change we have a fighting chance of staying up to watch the ball drop in NYC! We did make it up to 11pm, which was Midnight in New York. Like the rest of the country, we saw Mariah Carey have a total meltdown live. That alone was worth staying up for. 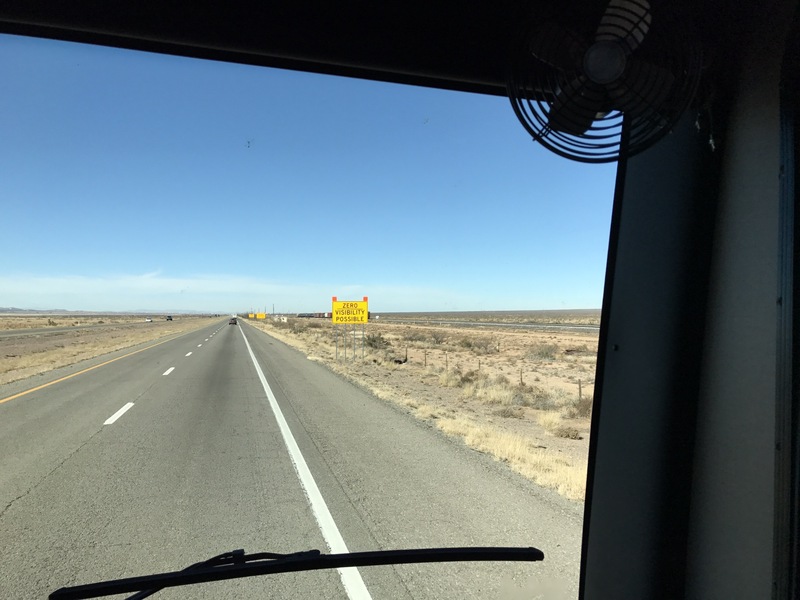 The next day we left Fort Stockton and headed west toward El Paso and Las Cruces. I was reminded that we are back in that wasteland we saw last driving from Carlsbad NM to Pecos. The terrain is flat and featureless except for the flaring of unwanted natural gas from oil wells. Seems like such a waste. Not sure this was the most auspicious first day of 2017, but hey, what are ya gonna do! 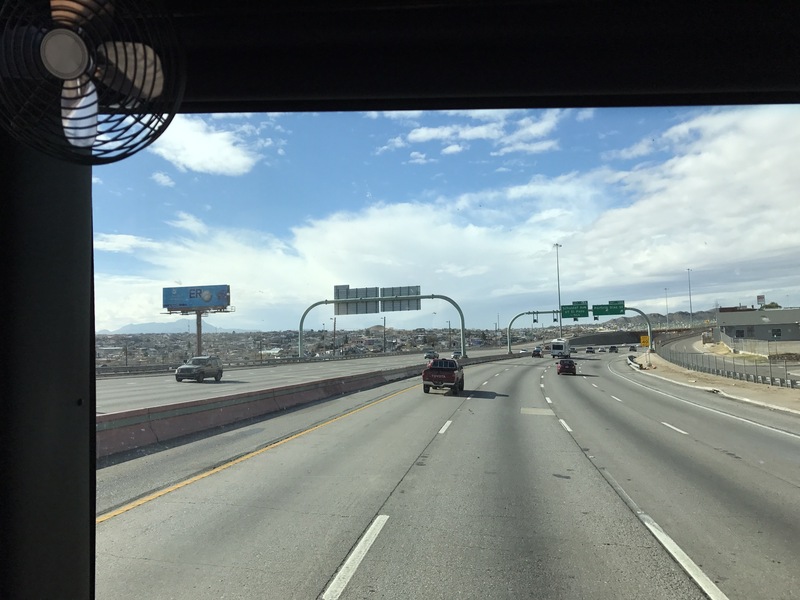 We had been told that traffic in El Paso can be very heavy and that a nice outer ring road would take us safely around the edge of the city. We thought seriously about taking that bypass but then decided that since it was a Sunday traffic might be lighter than usual. Plus, I-10 literally meets the border with Mexico and we wanted to see Mexico. Traffic wasn’t bad, and sure enough the road does literally parallel the border. In this photo, El Paso is on the right side of the highway and Ciudad Juarez is the city on the left side of the freeway. In another few years, this view might be blocked by “the wall.” The border is clearly visible but today is only a chain link fence. 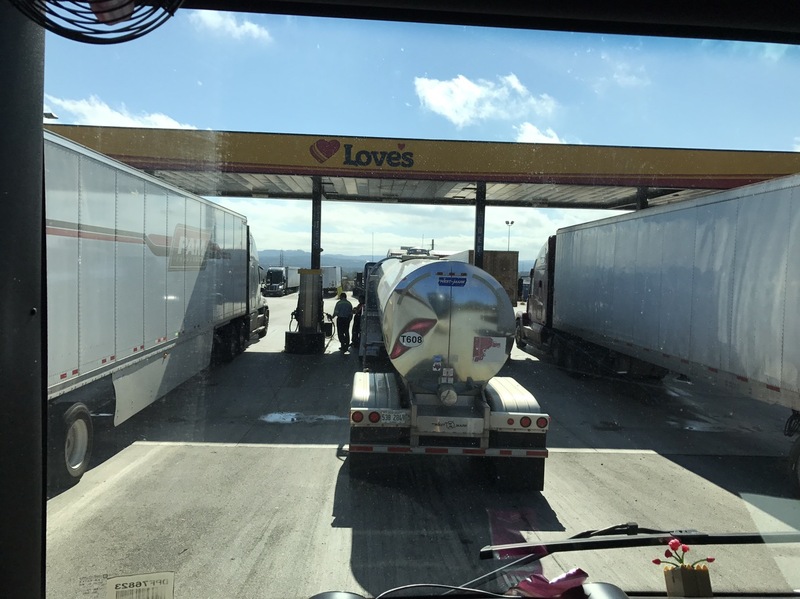 We had decided to let our fuel run a bit low and we planned to fill at the Flying J right at the New Mexico border. Our Low Fuel warning light came on about 8 miles before that stop. It is the first time we’ve seen the warning. 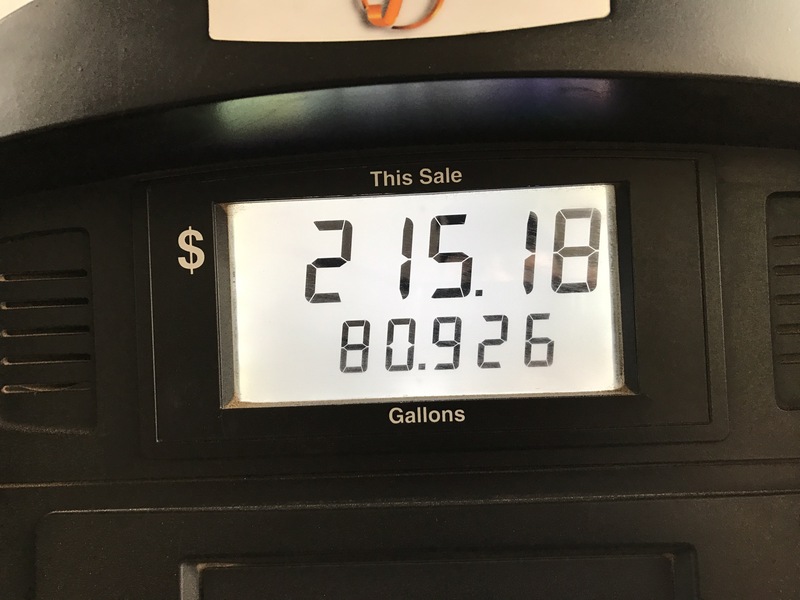 I was very curious about how many gallons would be left in the tank when that light came on. We pulled into the Flying J and it is the first time in 9 months we have seen trucker pumps that were not fully occupied! Several of them were completely open! Cool! I put the nozzle in the tank and Heather went inside to authorize the credit card. Fuel started pumping. I was afraid we would take 90 gallons or more but the pump clicked off at 80. I managed to put another 0.9 gallons in but that was it. So…subtracting the 1 gallon we used after the low fuel light came on, we took 80 gallons. We have a 100 gallon fuel tank. Good to know that when the low fuel light comes on we still have 20 gallons of fuel left. Still, that’s a hefty fuel bill! A trucker at the Flying J who was driving east warned me there was a terrible storm just a few miles West. He said he had just driven through it and it was pretty bad. The clouds toward Las Cruces looked ominous but we were so close (20 miles) we continued on. Sure enough, a few miles west and the bottom fell out of the sky. Lightning flashed all around us. Visibility was so poor at a couple of points everyone slowed down to about 20 mph because we just couldn’t see the road! Fortunately, we only had 10 or so miles to go and before we pulled into the campground. We checked in and then pulled into our spot, but we didn’t hookup for another hour until the rain passed. 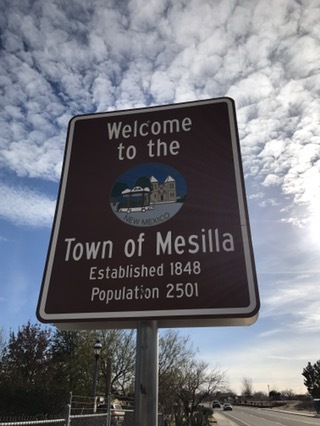 The campground is next to historic Mesilla, which used to be the capitol of New Mexico and Arizona. 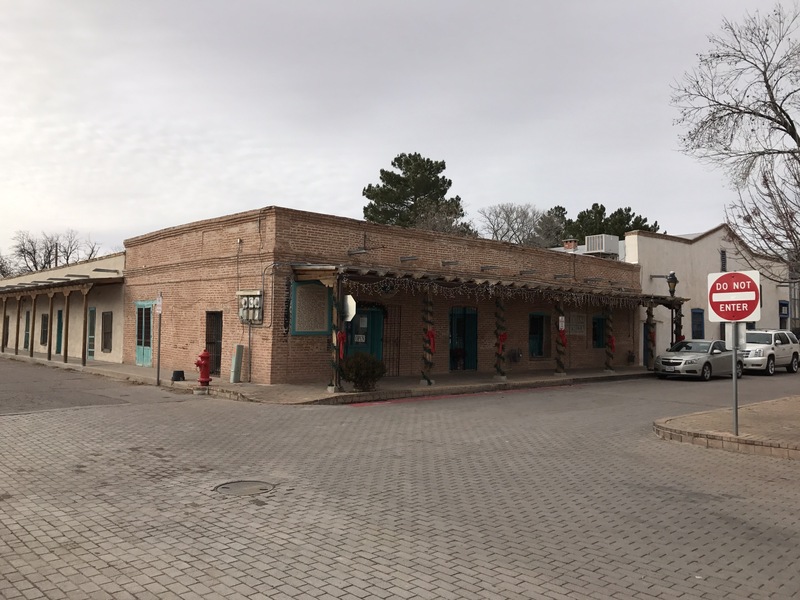 The oldest brick building in New Mexico is here. The original owner and builder was from France. He setup his own brick kiln to make the bricks. It took him nearly 2 years to finish the building. Not long after, he was killed by bandits who broke in. The new owner had it less than six months before he too was killed by bandits. Presumably not the same bandits. The third owner died less than a month after taking possession. I believe of a heart attack, but wouldn’t bet against bandits. At this point, I’m thinking the 4th owner had some second thoughts about the luck of the place. But, he broke the streak and owned the place for something like 40 years. There is some interesting old architecture to look at but Mesilla does not live up to the hype. Of any kind. Shopping is mostly of the T-Shirt and Indian pottery variety, restaurants are not especially impressive, and there isn’t much to see. 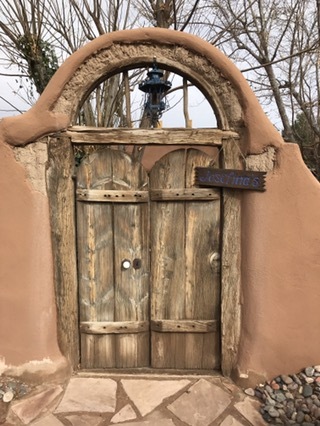 Santa Fe is far more interesting. Speaking of Santa Fe, we planned to drive up for a couple of days to see my dad. The freezing temperatures and forecast snow meant we would leave the MoHo in Las Cruces and drive the Jeep up I-25. We haven’t left the MoHo since we moved in almost a year ago!! 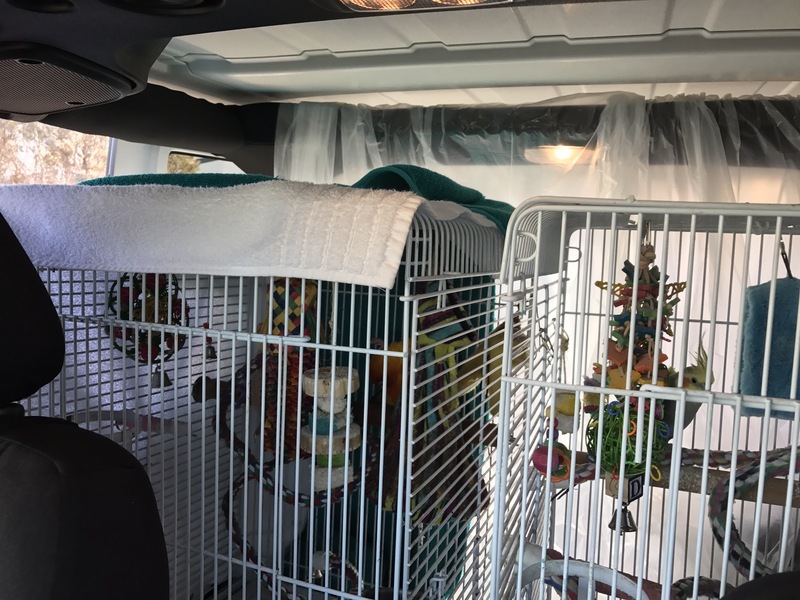 We also haven’t moved the birds except once in Albuquerque for service and a few weeks ago in Alvarado for service. And that only meant carrying them from the MoHo into the waiting room at the service center. 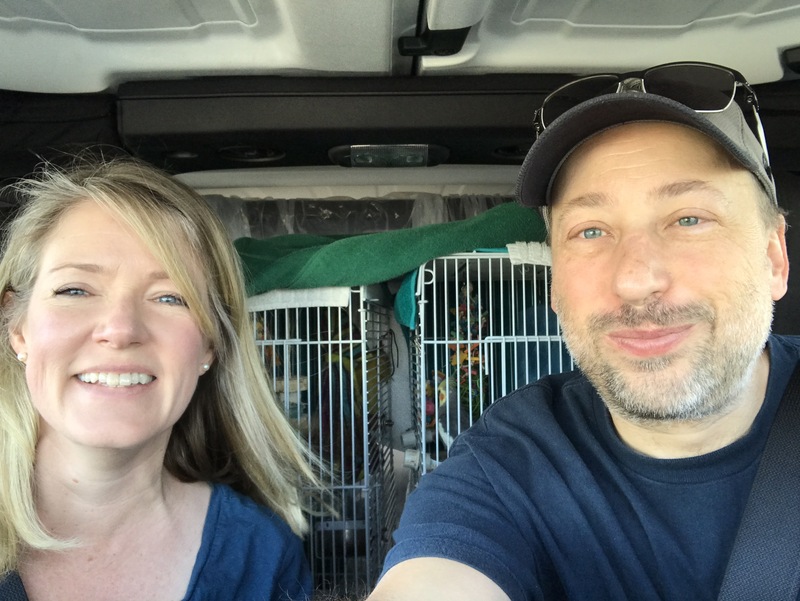 We were nervous about taking them in the Jeep, both because we were concerned about keeping them warm enough (the Jeep has no backseat heater) and because they make such a big mess. We decided to get a plastic painting dropcloth. 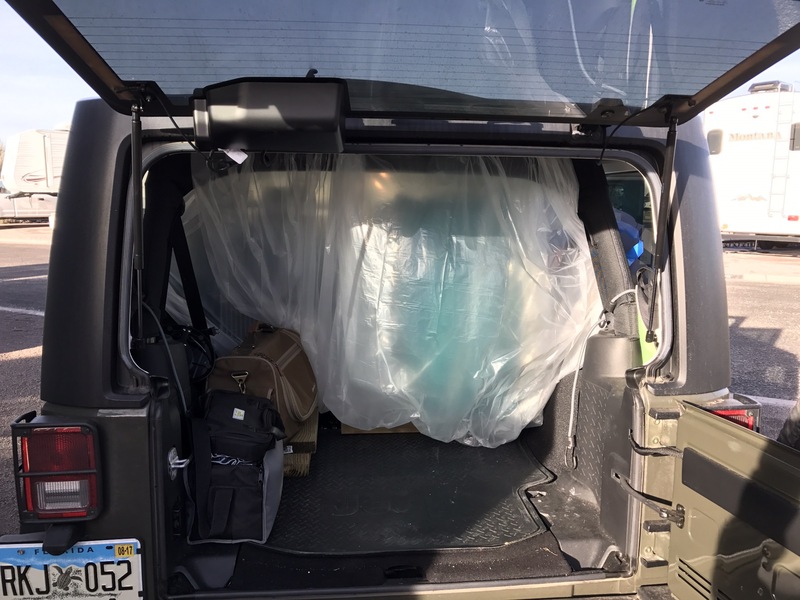 Using the rollbar, we made a makeshift plastic bubble. 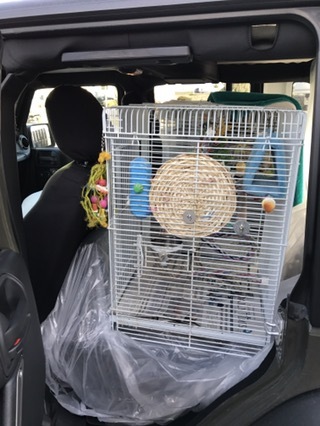 We put the birds into the makeshift plastic bubble and then covered the back and top of their cages with their towels. With the dash heater blowing between the front seats, they seemed to be warm enough. The didn’t sqwak much on the trip and did just fine. I think they like being with their people. Plus they eventually realized they weren’t going to the vet or to get their wings clipped. Memo to non-bird owners: clipping wings means trimming wing feathers and is as painful as a haircut. Which is to say not painful at all. They just don’t like being touched. 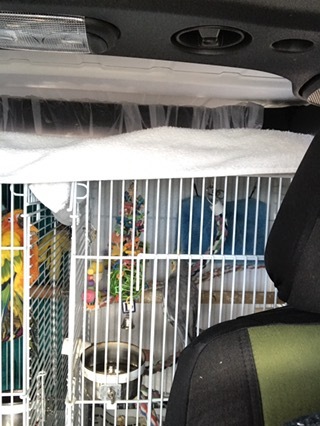 After a few hours, between the warm air and the rocking of the Jeep the parrot even dozed off. Its kind of hard to see in the picture but he’s totally dozing. 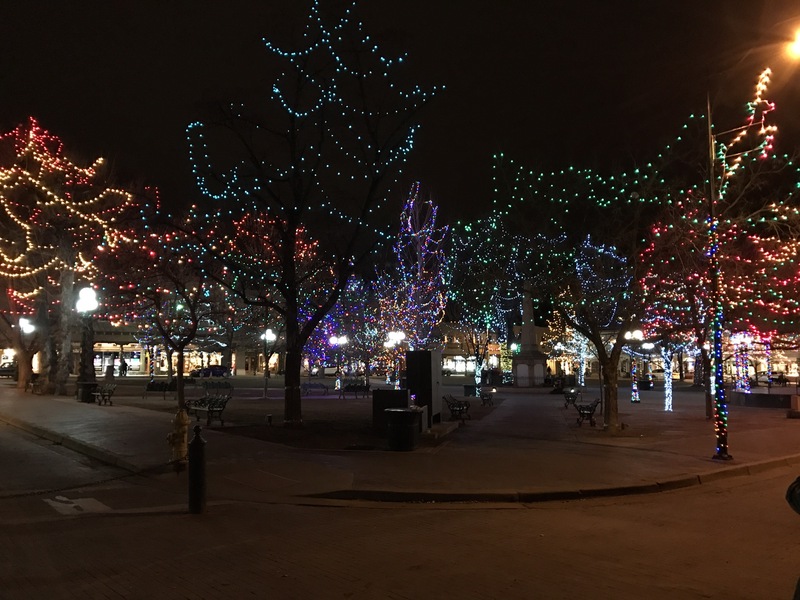 Even though it was after New Year, Santa Fe was still decorated for Christmas. Lights were up in the main plaza and it was very pretty. We walked around the downtown area. There were more homeless people than tourists. Especially after the sun went down. We had supper down here and on the walk back to the car a homeless guy wanted our leftover food containers – he actually yelled at us from across the street! After a nice, but too short visit, we headed back to Las Cruces right ahead of a forecast storm. Winds were savage and I’m sure glad we were in the Jeep and not the MoHo. Wind gusts blew the Jeep all over the road. We would frequently see signs warning of the severe winds and several spots have wind socks helping show just how windy that spot is. 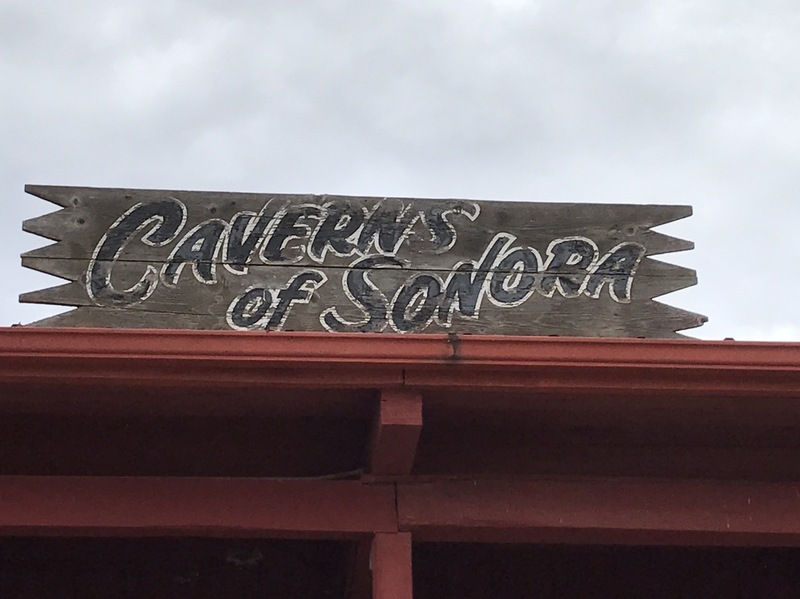 Fellow traveler and good friend Sean Burke mentioned a great stop he made at Caverns of Sonora on his way back West so when we had the chance to stop, we took it! Plus, there aren’t many places to stop between Kerrville and Las Cruces NM. 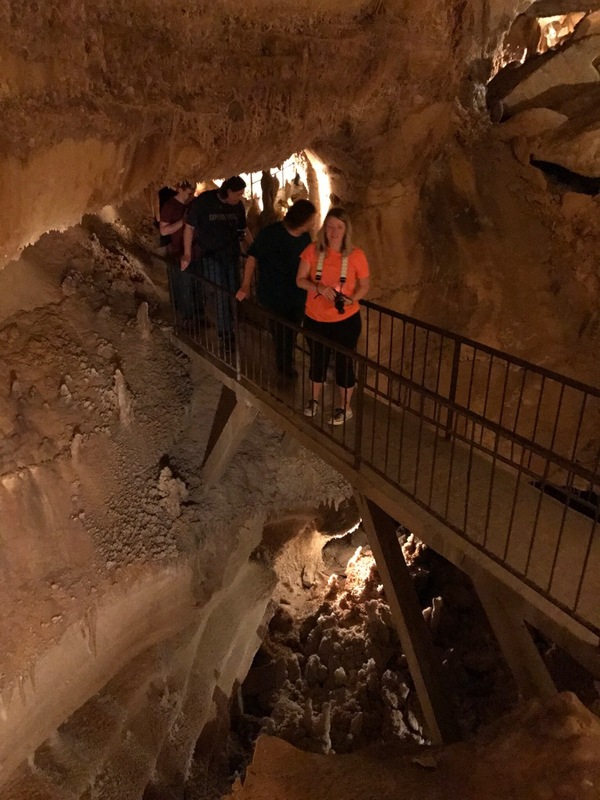 Caverns of Sonora is about 11 miles off Interstate 10. The road is not bad at all, even for a MoHo our size. We normally don’t plan to do much on arrival day since we don’t know exactly when we will arrive and be all setup. So we booked 2 nights here, giving us a full day to check out the area. We checked in and when we asked for 2 nights, the guy working the counter said “Oh, you guys are staying a long time.” I thought he was kidding, but apparently nobody ever stays more than one night here. He said we would need one of their “pull-through” sites. When I saw the site, I started to realize why nobody stays more than one night. Not because there are no sewer hookups…we expected that. They have to protect the caverns from any impurities and the cave is shallow. What surprised me was the width of the sites. These are the narrowest sites I have ever seen! We couldn’t even put out our larger slides. Our large slides are 3 feet. We put out our short slides (2 feet) and called it good. Even then, we’re basically hanging out over the hookups. A travel trailer pulled in next to us – no slides – and I could have reached out our window and touched the side of their trailer. 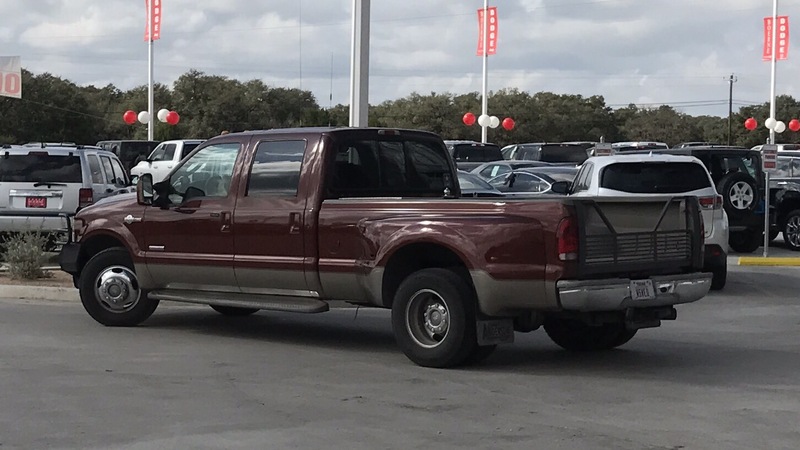 They couldn’t even open their side door fully. Still, the site was level, power was strong, and our dish worked. No AT&T though. No signal at all. Fortunately our Verizon hotspot worked fairly well. Which makes this not the worst place we’ve stayed! Inside the office was a neat sign with distances to varous places. 869 miles to Los Angeles. 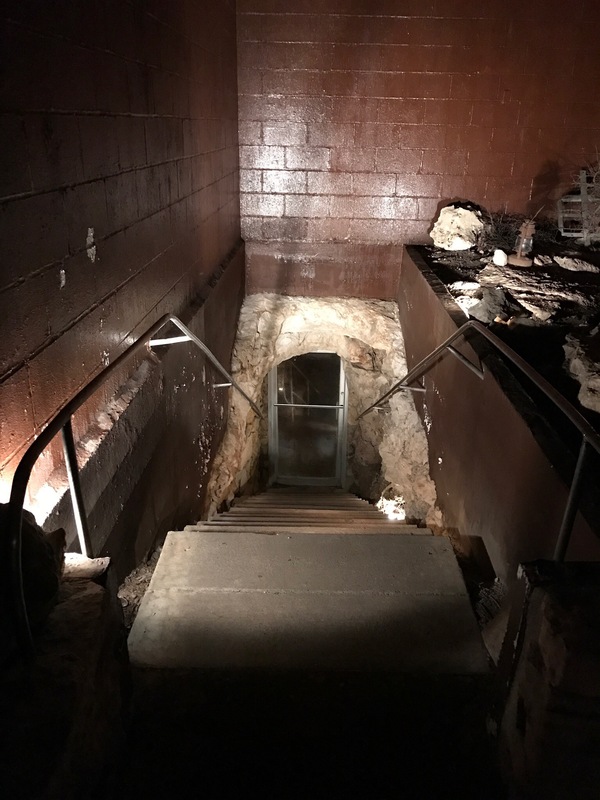 The entrance to the cave is inside a small cinderblock building which was built to house the new man-made entrance blasted out in the 1960s. The original entrance is about five feet to the right of this manmade entrance. The original entrance is a small hole not much larger than a manhole and not suitable at all for tours. Signs all over the gift shop/registration area …and our tour guide…had warned us the cave is warm. Temperatures are steady 70 degrees and 98 percent humidity all year round. Jackets are verboten. We knew this, and dressed accordingly. 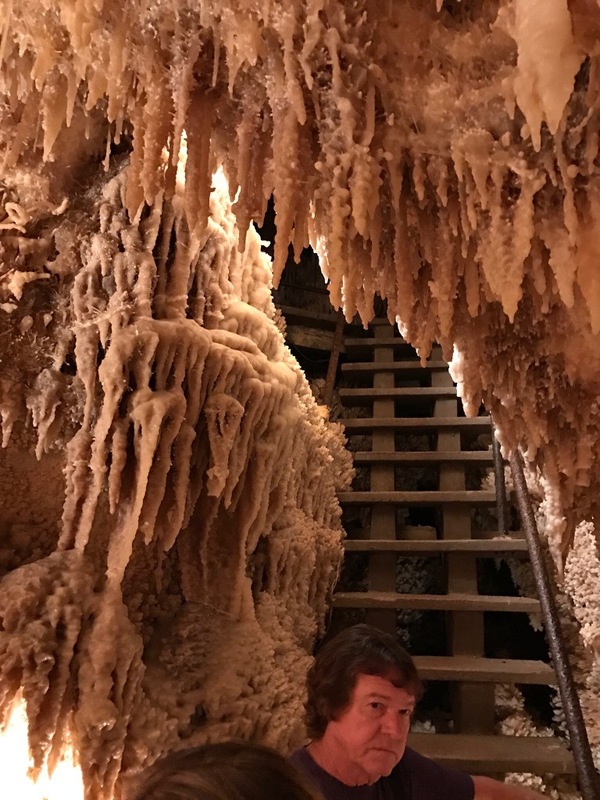 Even so, I expected a cold blast of cave air as soon as we walked through that door. Instead, it is perfectly pleasant t-shirt temperature! 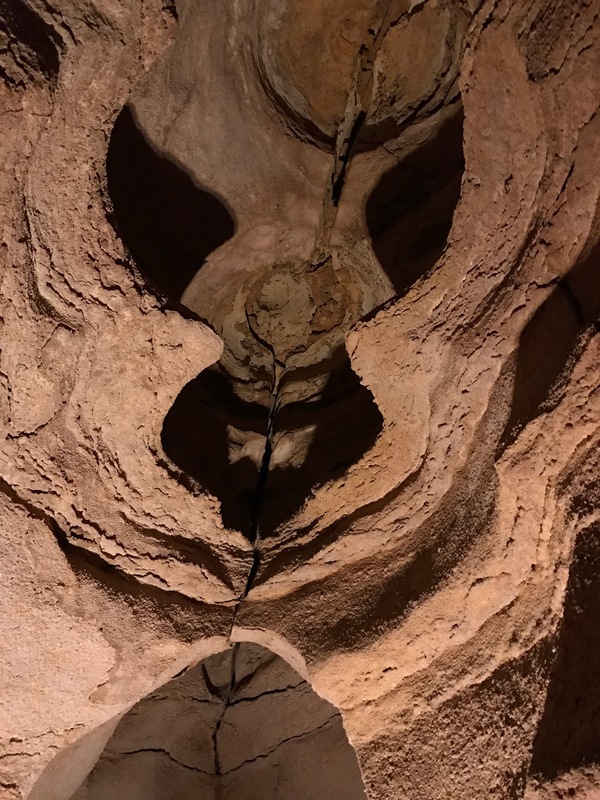 Very near the entrance is a formation that looks like a face in the ceiling. 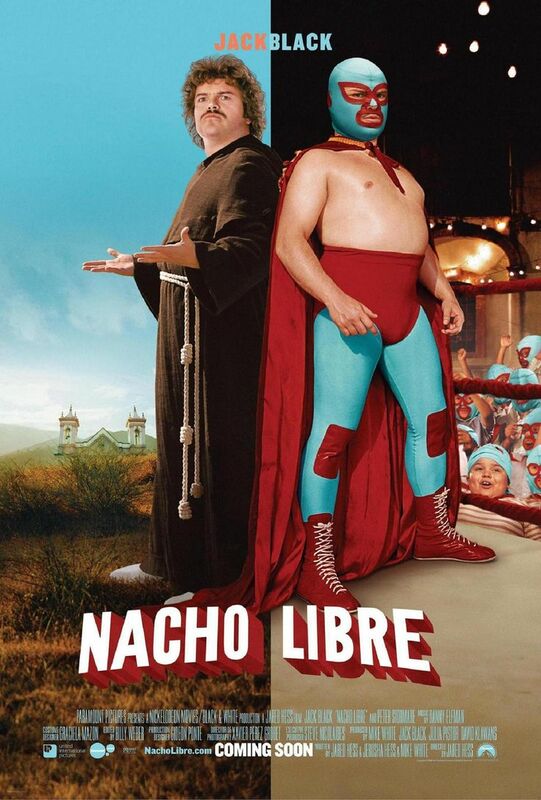 The face looked strangely familiar…. 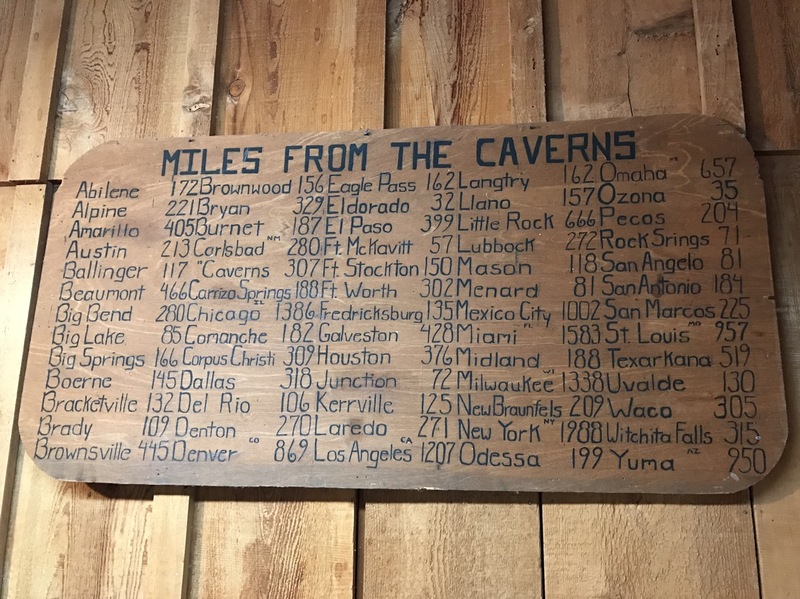 Sonora Caverns has over 7 miles of mapped passageways. The tour covers about 2 miles of these passages. The tour is wonderful! 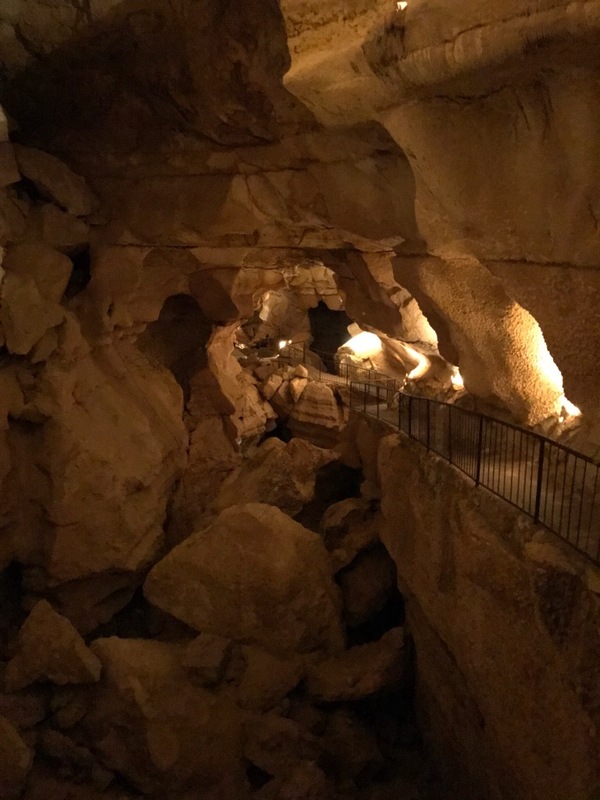 The cave is very “improved” meaning all of the paths are paved and railings have been built everywhere there is a risk of falling. Lighting is very well done too. It took a little more than two hours and that was the perfect amount of time. The upper part of the cave has been dry for many years and is fairly plain looking. The walls are smooth and mostly featureless. 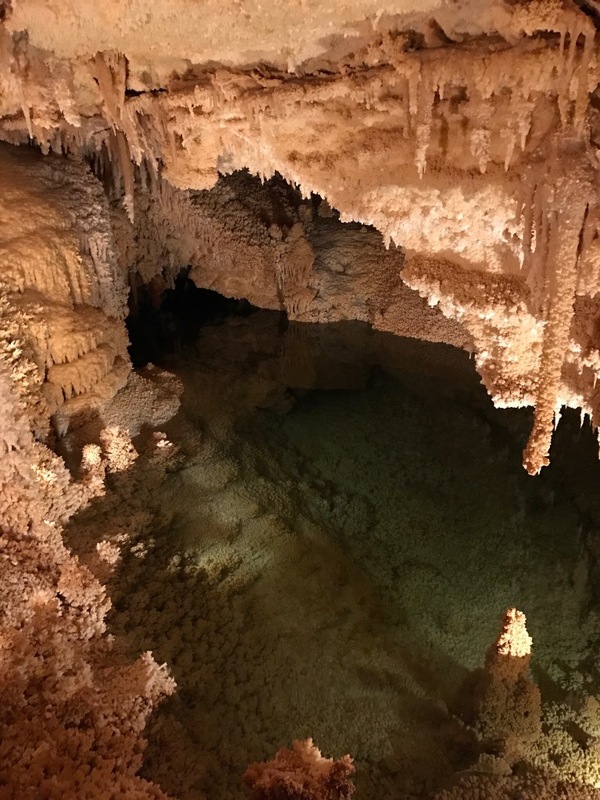 The cave formed along a fault line which allowed hydrogen sulfide gas from below to mix with water from above creating a sulfuric acid solution which dissolved the limestone around the fault line. 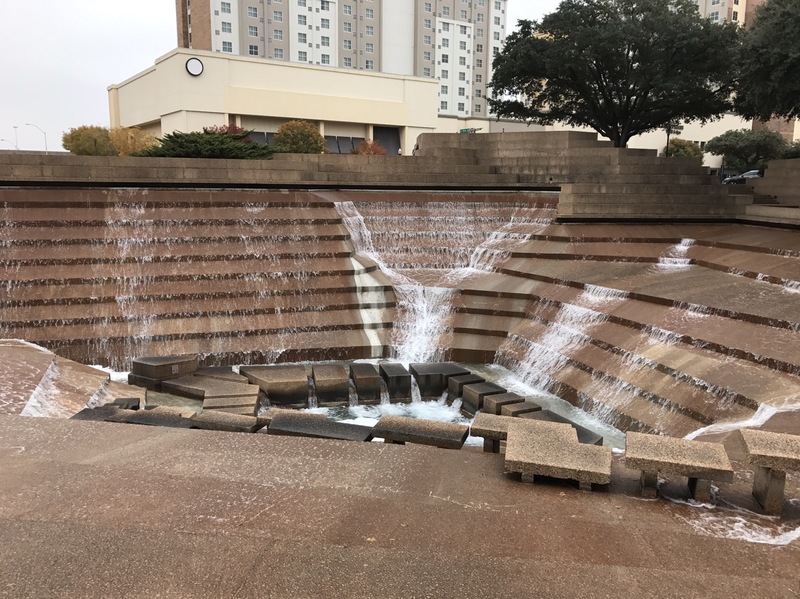 Water levels fell and the cave drained. 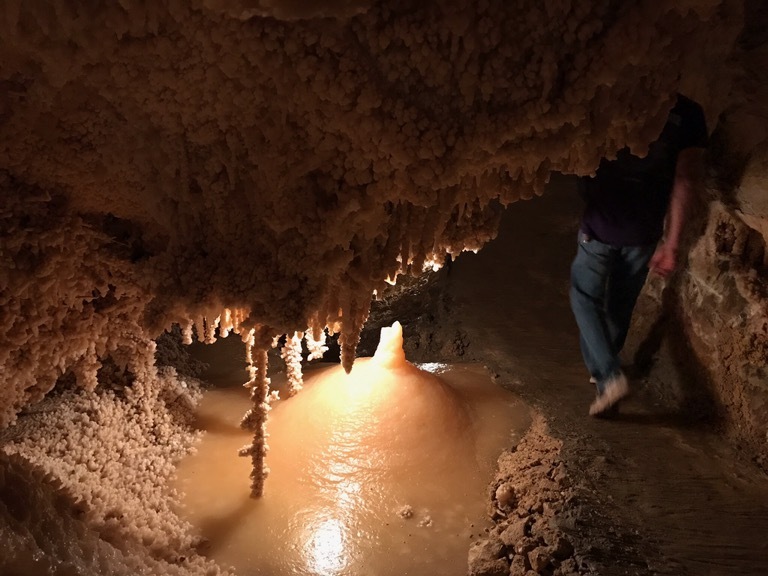 Water percolating down from above then began depositing minerals to form the speleothems. The upper part of the cave stayed dry so it didn’t develop the ornate formations which we saw further down. 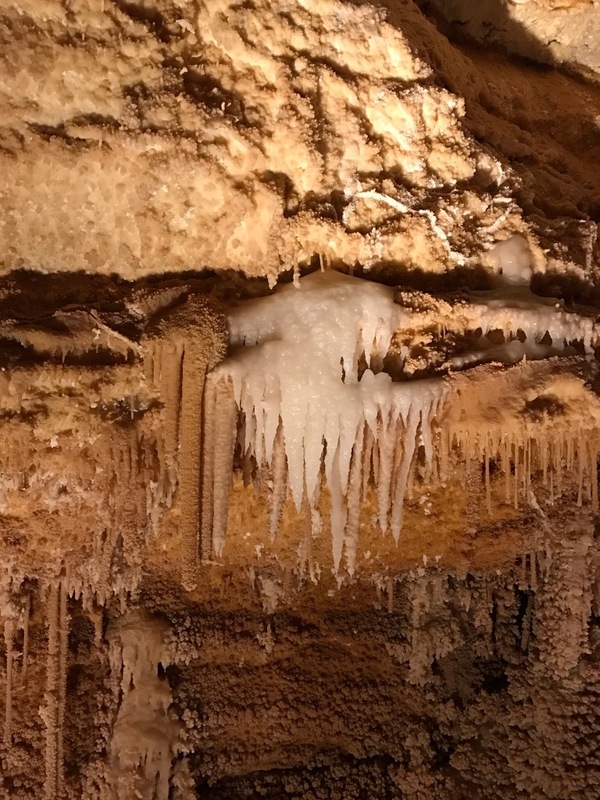 Sonora Caverns is known as a “show cave” meaning it is especially decorated. Carlsbad amazes because of it sheer size and grandeur. Sonora dazzles with its intimate decoration. Formations are so close to the trail that we often had to duck or turn to avoid hitting them! Sonora’s particular claim to fame are its incredible calcite crystal formations. Particularly a formation called a helictite which is a crystal that grows in various directions (not just up or down with gravity). These delicate formation cover entire rooms! 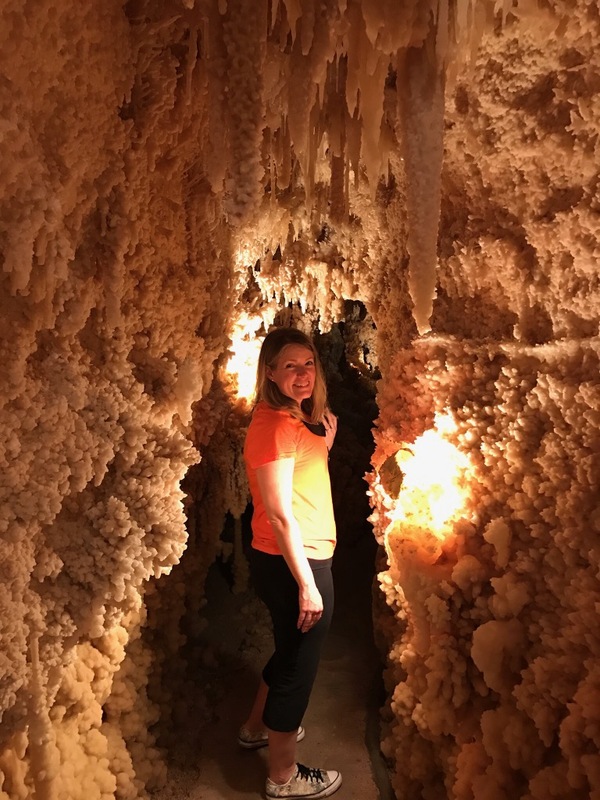 One room – the entire room – is a geode. 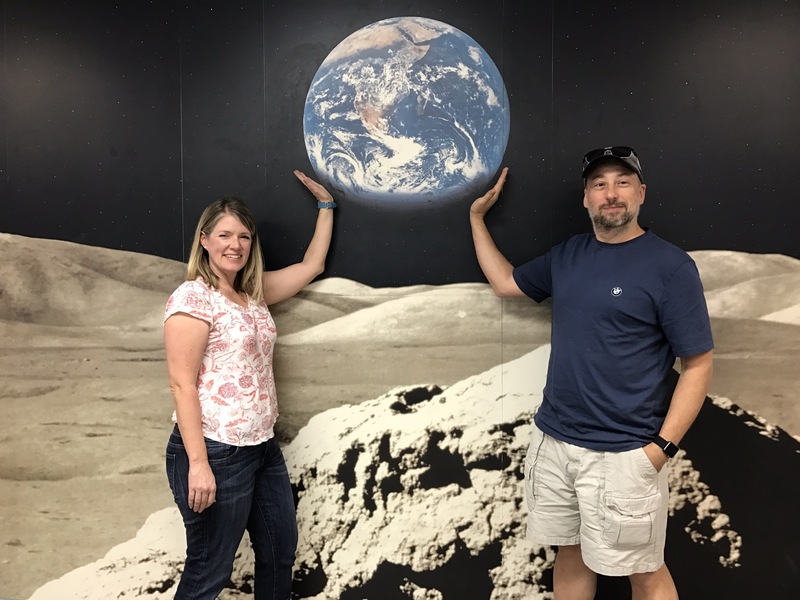 Like those little geodes you see in gift shops….only this one is so big we stood in it! You can see where the water line was in this room for hundreds of thousands of years. The splendor in some of these rooms and passages just defies any explanation. This room was full of formations they were calling “cave coral” and it really does look like coral. Even though the tour is paved and has stairs, it feels very sporty! Pathways are often narrow or winding. 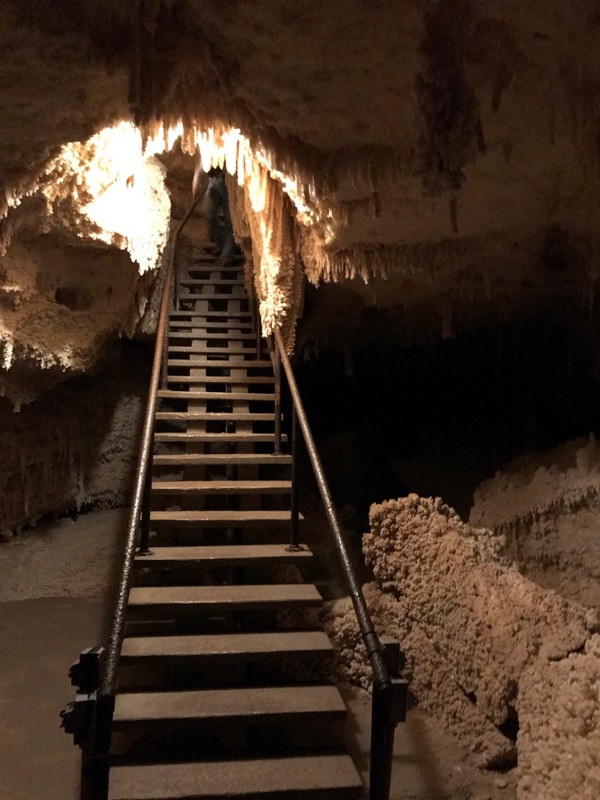 These stairs went right up past massive formations to a chamber above. Another part of the trail crossed a big room that dropped about 75 feet to the jagged floor below. 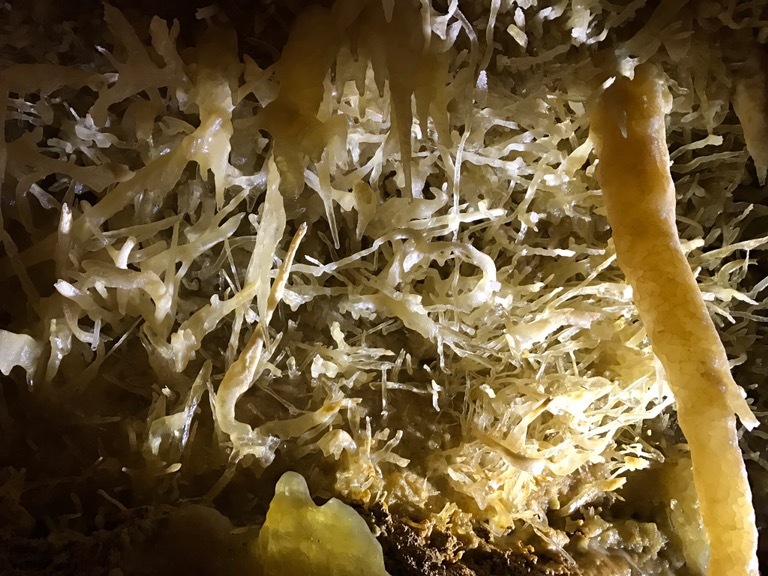 Sonora Caverns is not only known for its helictites, it is one of the only places in the world where fin-type helictites can be found. This one looked like a fishtail and was growing about 8 inches away from the wall. A formation of flowstone near the trail looked like it was a brown slurpee but was in fact hard as a rock. The lower part of the cave is very wet and very much alive. Pools like this one (called Horseshoe Lake)can be found in many places. 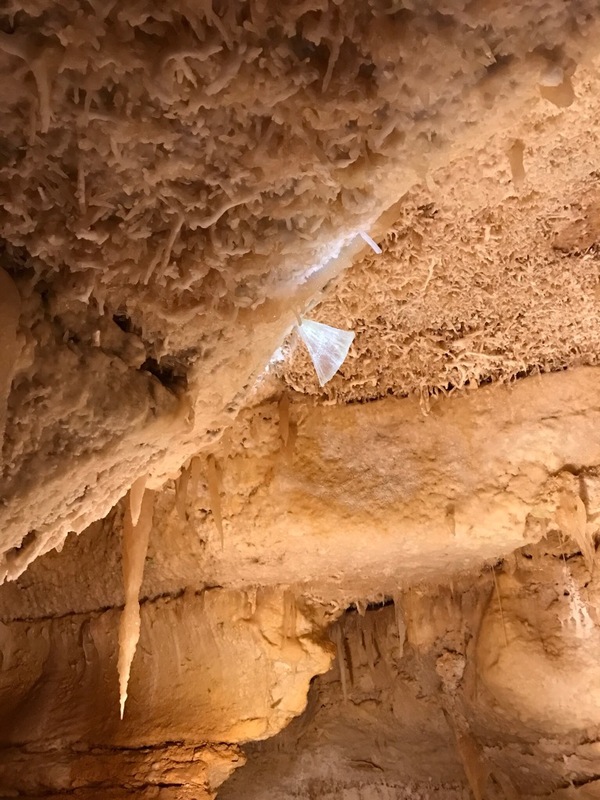 Horseshoe Lake is in an area called “the lower room” and in addition to being one of the lowest spots in the cave, it has a high C02 concentration. 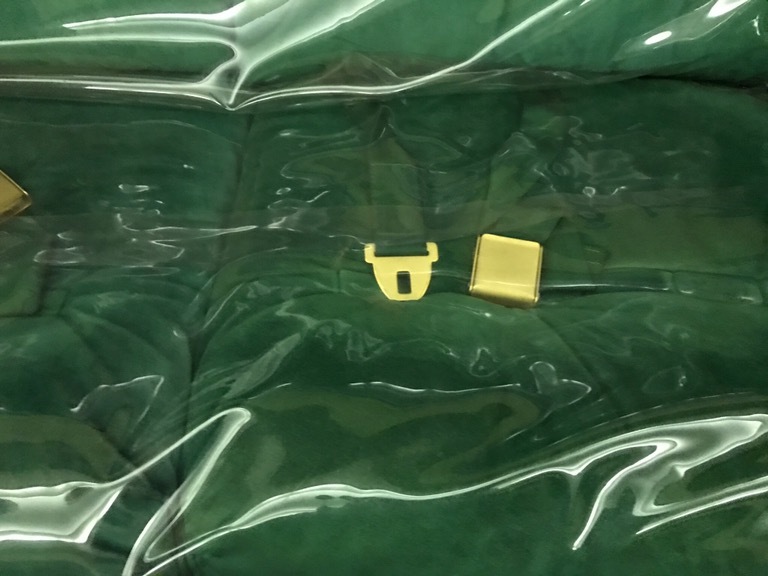 9000 parts per million. Normal atmospheric air is around 400 ppm. Even though there is plenty of oxygen here in the cave, this elevated C02 makes it feel like 7,000 feet of elevation. 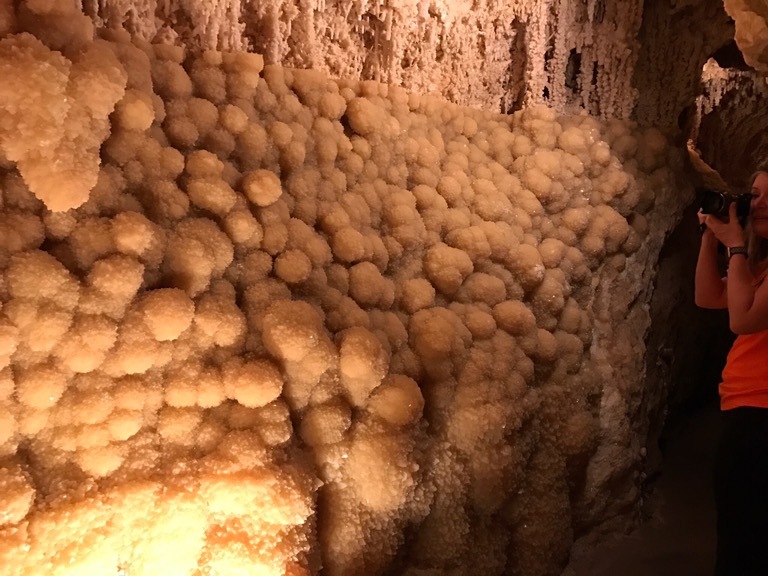 Another room known as the Ice Room has a number of formations that look just like water ice. Complete with a semi-transparent quality. It was hard to capture the pure white color but I have never seen formations like these. We wrapped up our tour and returned to the surface. There isn’t anything else to do here, but we enjoyed watching the herd of deer that live on site. They walked right in front of our MoHo. We had intended to spend Christmas in the heart of Texas Hill Country with a stop in Austin along the way. 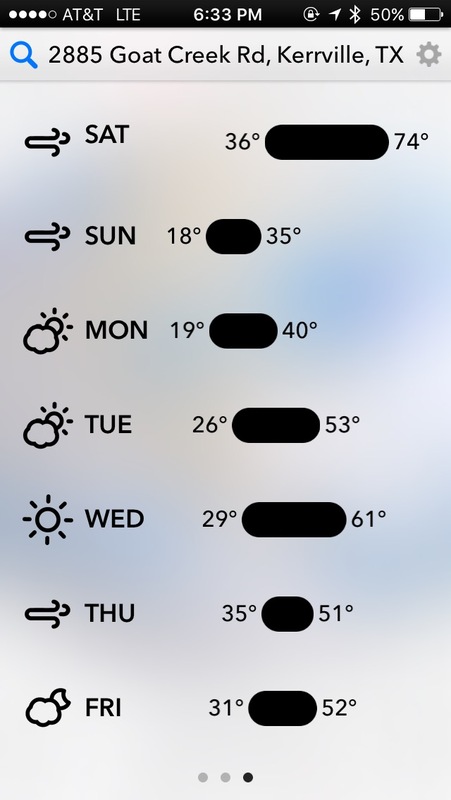 Unfortunately, our plans to spend a few days in Austin were cut short by the upcoming cold weather. So we drove from Alvarado to Austin where we spent just one night – a mere 18 hours – before driving on to Kerrville. The drive from Alvarado to Austin was one of the worst we have encountered on the trip. 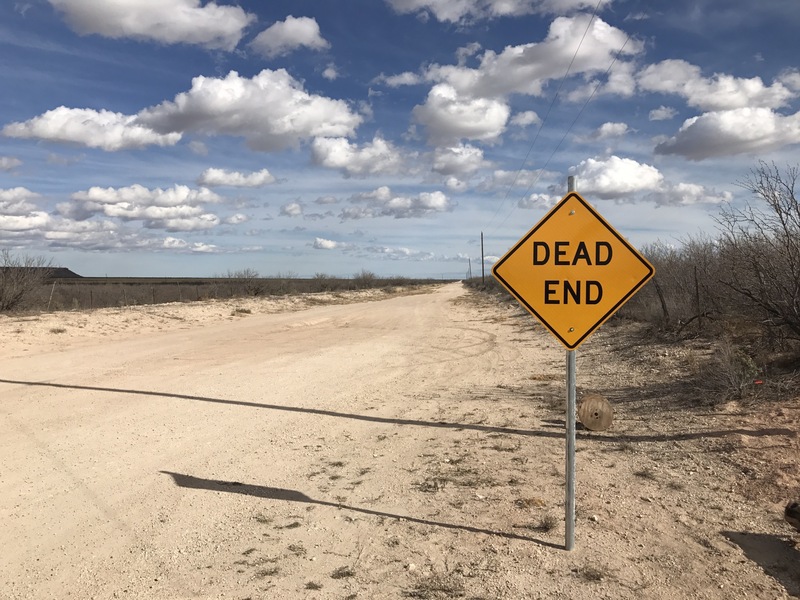 Specifically, the 80 miles north of Austin was an endless stretch of construction with bad traffic congestion, closed lanes, lane shifting, bad pavement, and some of the narrowest lanes I’ve seen. Concrete lane barriers left zero room for error. I’m talking less than 6 inches on either side of our MoHo between hitting concrete on one side or crossing the median line on the other side. It took us just under 5 hours to drive only 200 miles. Which is crazy when all but 5 miles of that drive are on Interstate highways!! Texas speed limits are 80mph most sections of the Interstate, so to have an average speed of 40mph, you know we were doing 20mph a lot of the time. Apparently roadway engineers from the Boston area have come south to setup this stretch. The stretch between Washington DC and Boston is just generally one big stretch of bad with spots of awful. And a few sections of “you will die.” The good news is that after driving in the Northeast, I know we can drive anywhere! 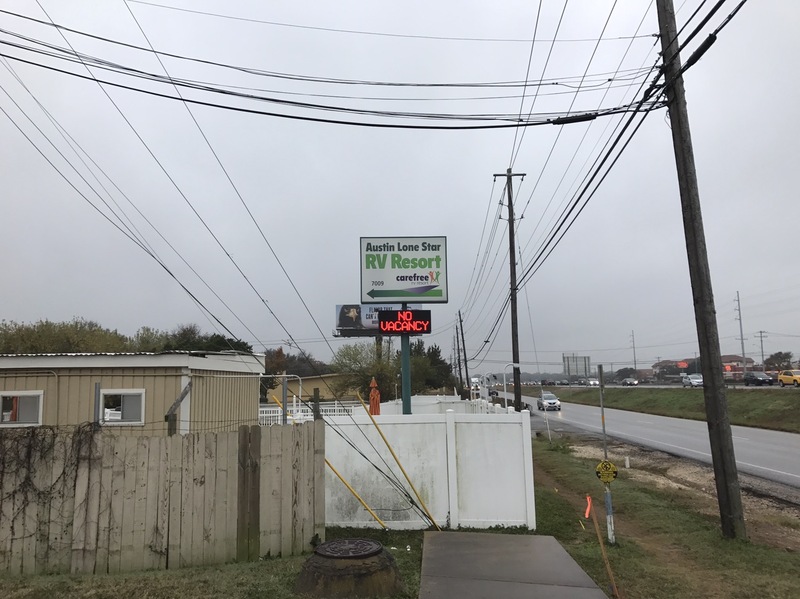 When we finally arrived at the Lone Star RV “resort” in Austin we saw the sign clearly says NO VACANCY. A reminder that RV campgrounds do fill up in the South in winter. Fortunately we had reservations. 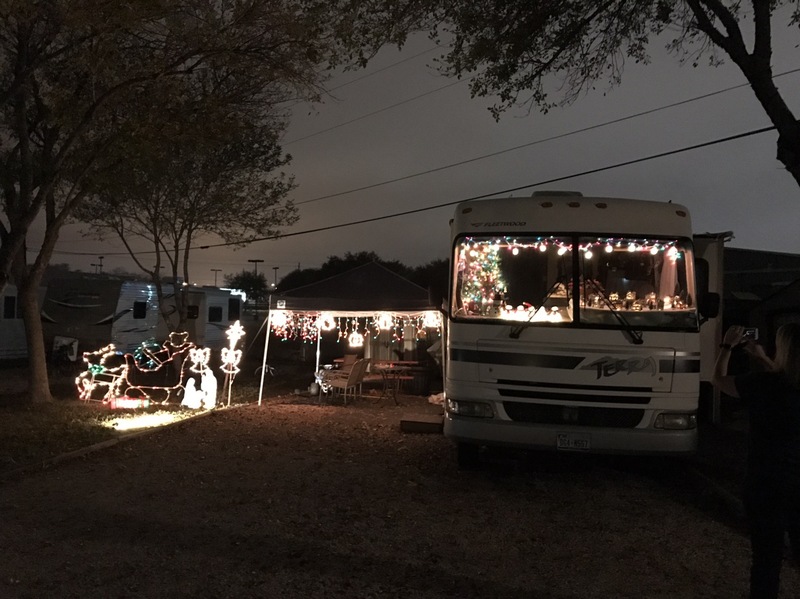 Christmas spirit is everywhere, even in the RV campground. You don’t need a sticks-and-bricks house to setup decorations! 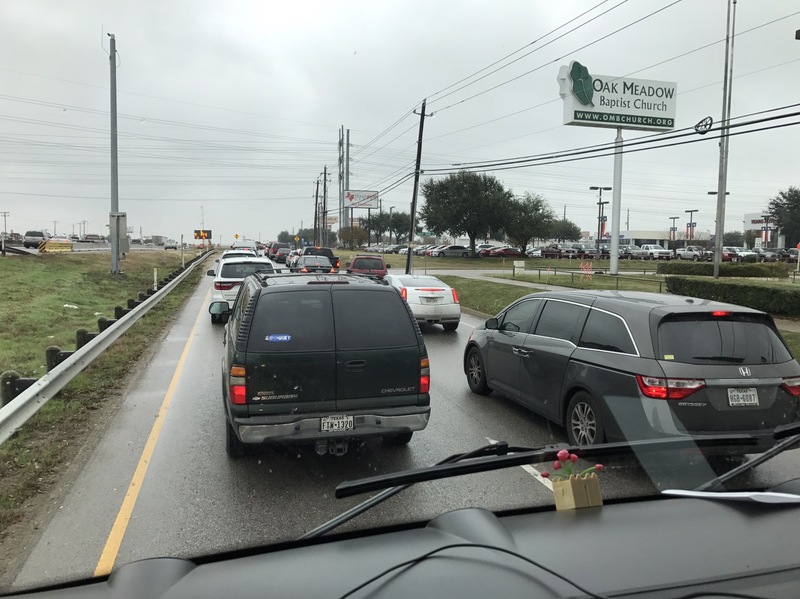 So traffic and the road construction mean there are only two types of traffic in Austin: Slow and Stopped. Even the truck stops were busy. Of course, I picked the lane with the broken fuel pumps. 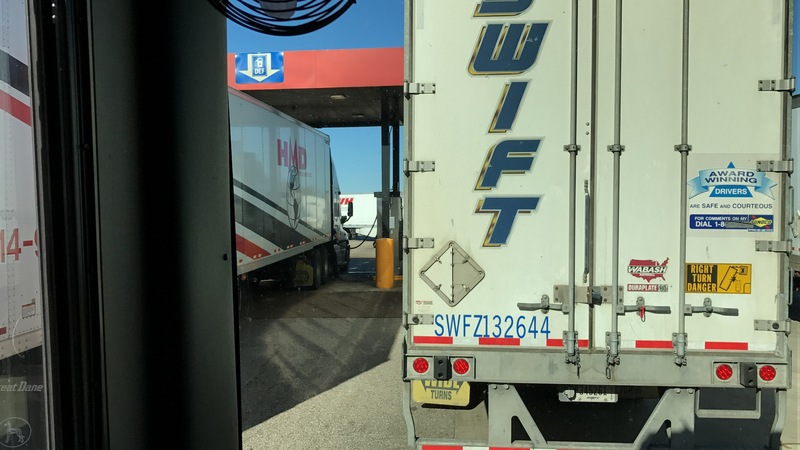 We can’t backup when we are towing the Jeep, so we were kinda stuck until the truck on the right offered to backup so we could fuel at his pumps! 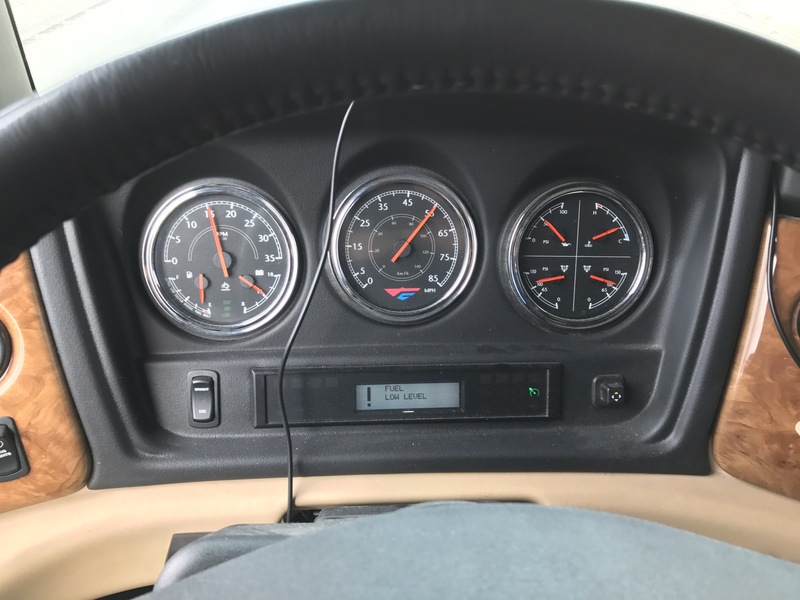 That restores some of my faith in the trucker-RV relationship. Pulling back into the Buckhorn brought a flood of emotions. Not only is Buckhorn a great place, it is the place we generally feel is when our trip really started. Before Buckhorn, we were (mostly) in places one of us had seen before and certainly in states we had seen before. Kerrville was the jumping off point for truly new exploration for us. It hit me that for the past six months every place we saw was new. Every single place. Which is both exhilarating (always exploring new places) but also a little fatiguing. Returning to Kerrville kind of felt like coming home. Our arrival was none too soon. The mass of cold air forecasters warned about was rapidly approaching. This front would set records for fastest temperature drop all over the country. At one point there was a 70 degree difference in temperatures between Memphis and Nashville. 70 degrees in less than 300 miles! 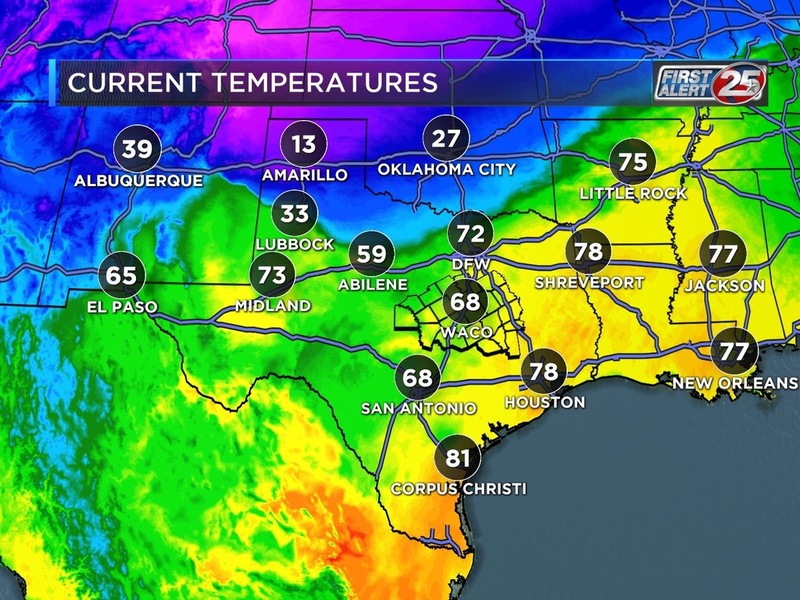 Look at how crazy this is: 13 degrees in Amarillo and 73 degrees in midland a few hundred miles to the south! We prepared for 18 degrees. Which is by far the coldest weather we’ve faced on the trip. To make the situation worse, winds caused by the cold front were intense. Gusts were hitting 40mph or even higher. Fortunately, our propane tank was full and those propane furnaces are powerful! Since we have to unhook our shore water in temps like this, I filled our freshwater tank full. We would be running off internal water for at least 2 days and may be 3. No problem. We know we can go 5 days on our internal tanks. A few Navy showers and no laundry though. The electronic water gauge in our control center is not very helpful when filling the freshwater tank. It registers FULL about 5 seconds before or after the water tank overflows and water begins coming out of the manual fill ports. Sure enough, as the FULL light illuminated, water was pouring out of the side of our MoHo. At least I know the tank is full!! Tank now full, I rolled up the water hose and stowed it in its tub in the basement. I put a small space heater in our wet bay to keep our water pump from freezing. I switched our cabin heat -both zones – to propane and plugged in our two electric space heaters. They aren’t enough to heat the coach but they help reduce the need for propane. NOTE – if you use electric space heaters, be careful of the current draw. Typical 5000btu electric space heaters max out a 15amp wall socket (they really should be plugged into a 20 amp socket). And don’t plug two of them into outlets sharing the same circuit/fuse. You’ll overload the circuit. As a precaution, I retracted two of our four slides. Specifically the two which have water pipes in them. At around 3am on the first night, with cold winds howling around our windows, Heather woke me up. She realized the propane furnaces were running non-stop. We got up and saw the temperature inside had dropped to 65 degrees! I used an infrared probe and air coming out of the furnace vent was only 70 degrees when it should have been around 150 degrees!!! It became clear the propane furnaces were lighting but not staying lit. The gas would burn for a few seconds, giving us a tiny bit of heat, and then going cold again. This could be a huge problem for us! Our heat pump won’t work below 40 degrees. Even if it did, the heat pump won’t keep our pipes from freezing. After 30 tense minutes and temps dropping, the galley furnace lit and stayed lit. Hot air blasted into the coach! Best I can tell, the winds were so strong and so cold they had tricked the flame sensor into thinking the furnace hadn’t lit properly. The job of the flame sensor is to ensure temperatures in the furnace climb quickly when the furnace starts. If temperatures don’t climb, it could mean the gas did not light properly and unburnt propane could be building up! That is dangerous, so the flame sensor shuts of the gas. We could hear the furnace light, but I believe the super cold temps and high winds were tricking the sensor into shutting off the gas after a few seconds. Update: I am even more convinced this is what happened since the next night temps dropped even colder but there was no wind and the furnaces worked fine. 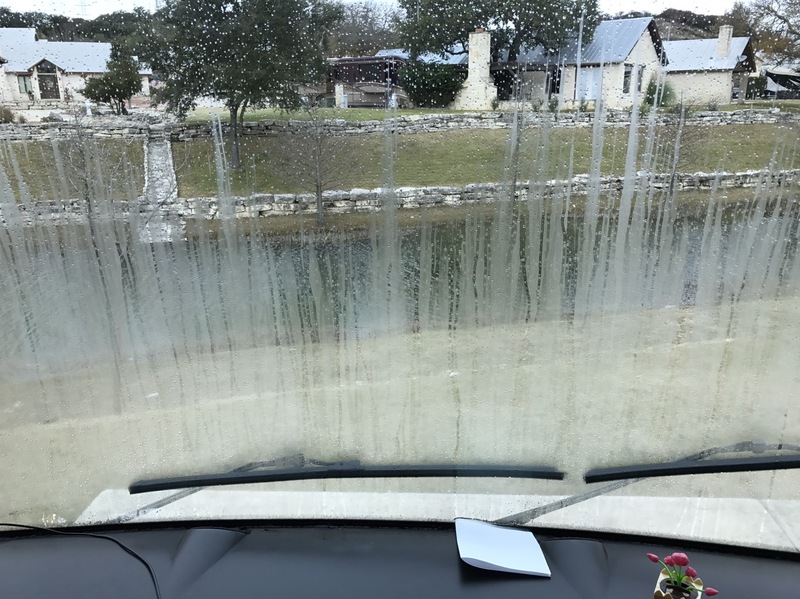 The next morning, we opened the blinds between the windshield and the cabin and found ice all over the windshield and along the bottom of dash! 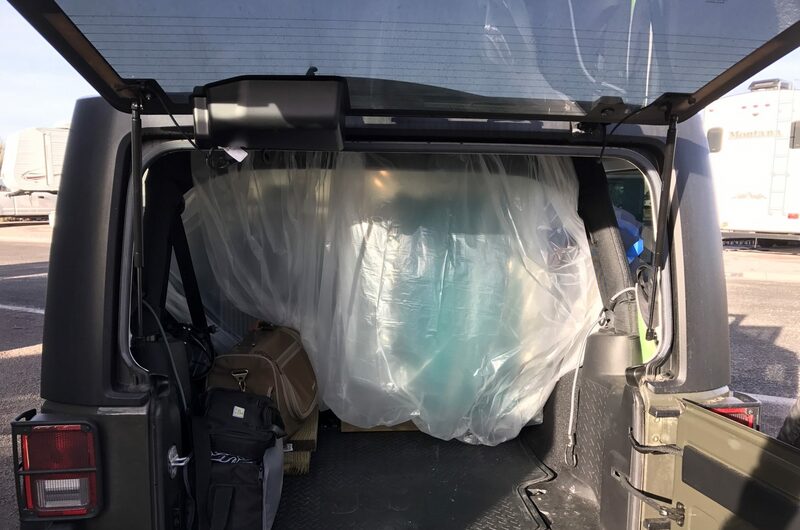 The space between the cabin and the windshield is one of the colder spaces inside our MoHo, and all the humidity in the air condenses in here. Basically, the cold space acts as a giant de-humidifier. Which isn’t a bad thing. 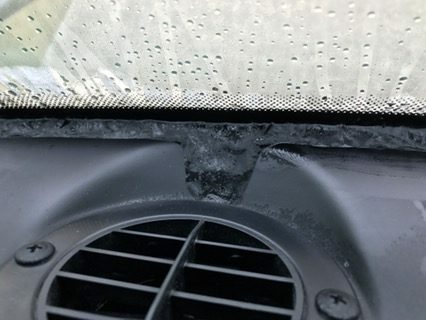 Due to the bitter cold, that condensation froze. 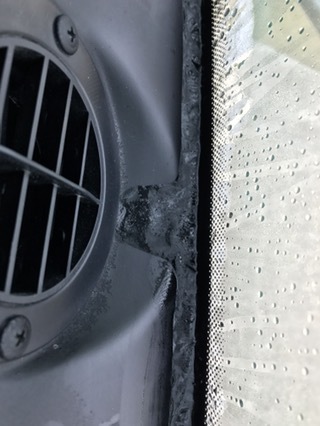 This condensation forms in all of the cold spaces in the MoHo and is a primary reason why poorly insulated trailers and motorhomes are a big problem. Water can – and does – build up in the walls and ceiling. The same happens to pipes in unheated areas. Clearly, it was cold enough to freeze any pipes that weren’t exposed to at least some cabin heat..
Fortunately, Fleetwood has experience with cold built our Discovery well. We had no issues with the savage cold. Other than the tile floor was really cold after two days of this! As the skies cleared and temperatures warmed, we explored Hill Country. 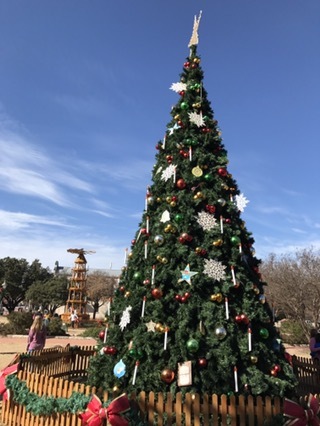 Fredericksburg, a short 25 miles from Kerrville, was all decked out for Christmas. With its German history, Christmas decorations here take on a German theme. 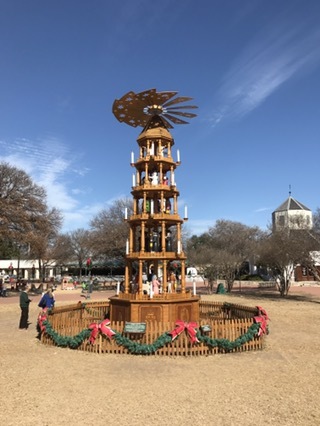 Like this multi-story Christmas tower topped with a horizontal windmill. Because nothing says Christmas like a horizontal windmill! Of course, there was a large Christmas tree as well. The next day, we drove to San Antonio. 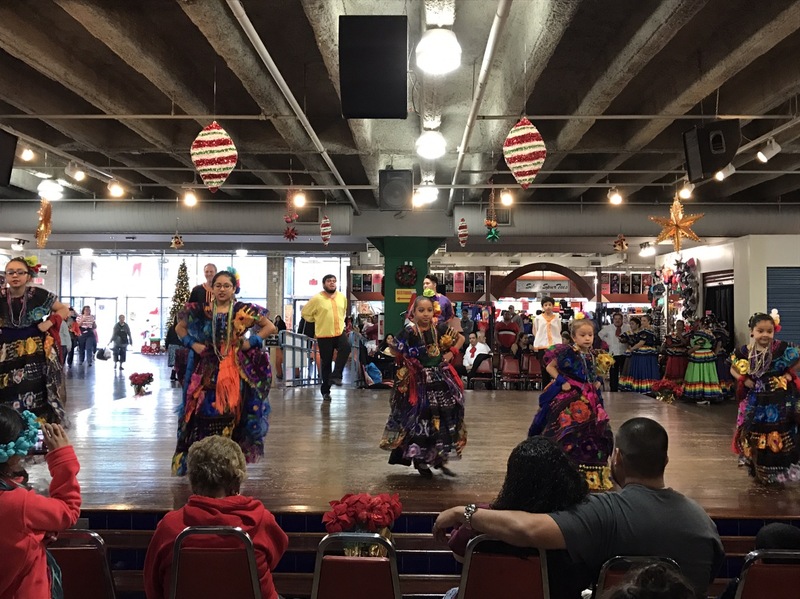 At the market in old town, a Mexican dance troupe put on a show. Some of the dancers were as young as six years old! They were dancing the ceremonial dance of Chiapas, the southernmost Mexican state, in this photo. 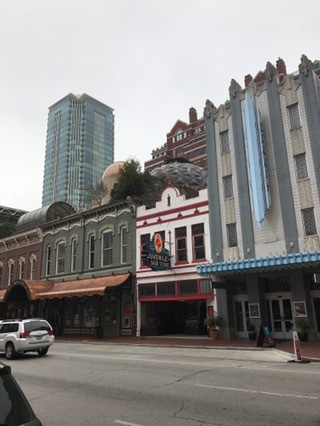 San Antonio is one of my favorite towns, and on this trip we had time to really walk around more of the old downtown. 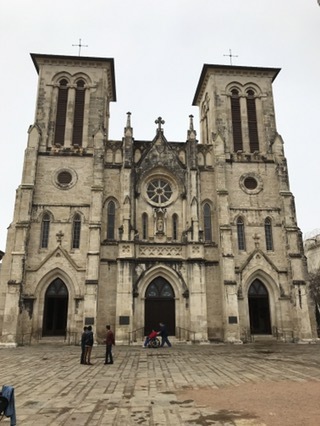 Cathedrals like this one share space with old redstone buildings like the San Antonio courthouse. It wouldn’t be a trip to San Antonio without a visit to the famous Riverwalk. 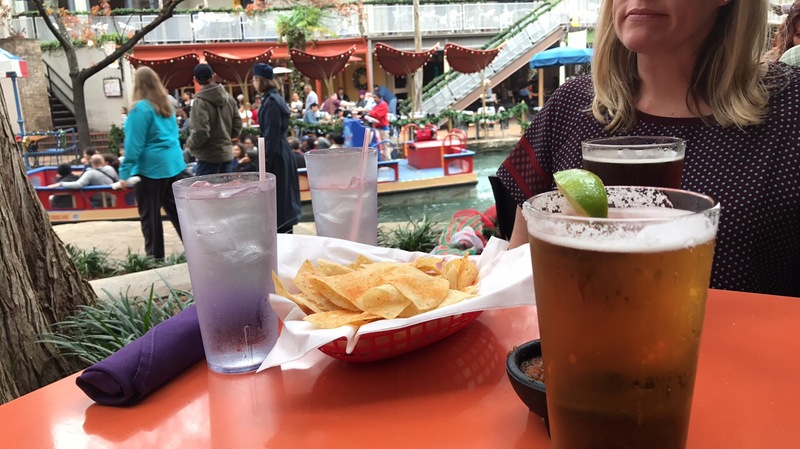 We stopped and enjoyed a Mexican food lunch and a Dos Equis as we watched the boats go by on the river. San Antonio is such a fun town and I’m always happy to be back here! Fortunately, after a few days of blistering cold (for Texas) temperatures have returned to normal, which for this part of the country is in the mid-to-upper 70s. The next day, we drove to Boerne – which is pronounced “Bernie” – so we could have a recall done on our Jeep Wrangler. We used the dealership shuttle to take us to downtown Boerne. Main street in Boerne (say it with me now…Bernie) is known as the “Hill Country Mile.” The Mile is full of shops and restaurants. Frankly, Fredericksburg is much more interesting. We had brunch and then walked the mile along with the walking path along the river which runs past downtown. We also had time to do some housekeeping, which included changing our whole-house water filter. 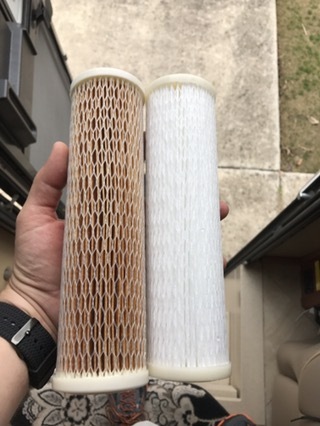 I bet you can guess which one is the old one and which one is the new one! I change this every 3 months and I’m wondering if I should be changing it every 2 months! From here, we drive to Sonora Texas to see the Caverns and then to Las Cruces New Mexico. 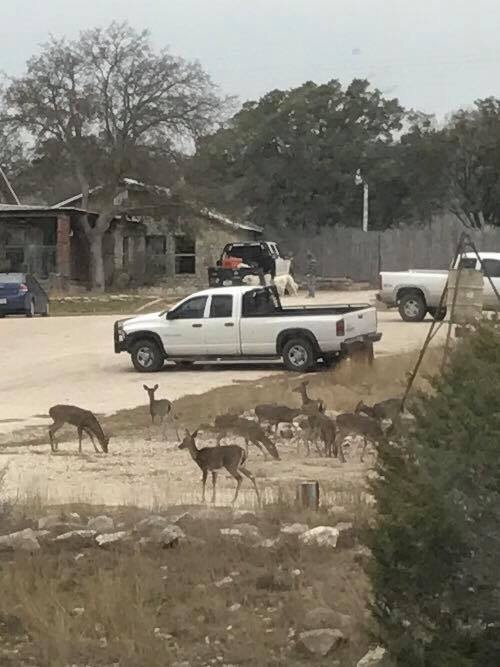 Hill Country Texas is a great place to spend some time, and an especially nice place to spend Christmas! The weather service says that a massive cold front – even bigger than the last one – is on its way. Temps are forecast to drop dramatically in Kerrville TX, our next stop. In fact, they warn 18 degrees is in the forecast! 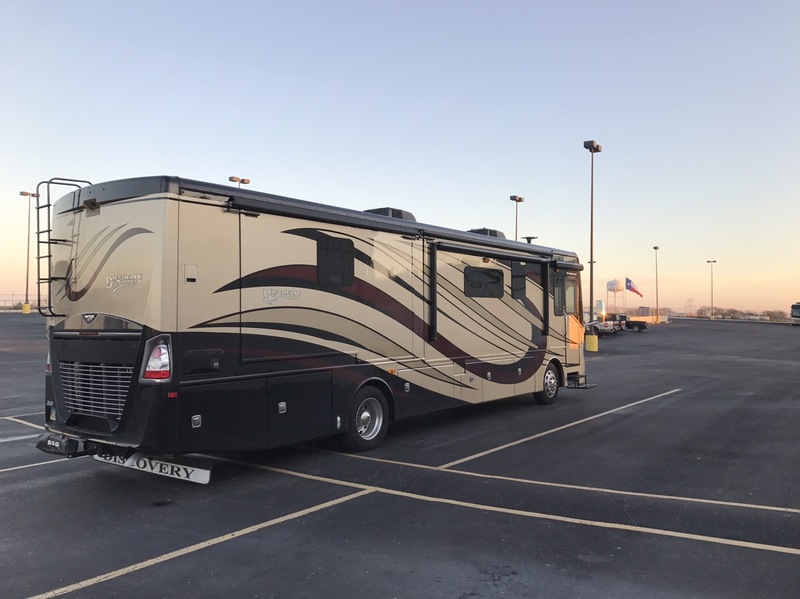 18 degrees is tough on RVs, ESPECIALLY if they have to be driving on the highway. Savvy RV owners know they don’t want to drive when temps are below freezing if they can help it. We were supposed to make our way to Kerrville on Monday but we decided to cut our trip short so we can arrive (and drive) during good weather on Saturday. That means we have one day to see Waco, and then we’ll overnight in Austin Friday and drive to Kerrville Saturday. 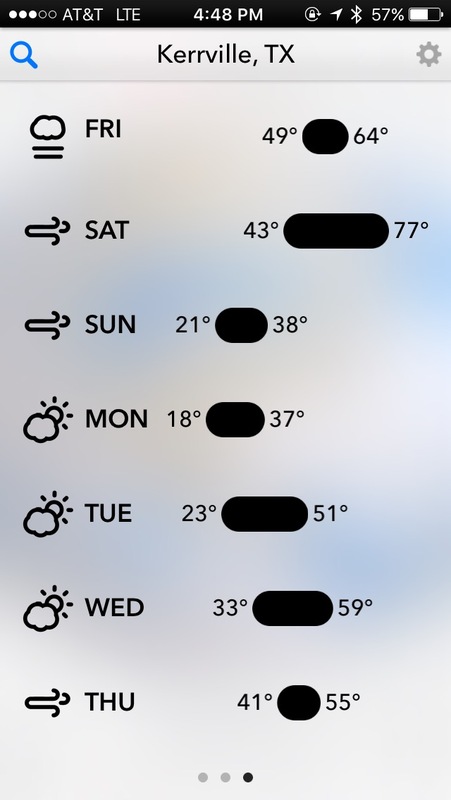 Saturday will be the last clear drive day for 4 days. Waco is about 80 miles south of Dallas. I mostly knew Waco as the site of the infamous raid on the Branch Davidians in 1993. Fortunately Waco is becoming known for a much more positive reason. 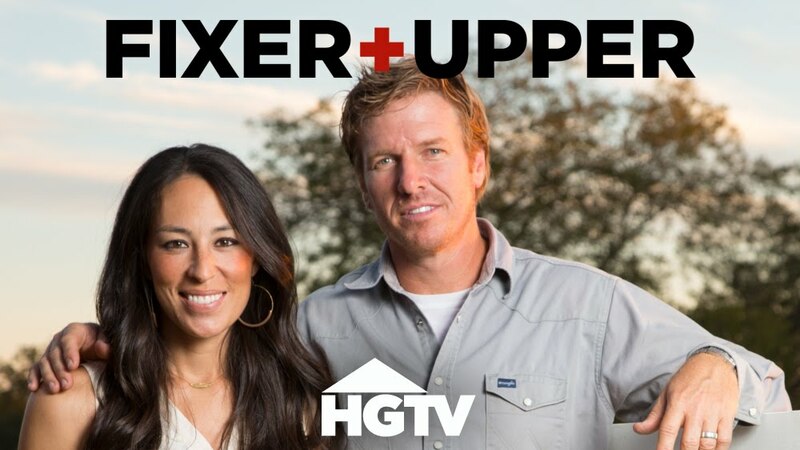 The hit HGTV show Fixer Upper! Heather loves this show and she isn’t alone! The show is credited for starting a multi-year resurgence of Waco real estate. Waco zip codes are among the 10 most frequently searched on Realtor.com. That’s quite a feat for a TV show! 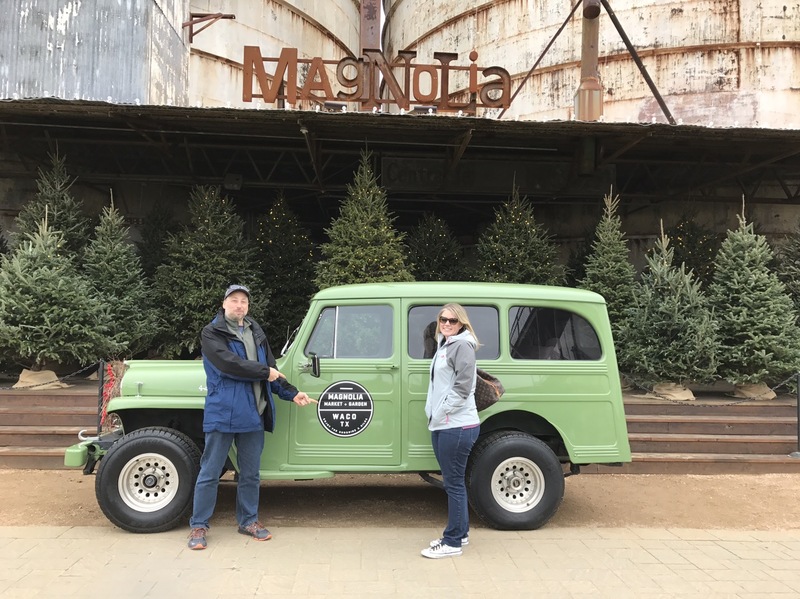 But I can understand it – we were going to Waco to checkout the new Magnolia Farms project called Silos. We drove to Waco and as our GPS showed us getting close, we started to see small businesses and churches advertising $10 parking in their lots. Rut Roh. Sure enough, as we arrived at Silos, people were everywhere. Parking spots were nowhere to be found. Except for $10. And this was on a Thursday mid-day! 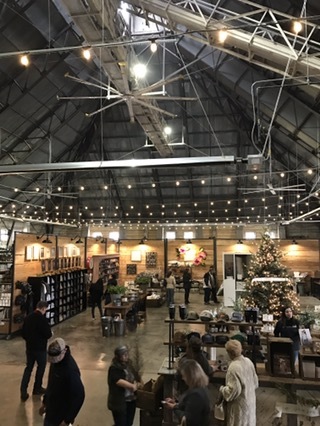 Chip and Joanna’s Silos project has turned into a multi-building campus with a bakery, a home decoration store, an outdoor space, a garden shop, and a food truck pavilion. The place is really well done. The historic grain processing site has been spruced up and definitely reflects the design ethos of the Gaines’ other projects. Just on a large scale. A classic Jeep was parked outside the silos which give the project its name. Everything was decorated for Christmas. Large adult-sized bench swings have been built, and there were at least 10 food trucks with all kinds of good grub. Inside the main store has all sorts of items for sale. 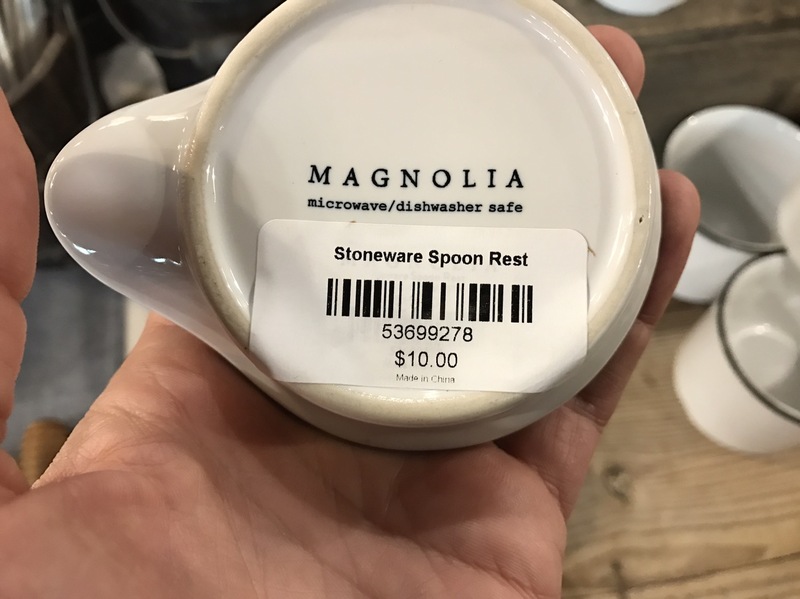 Probably half are T-shirts, coffee mugs, baseball hats, and other fan merchandise for Magnolia Farms and Fixer Upper. The other half are design elements and paints chosen by Chip and Joanna. I was disappointed to see how many of the items were made in China. 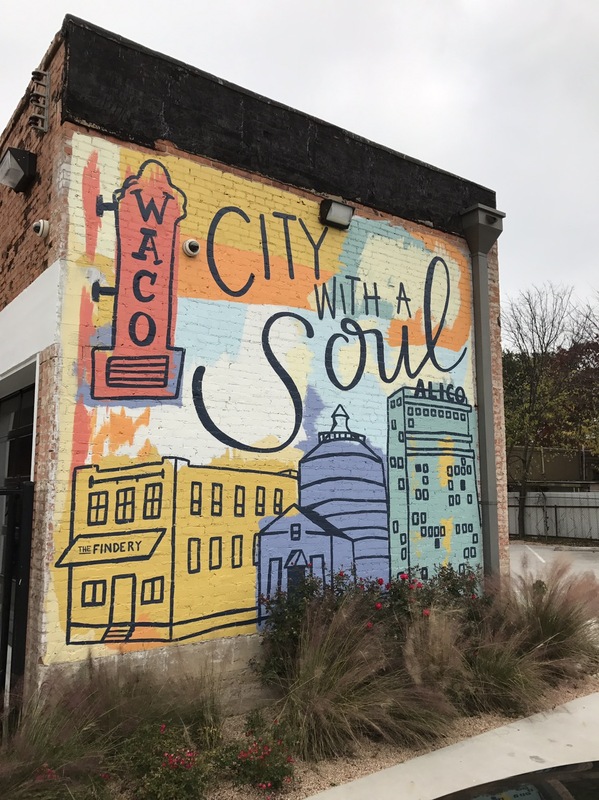 For a couple who built their entire fame on restoring Waco homes with local decorations, I was disappointed that they chose to put so many non-local items in their own store. And not at low prices either! Chinese made coffee mugs were $10. I know for a fact that custom coffee mugs can be obtained from US companies and for a lot less than $10 per mug. Chip’s corner had a large selection of Magnolia Farms hats. Most were $25 and made in Bangladesh. Disappointing, to say the least. Especially because I have personally ordered custom hats and T-Shirts from American sources for far less than they were charging. I guess they want the biggest markup they can get. Magnolia Silos was pretty cool. 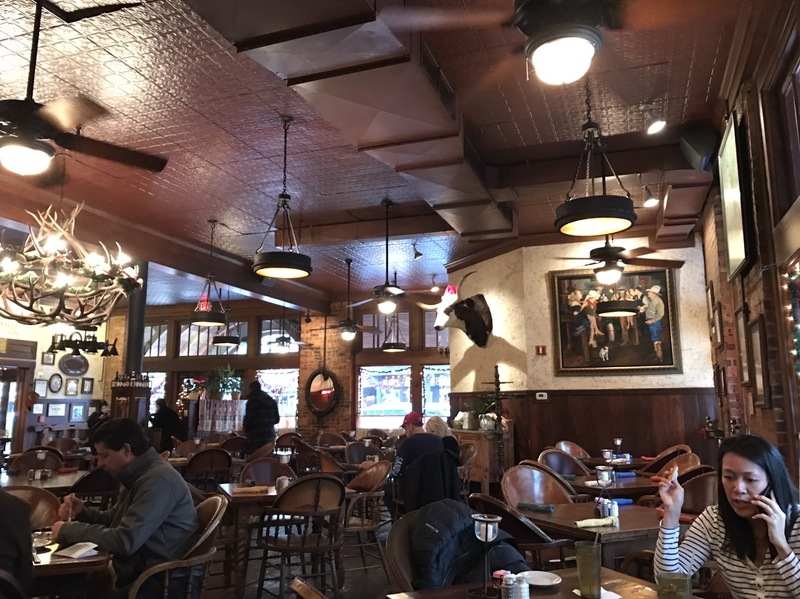 It has a great vibe and offers a casual environment to just hang out. I could see it being a popular place to get lunch with all the groovy food trucks, the bakery, and the fun atmosphere. Ultimately, I think this is important to helping the Gaines carry the place once the show on HGTV ends its run. We walked around the rest of downtown Waco to see what it was all about. Not much to see, although more to see than downtown Dallas (with less poo on the sidewalks too). Like Dallas, Waco has demolished many of the historic buildings and built a lot of parking lots. Fortunately many buildings remain ( Unlike Dallas). Some shops remain and restaurants are moving back to the downtown area. Of course, its still a transition. We went into one shop and spoke to the owner who described the crack motel across the street in very colorful terms. An interesting landmark was a famous suspension bridge opened in 1870 that used to be a cattle drive path. That bridge is nearly 150 years old! 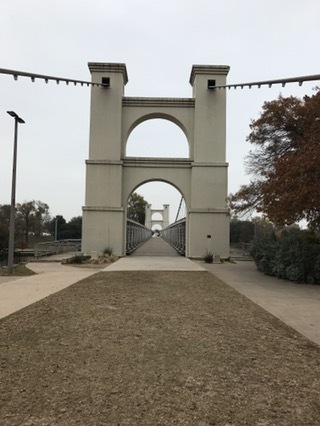 Cattle were literally driven right across this bridge through the heart of Waco. 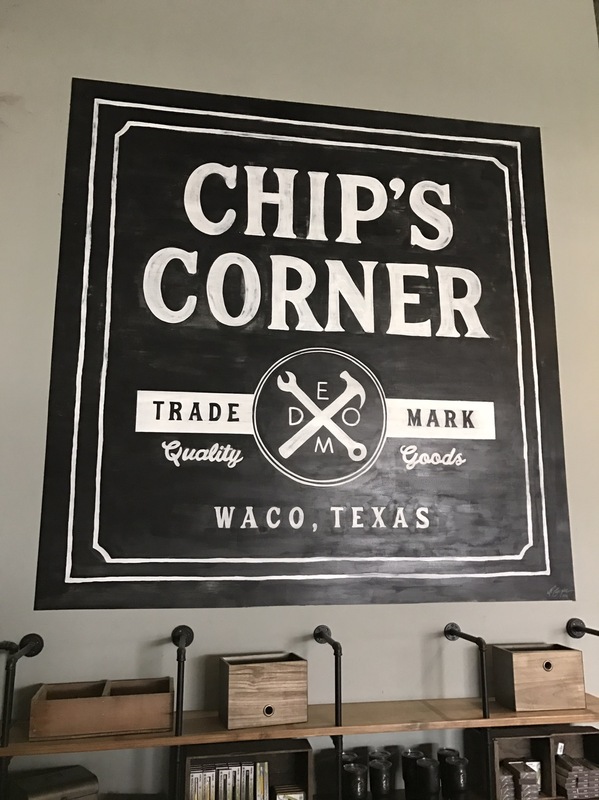 Waco is a fun place to spend an afternoon, especially if you are a fan of HGTV’s Fixer Upper. 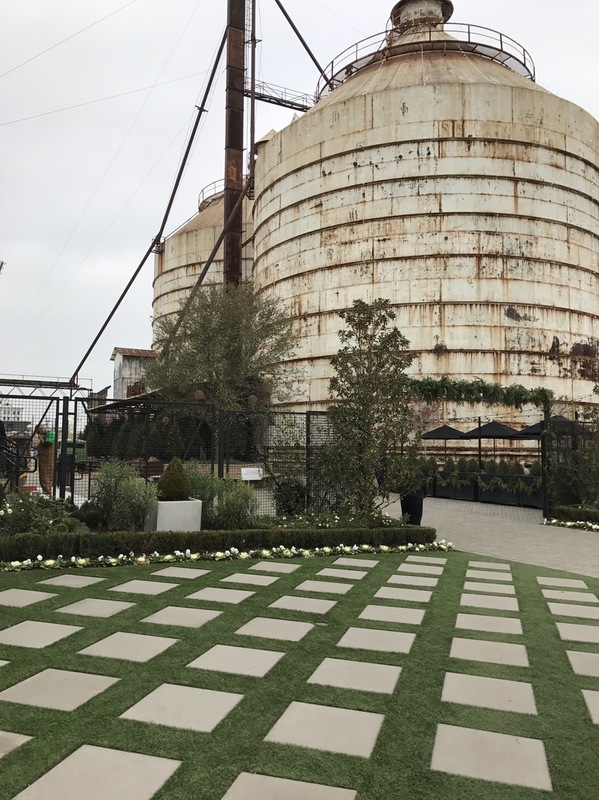 You’ll love the Silos, even if you don’t see Chip and Joanna! Since our window fix was complete, we had time to explore. Dallas was first up on the list. 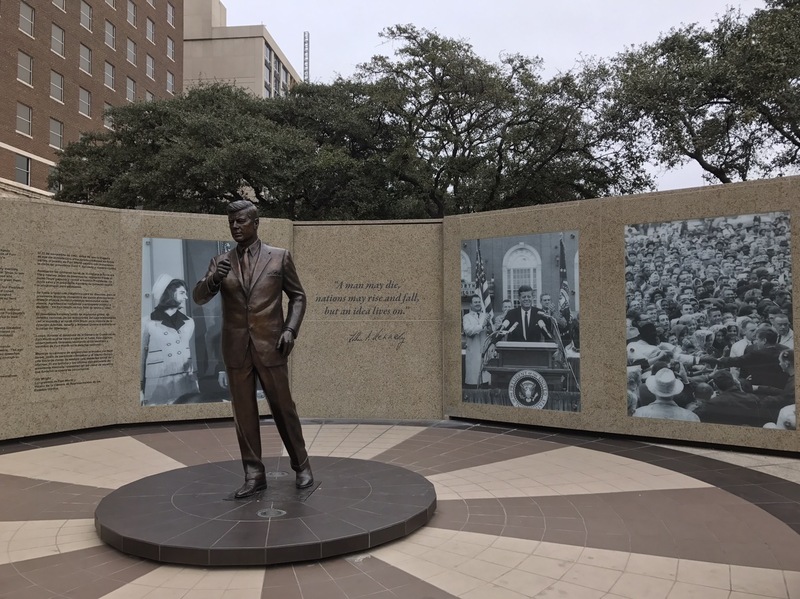 Dallas is forever associated with the assassination of President John F. Kennedy, especially for older Americans. 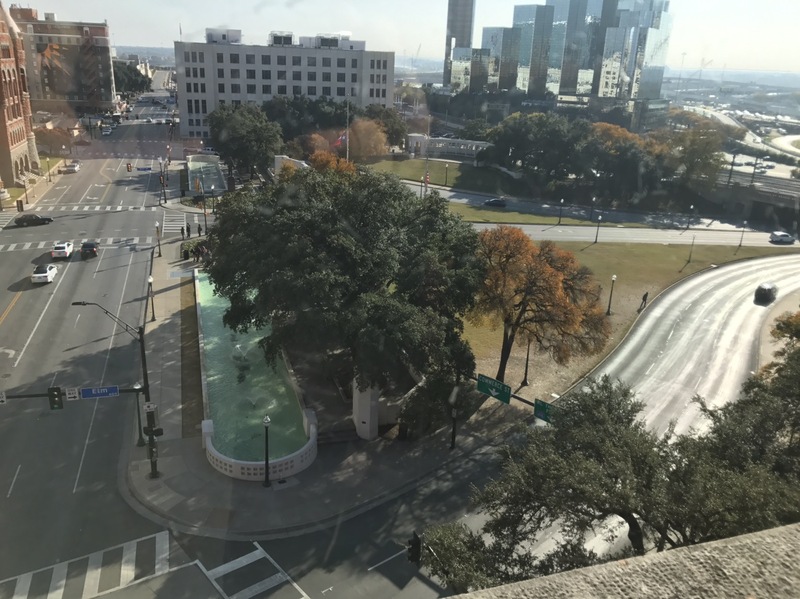 Dealey Plaza may well be the most well known plaza in the country. It would be our first stop. 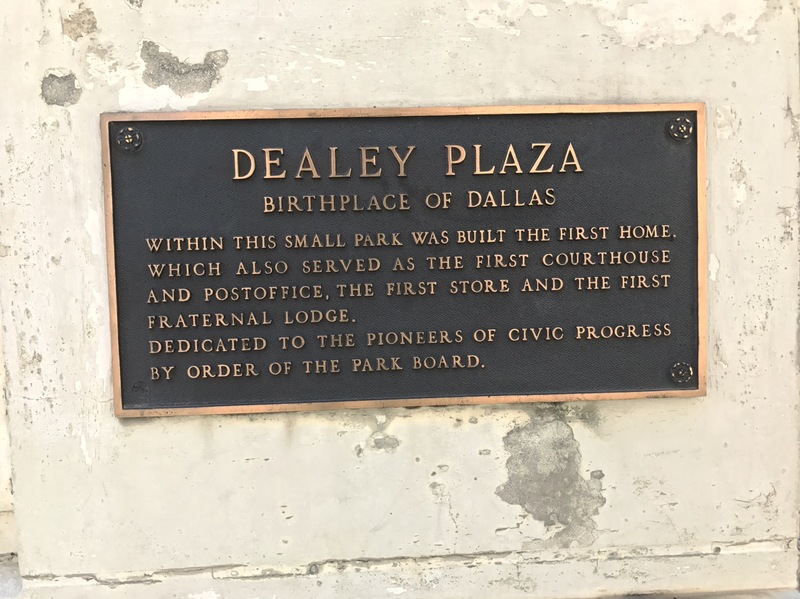 Dealey Plaza is considered the founding site of Dallas and is on the edge of downtown. The current Plaza was built by the WPA between 1938 and 1940 in the Art Deco style so recognizable from news footage of the assassination. 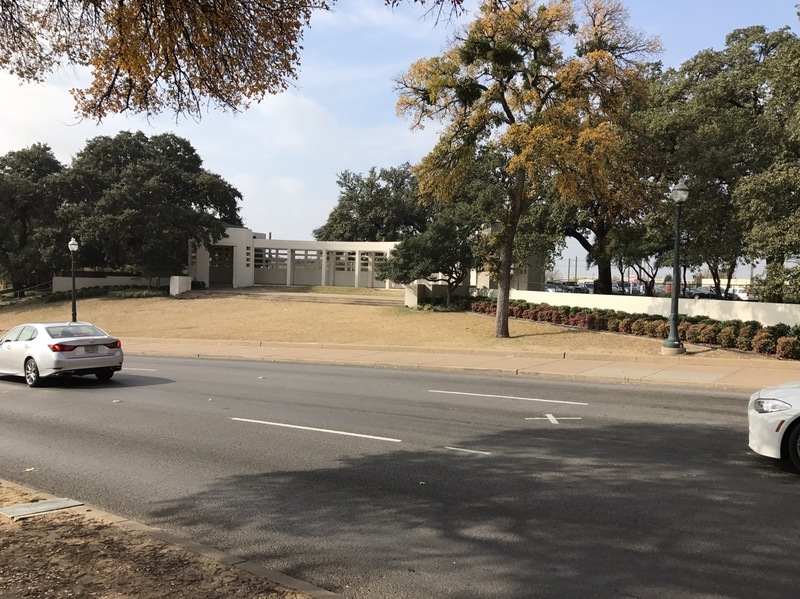 I would bet most Americans recognize photos of Dealey Plaza and it hasn’t changed much (at all) since 1963. Well, probably in 1963 there weren’t as many people selling DVDs with conspiracy theory movies on them. But otherwise, it looks almost exactly as it did when Kennedy was shot. It is kind of surreal. I stood there with a massive sense of both deja vu and surprise that the area is just so compact. I guess for an event the size of the Kennedy assassination I expected a physically huge space. 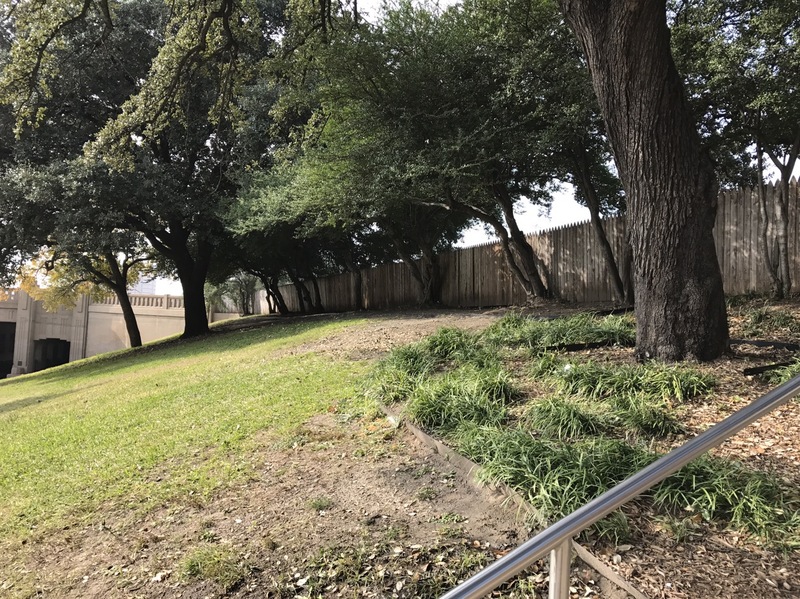 The famous “Grassy Knoll” is still exactly as it was in every single film frame and photo I have ever watched about the assassination. The Grassy Knoll is more of a slight rise and not a knoll. Come to think of it, I’m not sure what a knoll is. Maybe it IS a knoll. Whatever it is, it is very weird to stand there. We actually parked just behind that fence. The lot behind the fence is now the visitor parking lot to the museum located inside the Schoolbook Depository building. Conspiracy theories have at least one gunman behind that fence. I will admit it has a good vantage point over the parade route. The view from the Schoolbook depository looking down on the parade route. The first shot hit Kennedy just under the road sign which is partly visible in the middle left. The tree completely obscuring the view? It was there in 1963, but not as large. Oliver Stone had a field day with this tree because even though it was smaller in 1963, it still partially obscured the view of the limo below. In fact, that is one of the points the conspiracy theorists bring up. It seems the Warren Commission report says that in November the leaves would be off the trees. Well, its a Texas Live Oak and as you can clearly see it is December and the leaves are still on. The leaves never fall off a live oak. 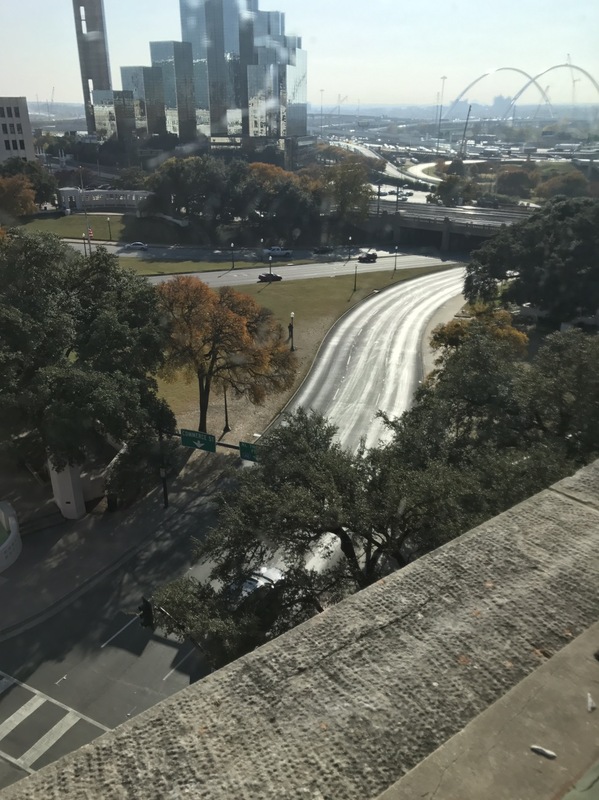 Another one of the points brought up by conspiracy theorists is that the best shot(s) would have been as the limo approached the Schoolbook Depository in a straight line (where the white cars are on the left) rather than after the limo turns left (our right) and accelerates away. I have to admit they have a valid point. Like the Grassy Knoll, looking out this window is pretty surreal. The museum is extremely interesting. Be warned, unless you go during the off-season like we did, the wait time can extend to 3-4 hours due to the limited number of people who can enter the museum. The building itself is in rather poor repair. 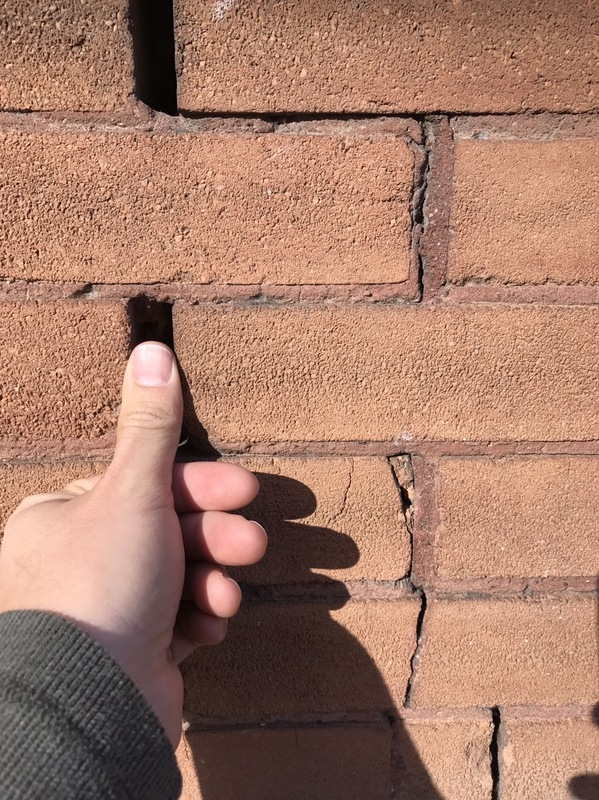 We saw more than a few broken windows and cracks in the brickwork. One of the cracks was almost as wide as my thumb. Considering the admission money hauled in by the museum I was surprised they would allow so many unrepaired issues. 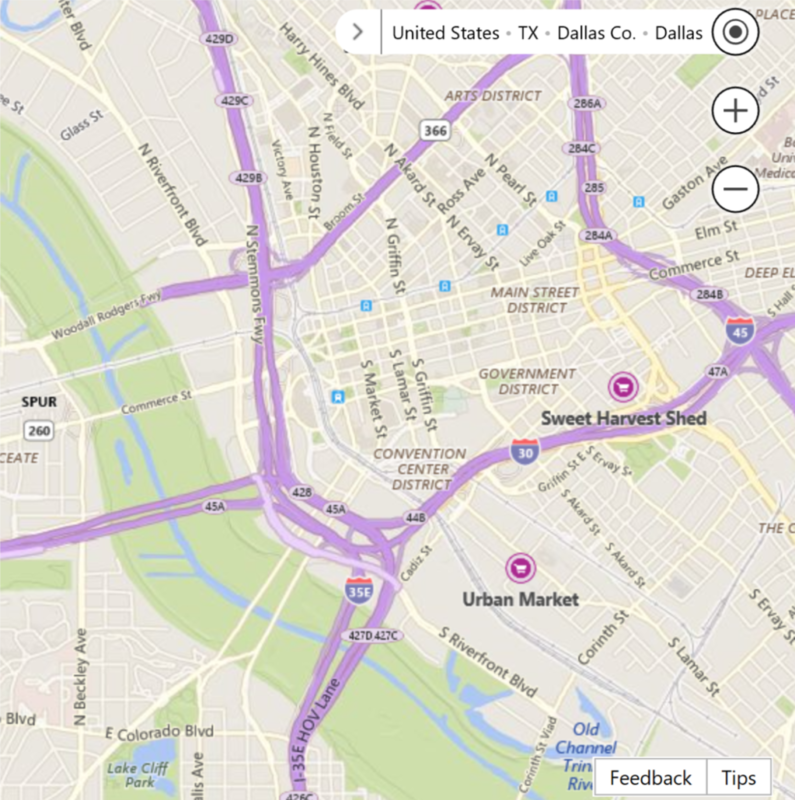 We left Dealey plaza and set out to walk around downtown Dallas. 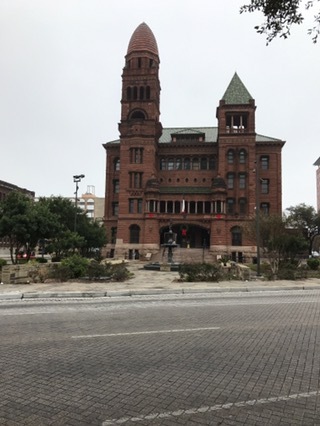 There are a few interesting old buildings, like the old courthouse which is now the Old Red Museum of Dallas history. Christmas was definitely in the air! 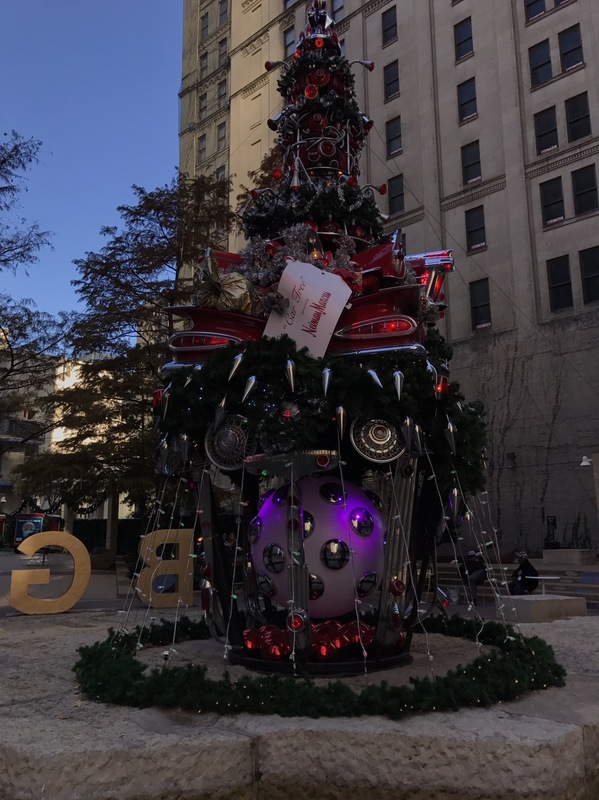 There are several open areas that featured decoration like this automobile-themed tree (why?) that was setup outside Neiman Marcus. Another open space had a giant eyeball (why?). The eyeball has moved around quite a bit, spending time in Chicago and Wisconsin. That probably explains why it is bloodshot. 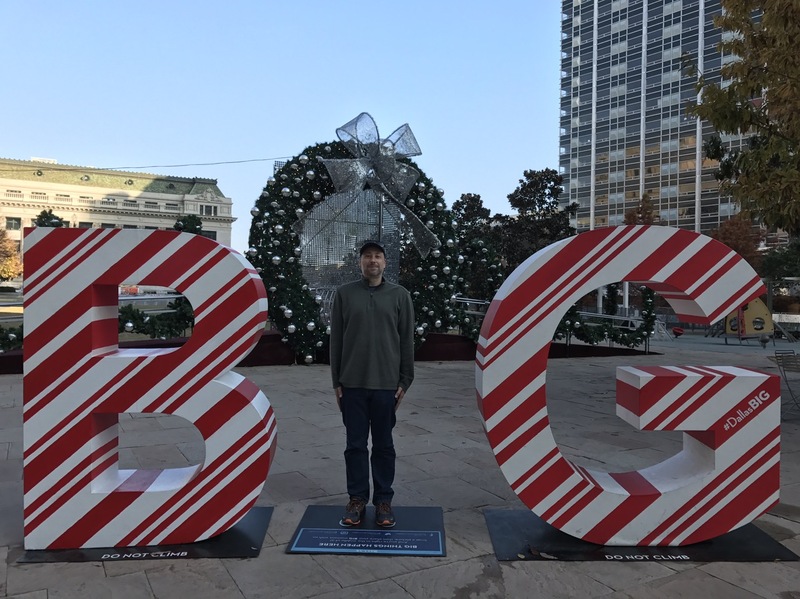 All over town were “B” and “G” letters. After seeing the 3rd set, I looked it up. See that little blue mat in between the B and the G? It says to stand there and form an “I” so the letters spell out BIG. It has something to do with charity, but I’m not sure what. Which means its not all that effective for charity. We did take the opportunity to snap a festive Christmas selfie! 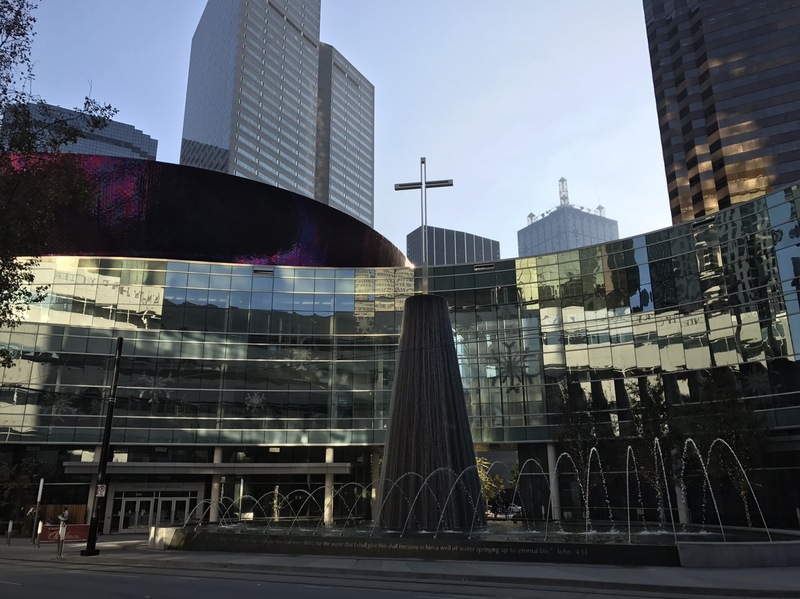 Dallas is home to the largest and most unique Baptist Church I have ever seen. It covers several ENTIRE city blocks and is a blend of old/traditional and ultra-modern. 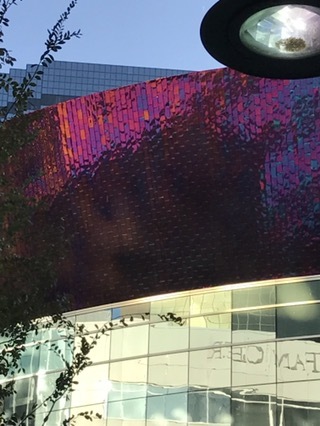 Parts of it look like the EMP center in Seattle with gleaming metallic purple curves and mirrored glass panels. On the other side of the ultra-modern building is the old historical church. Talk about a contrast! I was pleased to see a street named in my honor! 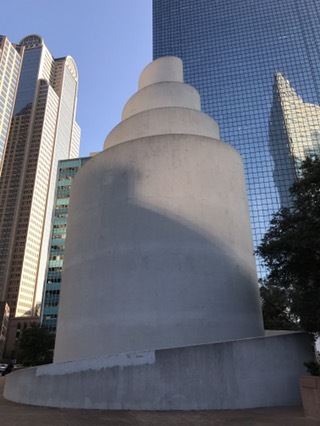 There is a private park called “Thanksgiving Square” that showcases a number of interesting architectural features like this spiral chapel. It also featured a “dog park” that had the worse smell of any public space in any city I have ever seen. I feel like my nose was raped. Not only was it an outdoor toilet for dogs, it was an outdoor toilet for the large numbers of homeless people in the area. Sure, San Fran has more TOTAL homeless, but there are also normal people walking the city too. Not so in Dallas. Dallas is like a ghost town downtown, only the ghosts look a lot like live homeless people. Like ghosts, I bet they are pretty scary at night. Downtown Dallas seems to be offices and commuters. 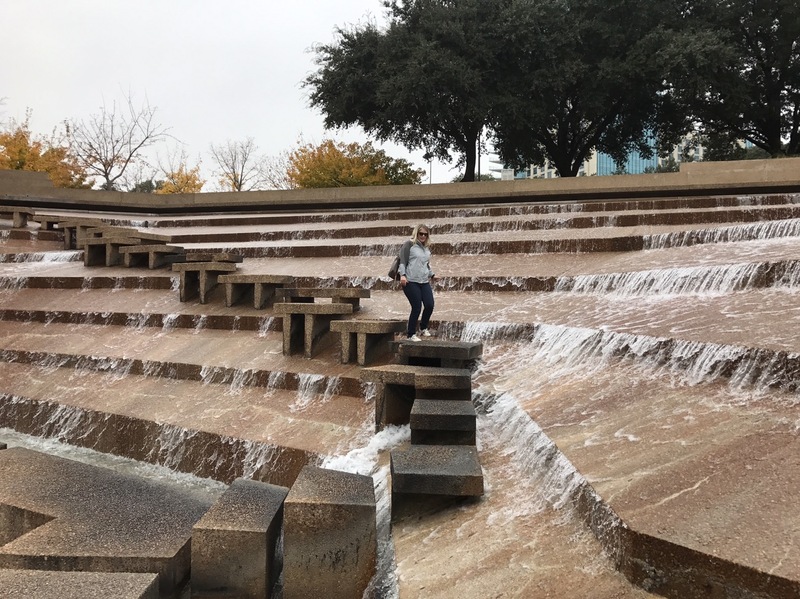 We walked downtown Dallas on a Tuesday afternoon and walked entire blocks without passing another person. When we did see another person, chances are they were homeless or panhandling. Normal people seem to commute in to work in the morning and leave again in the evening for the burbs. Very few restaurants, not much shopping, and not a single grocery store or even a bodega. We covered a lot of the downtown too, not just a few blocks. We even went to the “Historic District” and there is a TGIFridays front and center. Pretty historic. The crowning touch was the spots and streaks of “mud” smeared on the sidewalks. And there isn’t any “dirt” for 20 miles in any direction if you get my drift. Its filthy and nasty. There is a website called Human Wasteland which maps human feces in San Francisco. Dallas needs to be the next city on that website. Although I suspect most of the entire downtown would be mapped. I’m going to say it. Downtown Dallas is the worst large city downtown we’ve seen on the entire trip. At least San Francisco has better scenery and more interesting shops and restaurants. Big D – you have some work to do! Getting in and out of downtown is a bit of a maze as well. With so few actually living downtown, the commuting traffic volume is high. It was also the first place we have seen a dangerously low bridge since we left the East coast. 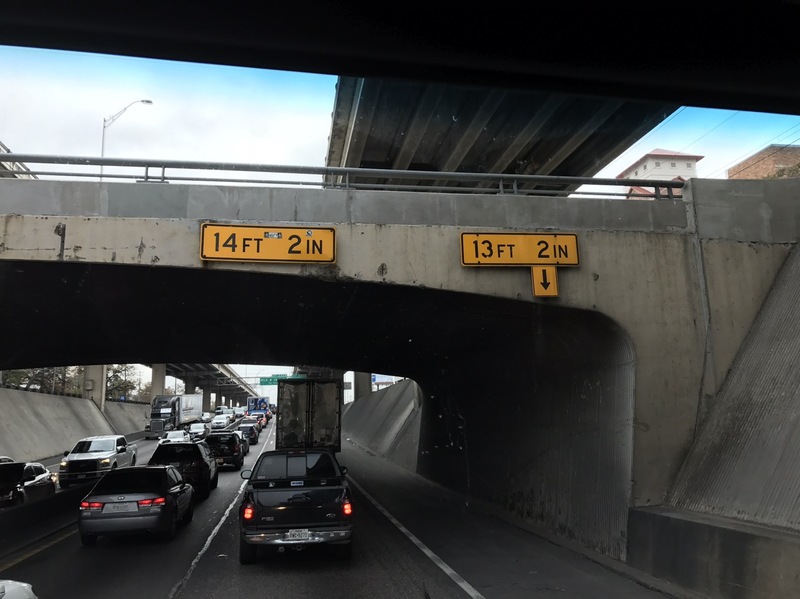 It is likely many RVs would hit the bridge if they were in the right lane, and even the center lane is fairly low. 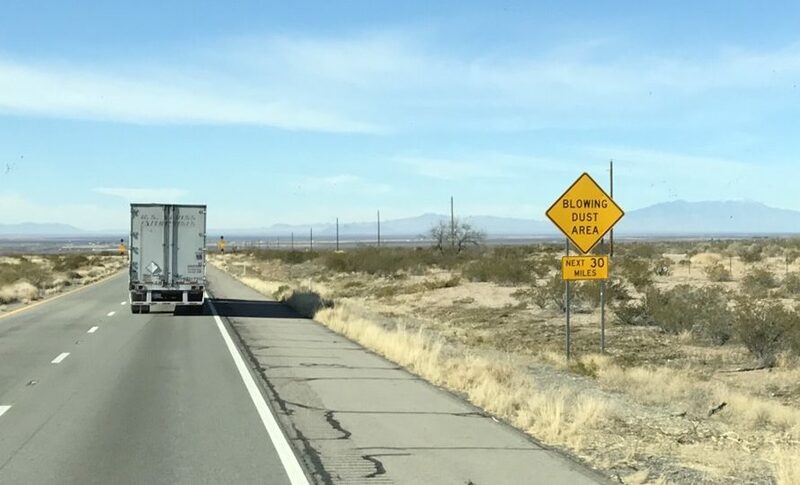 Trucks are NOT warned off this road and so drivers have to REALLY pay attention to avoid that righthand lane. Fortunately we were in the Jeep so no real issues. Still, these kinds of low bridges make me tense up no matter what I’m driving! 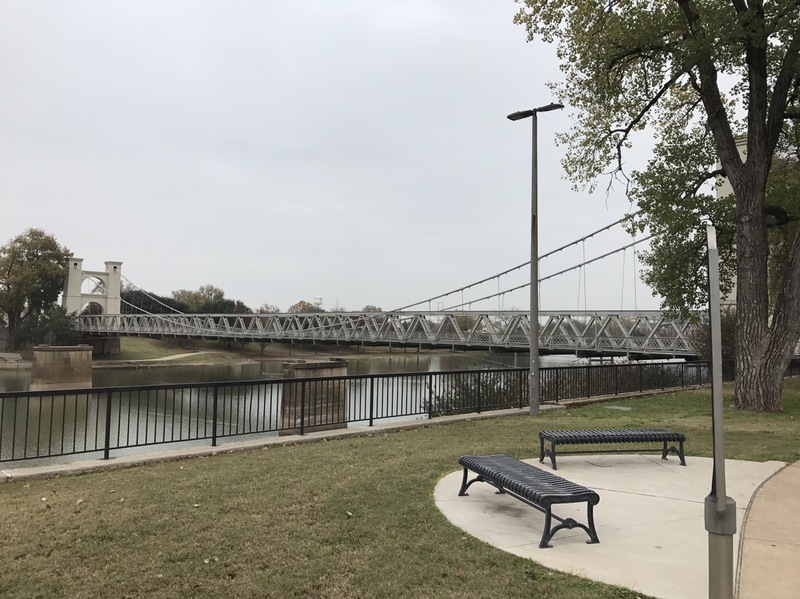 Having seen Dealey Plaza (and trying to unsee the rest of downtown) we returned to our campground with an urge to watch JFK with Kevin Costner. What luck! 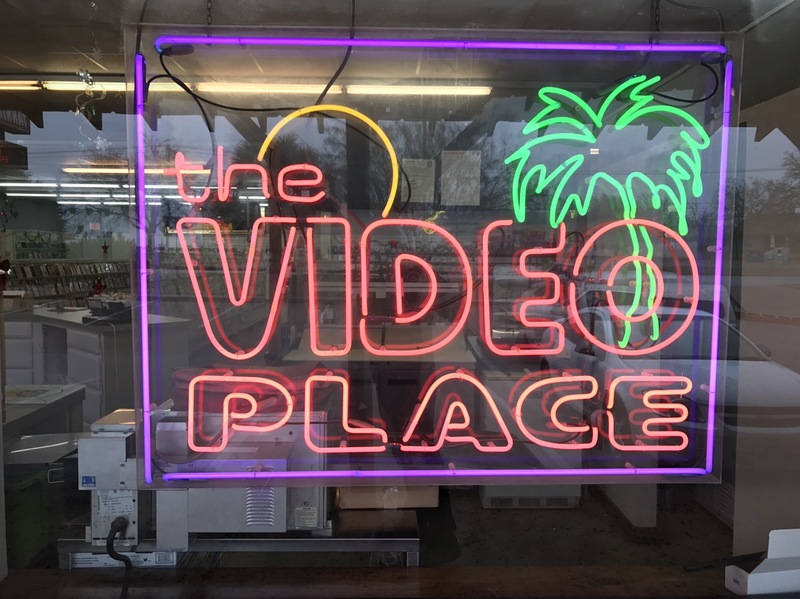 Our campground has the last video rental store on Earth! We can rent it!! And that, kids, is why there are no more video stores left. Fortunately, with the aid of campground wifi (surprisingly good) and the lightning-to-HDMI converter I was able to stream the movie from my iPad to our TV. 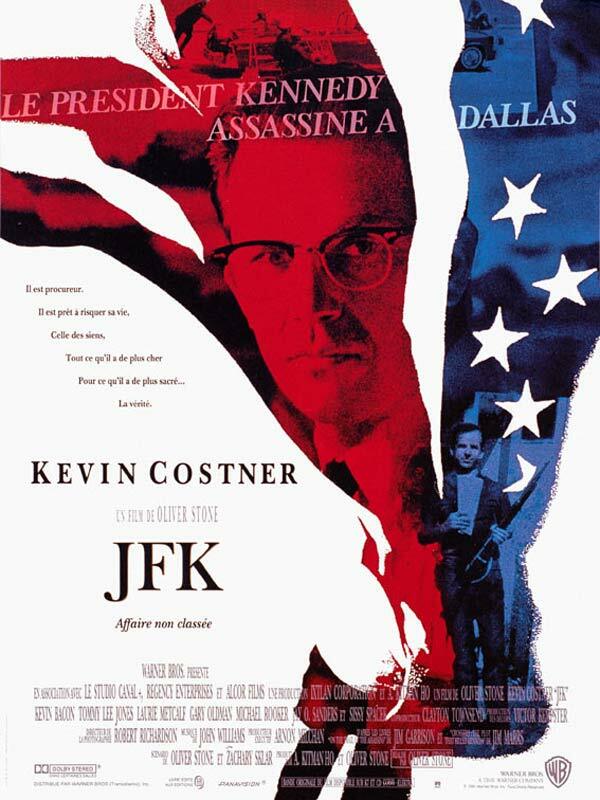 I HIGHLY recommend watching this movie either right before or right after a visit to Dealey Plaza. I wasn’t quite sure what that would actually look like, but was about to find out. 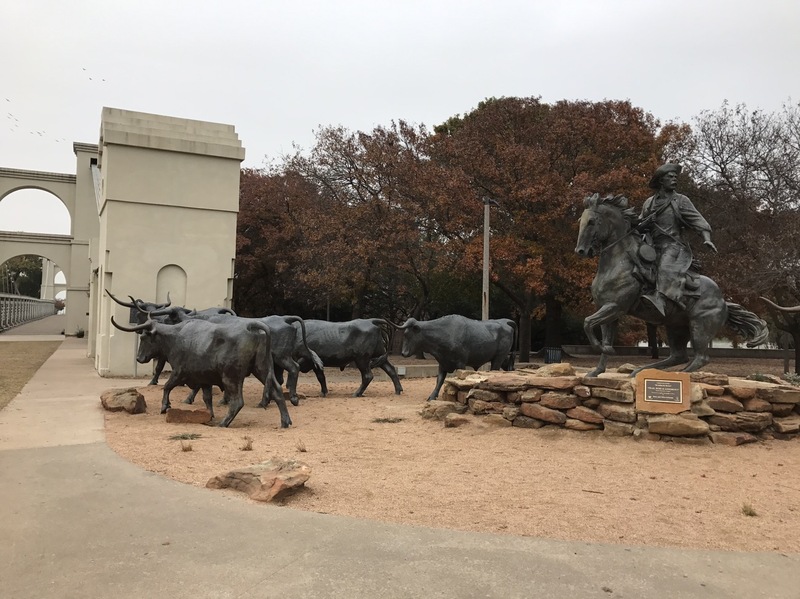 Fort Worth began as a cattle-centric town and has retained that heritage to this day. Fort Worth has gone through some tough times, though. The Civil War and post-Civil War period hit the city especially hard. Population dropped as low as 175 people in 1872, but began to slowly grow. Still, at that time Fort Worth was a sleepy little town. 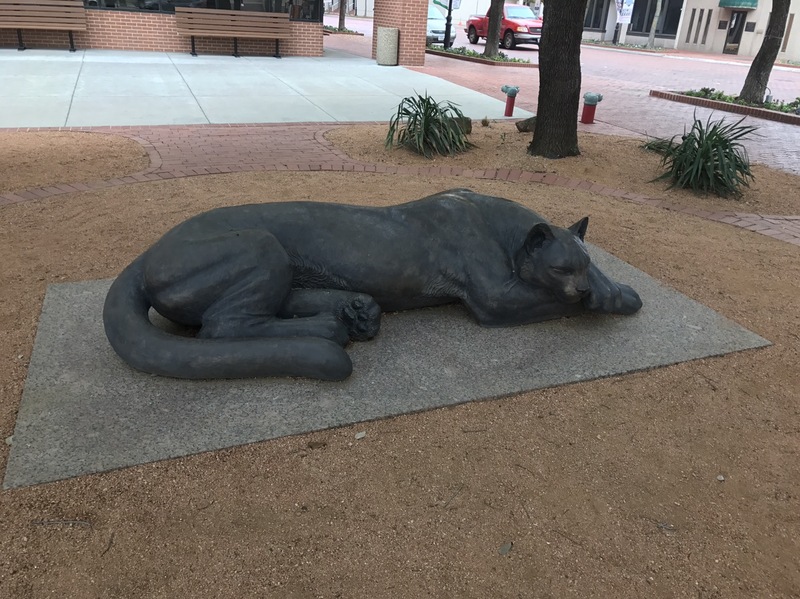 It earned its nickname “panther town” in 1875 when someone saw a panther asleep on the side of the street across from the courthouse! The town was so quiet the panther wandered in and took a nap! A statue across from the courthouse marks that spot today. 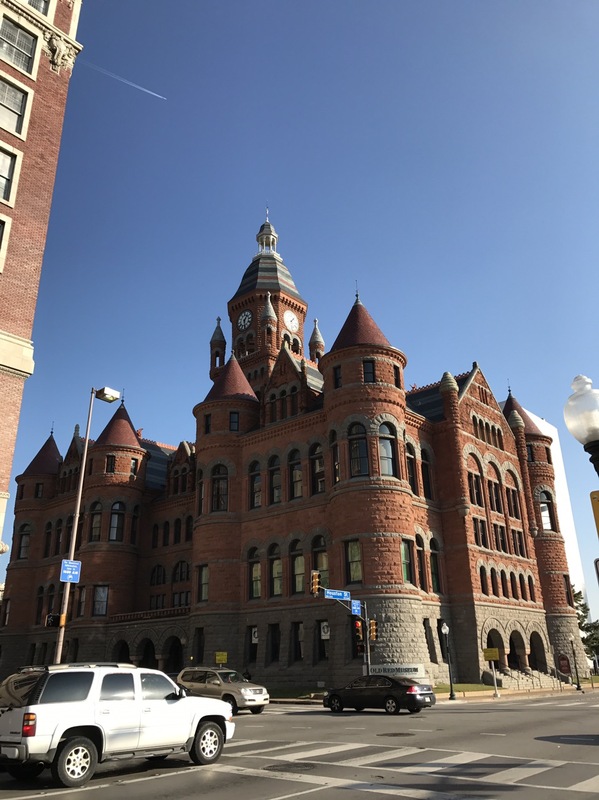 Fort Worth – through inaction or deliberate choice – resisted the urge to tear down its historic buildings like Dallas did.. Consequently, and in a huge contrast to Dallas, Fort Worth still has an interesting and even charming downtown area. Old buildings are still occupied. They offer shopping, dining, and even residential spaces. This building had a dome complete with waterfall and palm trees on the roof! Evidently Fort Worth sends all the homeless next door because we didn’t see any. Nor were we constantly watching where we stepped! Many of the buildings have an art deco theme. I don’t know about you, but I find art deco an immensely pleasing style of architecture and design. Sure, its dated but much like Greek and Roman architecture, it has a timeless quality. 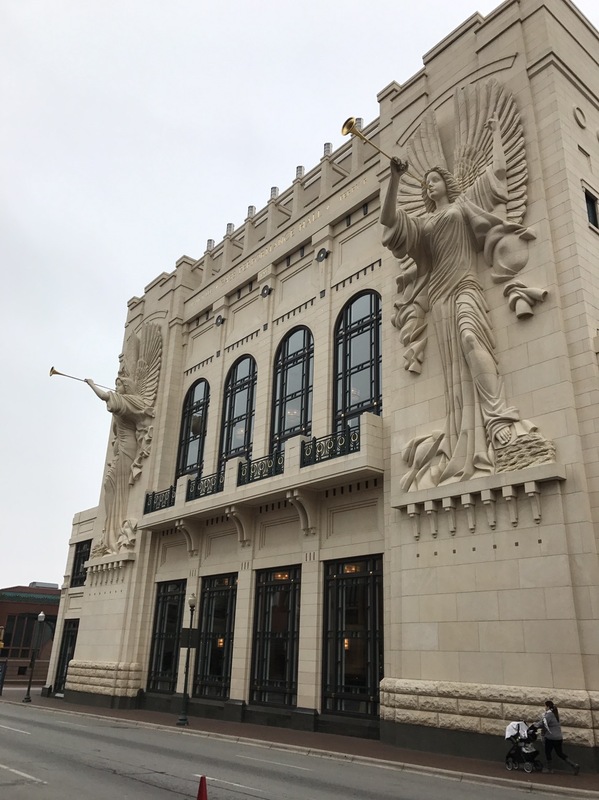 The design of Fort Worth’s opera hall is especially impressive! 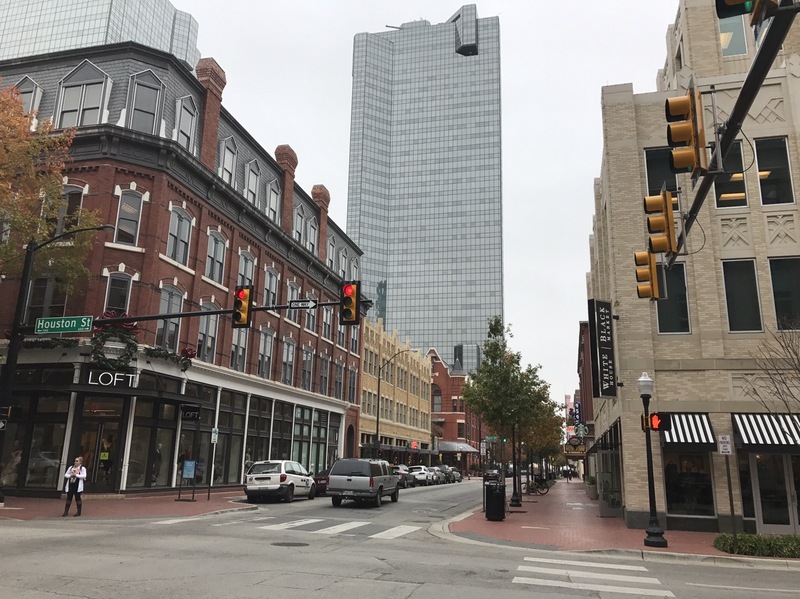 We were quite impressed with downtown Fort Worth! Heather had read about a place called the “Water Park” so we set out to find it. 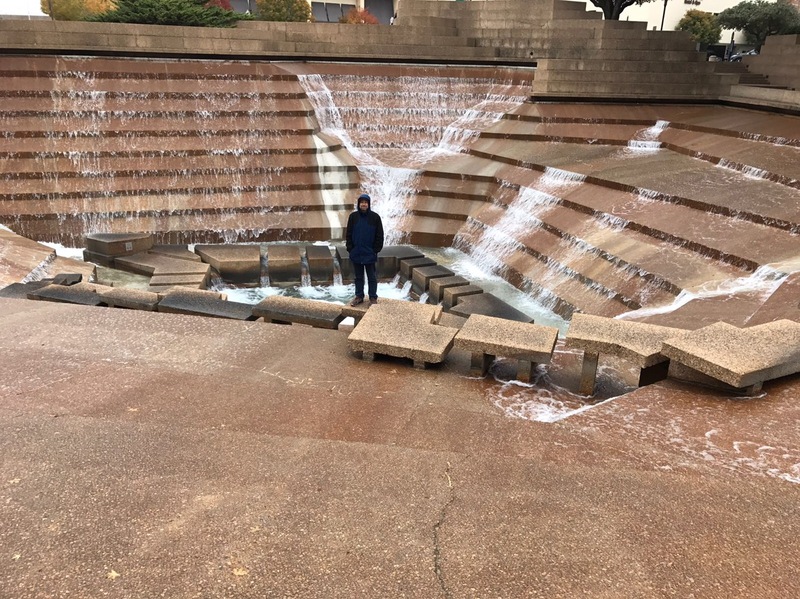 It is a few blocks away from the main downtown and is an entire city block converted into an urban oasis of water. 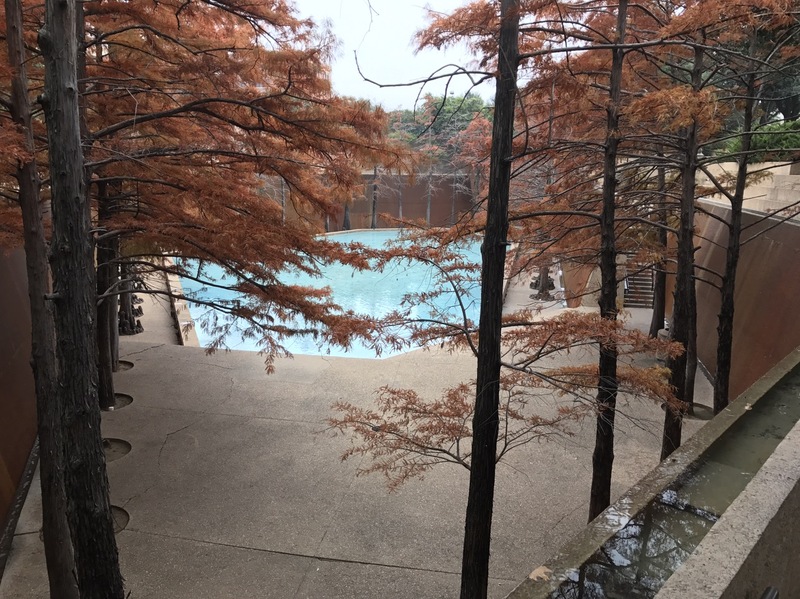 The park features a giant reflecting pool, sunken down 20 feet into the earth and bordered by trees. Nearby is the mist platform. Fountains spray mist intended to create the illusion that a person could walk from one side of the fountain to the other on a floor made of mist. I am not sure if they 100% got that right but it is an interesting visual. On the other corner of the Water Park is a waterfall pit or grotto. Yeah, grotto sounds more interesting than “pit.” Lets go with grotto. Water cascades down a series of steps to a triangular pool at the bottom of the pit, er, grotto. If you look closely, there are a series of slippery and dangerous looking small platforms that form a sort of rudimentary staircase down into the pit. Dangerous? Slippery? Rudimentary? Yes! Let’s try those out!! I am happy to report that neither us fell and busted our cans or required stiches. I’m also happy to report no odd issues with smell. 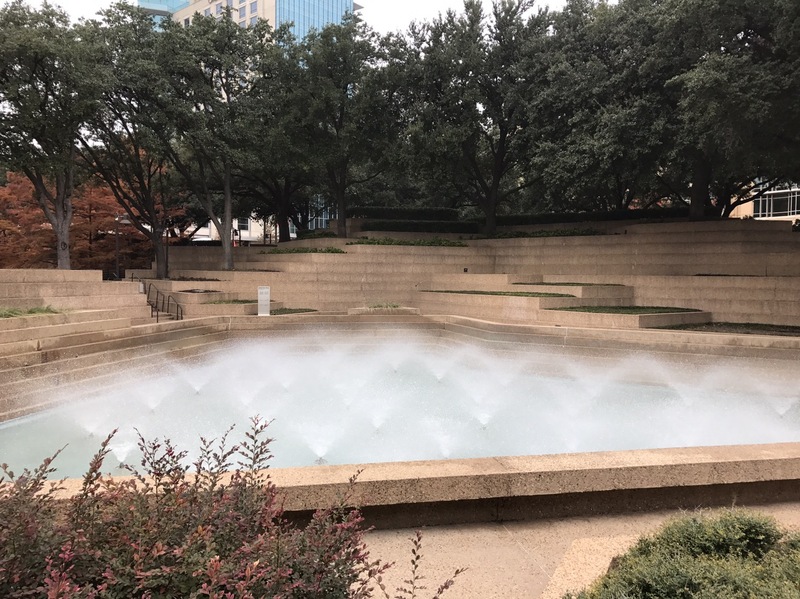 If this were in Dallas, it would be a giant, constantly flushing outdoor toilet rather than an enjoyable water feature. Thanks to the cold weather and overcast skies, we had the place to ourselves. I can imagine the Water Park being very busy in the summer. 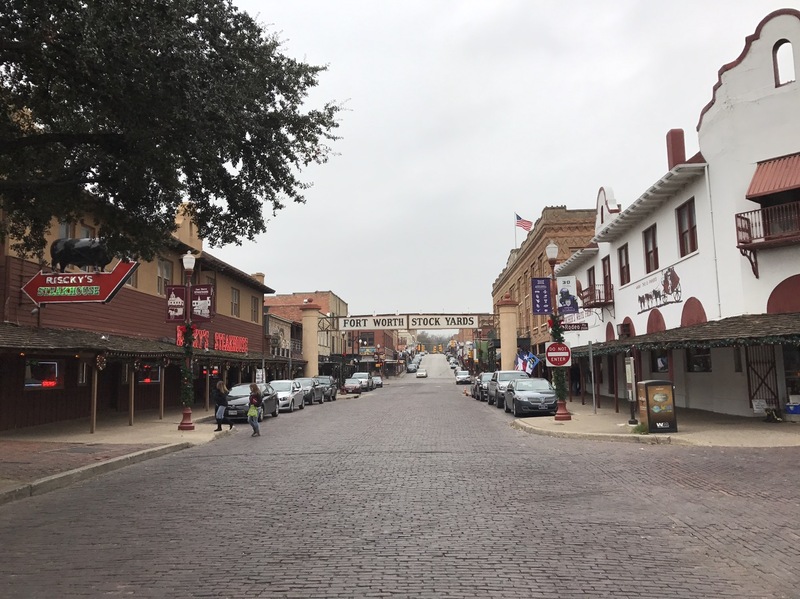 Just a few miles from the downtown are the historic stockyards and Fort Worth’s equivalent of Beale Street. 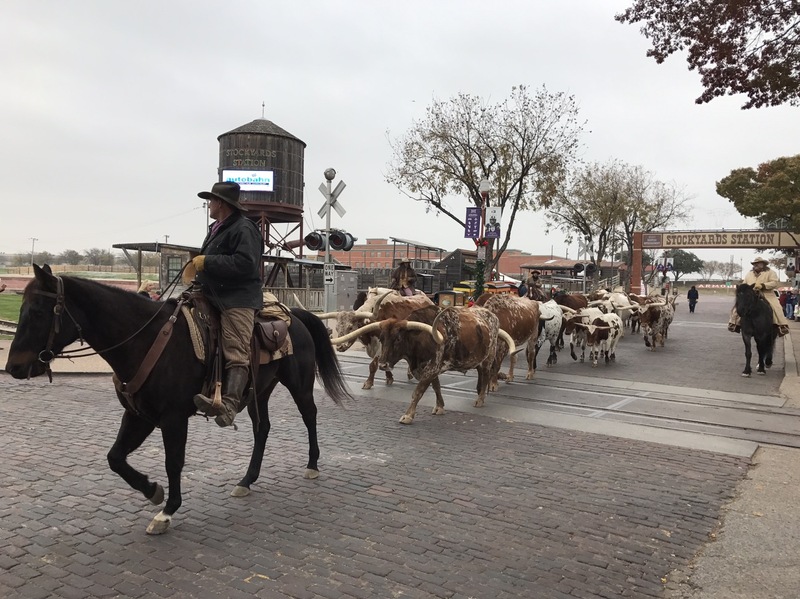 We had heard that live cattle drives take place daily and of course we had to see that! 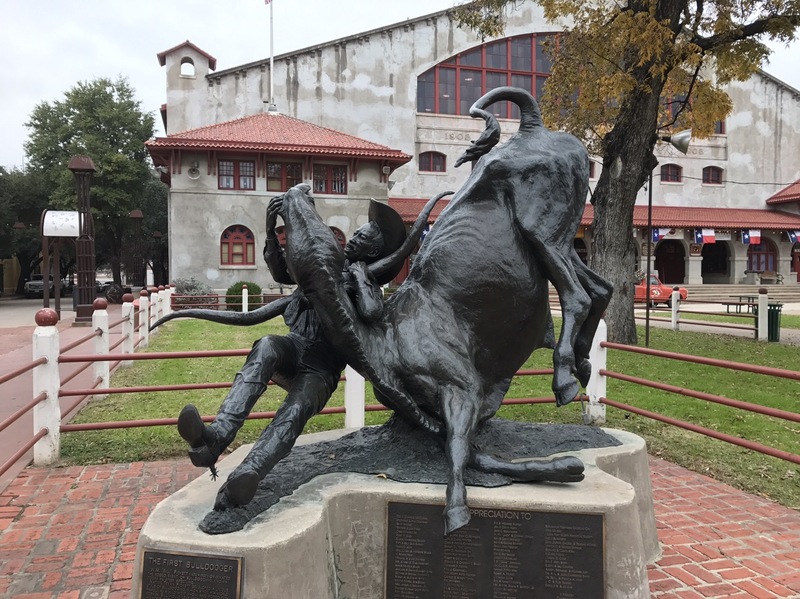 Outside the stockyards is a massive sculpture of a cowboy wresting a steer. We huddled in our coats in the 40-degree weather and waited for the cattle drive. 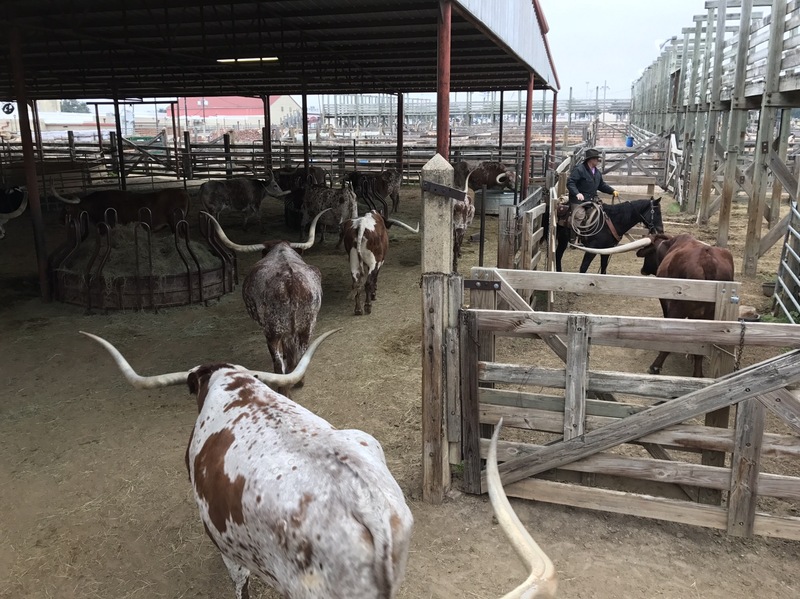 It didn’t take long before cowboys led a heard of mighty impressive Texas longhorns through the street and back into their pens. While the stockyard IS an active cattel lot where cattle are bought and sold, these steers are permanent residents. The old historic part of town was really cool. 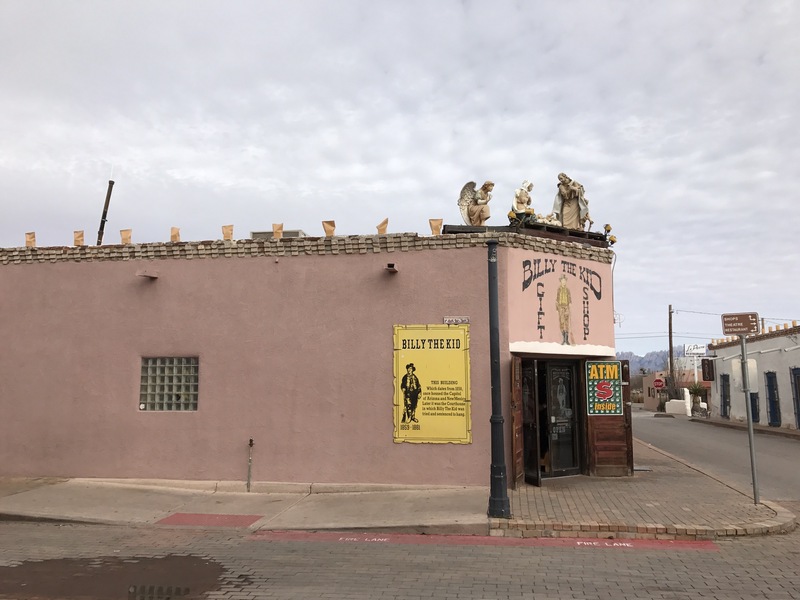 Legit western stores, historic frontier hotels, Texican restaurants, and country bars are everywhere. There is even a cowboy museum! Unlike Dallas’ “historic area” (and I use the term loosely in the case of Dallas) there was no TGI Fridays. I have to say the enchiladas were some of the best I’ve ever had, and the whole meal was a mess of Tex-Mex deliciousness! I’m very glad we stopped in Fort Worth and shocked at how lousy Dallas is. 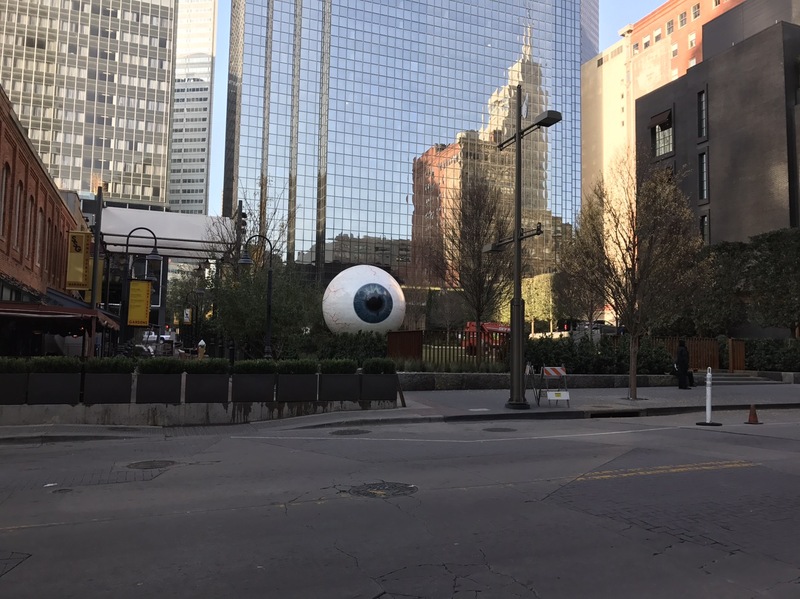 Normally I find something to like about most places, but downtown Dallas is really not a great place for visitors. 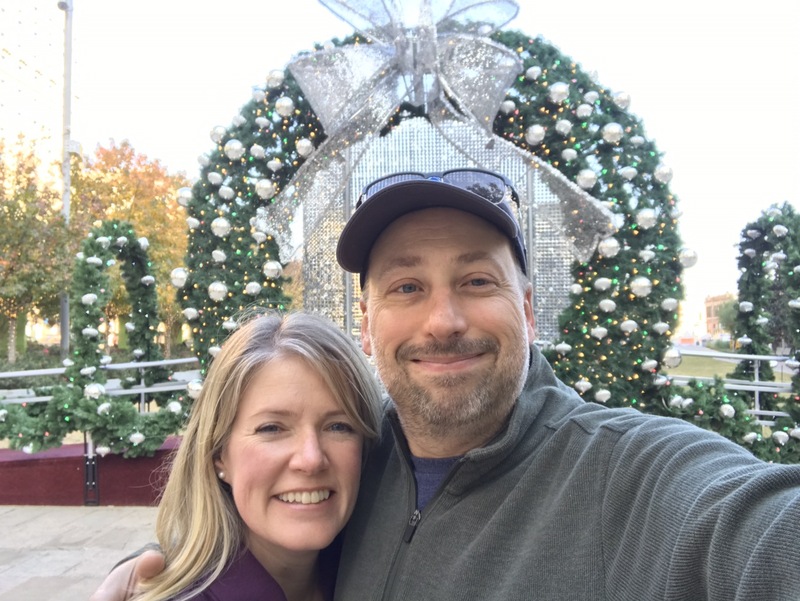 If your airline ticket says DFW, spend your weekend at the FW and forget the D.
We had planned to stop in Little Rock for a few days on our way from Memphis to Texarcana to Dallas. Unfortunately the weather was still not cooperating. The large cold front we had seen on the weather channel was confirmed and heading our way. Low temperatures were forecast to be in the low 20s with highs right around freezing on the day we would be driving IF we stopped in Little Rock. As I said before, its one thing to have temps like this if we are parked, its another to be driving when the air is below freezing. 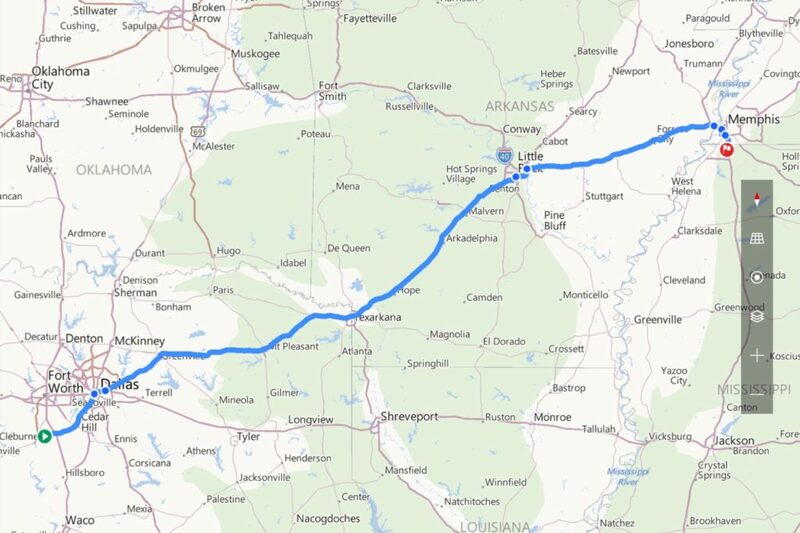 So, we altered our schedule and drove straight past Little Rock. I’m not sure what there was to see but it will have to wait until our next trip. The first 50 miles or so of road from Memphis is pretty bad. Mostly because the pavement itself is very rough. 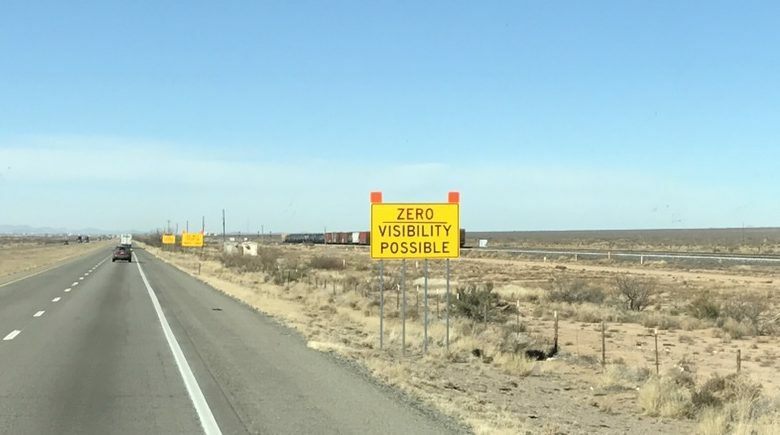 Not as bad as the road from Carlsbad NM to Pecos TX, though. THAT road remains our single worst stretch of pavement. Still, it made for a bouncy first hour. For some reason that stretch is also a major truck route and at least half the vehicles are big rigs. That doesn’t bother me anymore though, as we’re just as big as those rigs. 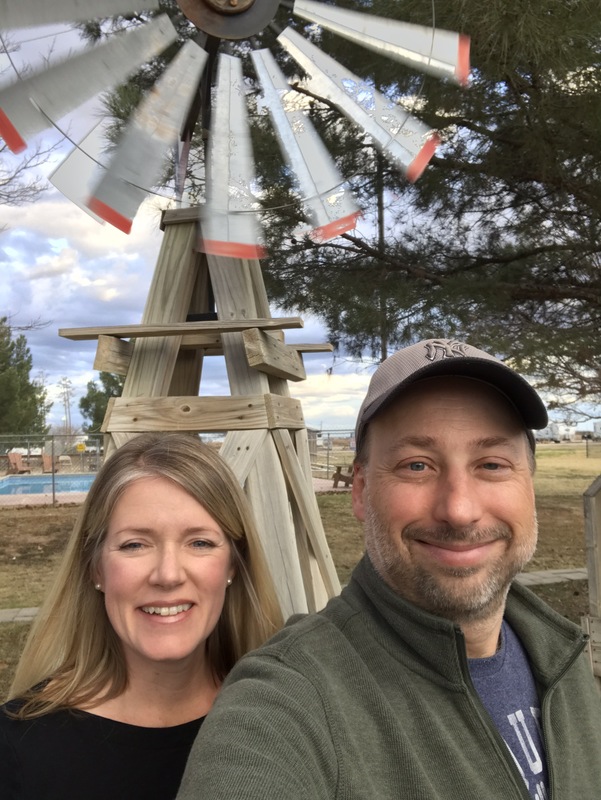 We drove to Texarcana, pulled off the highway to the KOA there, which is literally on the side of the highway, and prepared to stay a single night. We had a pull through site so we didn’t even bother to unhook the Jeep. Highway noise doesn’t really penetrate our MoHo so we had a nice quiet night too. Most of the people stopping here are doing the same thing we are. The campground was maybe 1/5 full when we pulled in, 2/3 full by 10:00pm, and then 1/5 full as we pulled out the next morning. The next morning all we had to do was raise the jacks, pull in the slides, fill the air suspension, and drive away. The drive from Texarcana to Alvarado TX wasn’t bad. Alvarado is about 35 miles southwest of downtown Dallas. We used the outer ring roads and never had to go near downtown Dallas and its notorious traffic. In fact, once we cleared the Southern Dallas suburbs we saw that Alvarado area is sparsely populated. It is home to a couple of gas stations, 4 or 5 fast food joints, and the largest volume RV dealership (MHSRV) in the USA. Our campground was just next to Alvarado in a little town called Keene. The campground office was also a video store. I walked inside and couldn’t believe my eyes! Talk about a blast from the past! I didn’t know video stores still existed! Well, they do still exit in Keene Texas. However, the complete and total lack of customers is a reminder of the reason there are no more video stores. 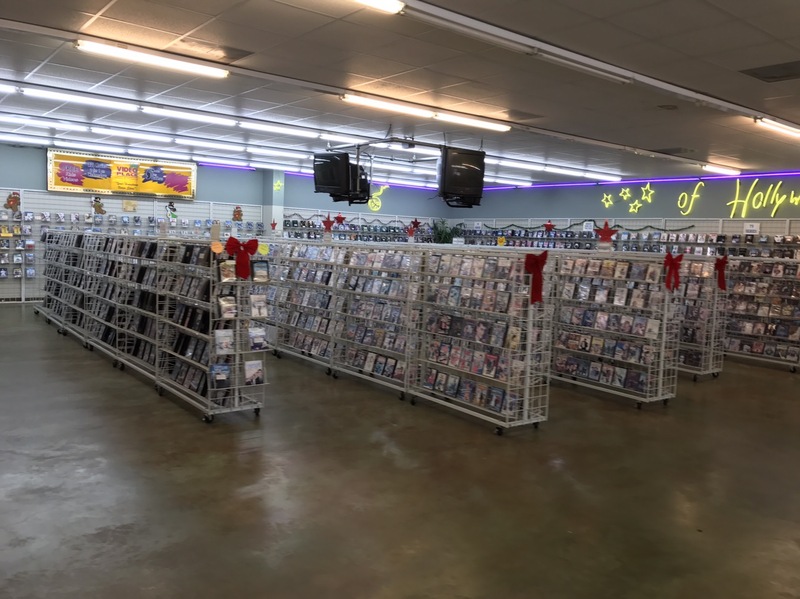 This may very well be the last video rental store in the world! The campground itself was a mix of temporary travelers like us and a lot of permanent residents. I suspect most of the permanent residents are working on one of the MANY road construction projects in the area. We had to be at the RV Service center by 7:00am, and it was a 20 minute drive. Getting up at 6:00am in the cold reminded me too much of work!! Yikes! 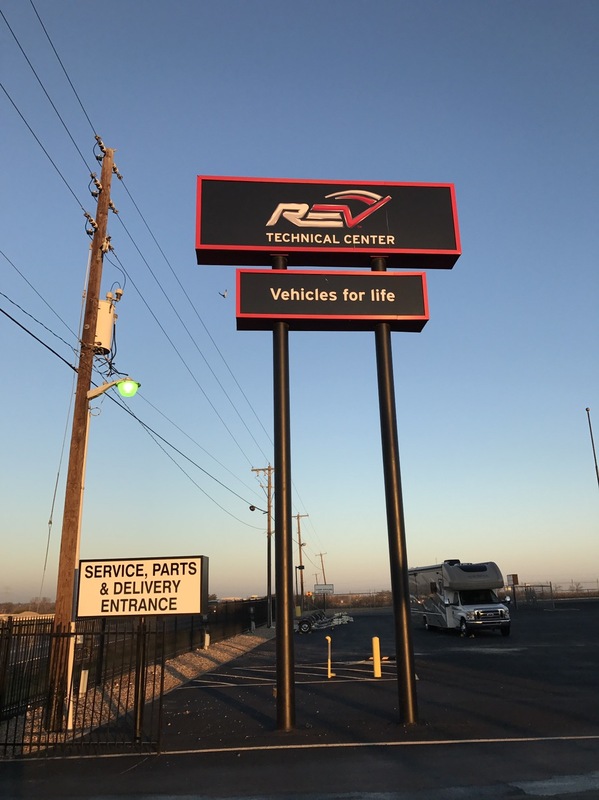 The REV Technical Center is an old RV dealership that REV purchased and repurposed in to a factory maintenance center. It is actually right next to MHSRV. Due to Texas law we were technically having work done by MHSRV. Vehicle manufacturers cannot setup shop directly in Texas – only independent dealerships. Tesla found this out the hard way. We pulled into the parking lot at 7:05am and went inside. Justin, our service advisor was ready and I explained all of the steps that had been taken to address the leak and I pointed out my paper-towel-and-painters-tape solution. We were the only vehicle brave or foolish enough to showup at 7:00am, so we had the entry area to ourselves. This center is constantly full though, although December and January are their slowest months. Wait times for some of the centers, like the Coburg Oregon center, approach six months! Because of the low temps, we had to bring the birds inside the waiting room. The offices for the sales guys from back when this was an RV dealership were still there. It was cold in the little office we picked out so we brought in a little space heater and tried to keep ourselves and the birds warm. 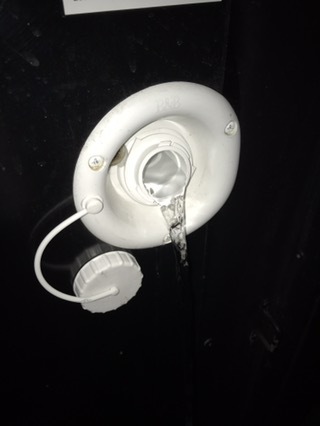 The technician came in and showed me photos he took with his iPhone of the unsealed opening behind our door awning as well as cracks in the sealant used between the awning and the body. Unbelievably after 3 different dealerships, one of which had the whole awning removed, had not addressed the issue. Let’s hope this is FINALLY fixed! I have some hope because ever since we bought our MoHo the passenger main slide groaned like a pig being crushed to death when it was extended or retracted. I am not an RV mechanic but I have checked several times and the pigs we transport are nowhere near the slide. So it had to be slideout parts rubbing. Davis and Albuquerque dealers said that it needed to be lubed and sprayed some lubricant on the slide which didn’t do anything. They might as well have been spraying air freshener on them. Actually that might have been better. Sure, the noise would still be there but the smell would be better! In Sanford the dealer said that “they all do that.” Right. Well, the Alvarado factory tech said it needed to be lubed and the job is fairly complicated and takes close to an hour. Based on the previous attempts to lube it, I wasn’t expecting much but I had them do it anyway. After we got the coach back, I was shocked when I pulled in the slide and it was completely SILENT! Wow! 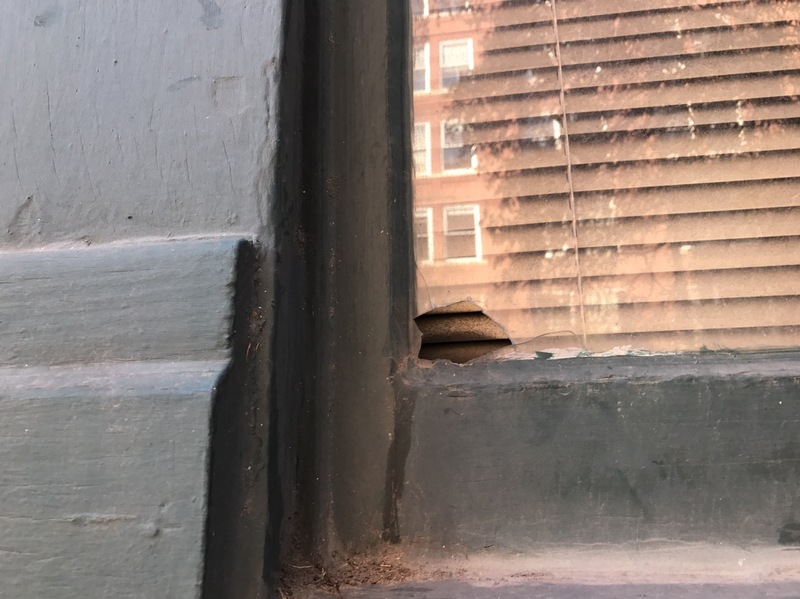 Now I’m really optimistic that the window leak was finally fixed. They clearly know what they are doing. Incidentally, this frustration with RV dealers is driving the major RV manufacturers to setup their own service centers. I can certainly see why. The total repairs took about 7 hours. Since we didn’t know how long the repairs would take, we have some extra days in the area. I think we will go see Dallas and Waco! We kept our eye on the weather. 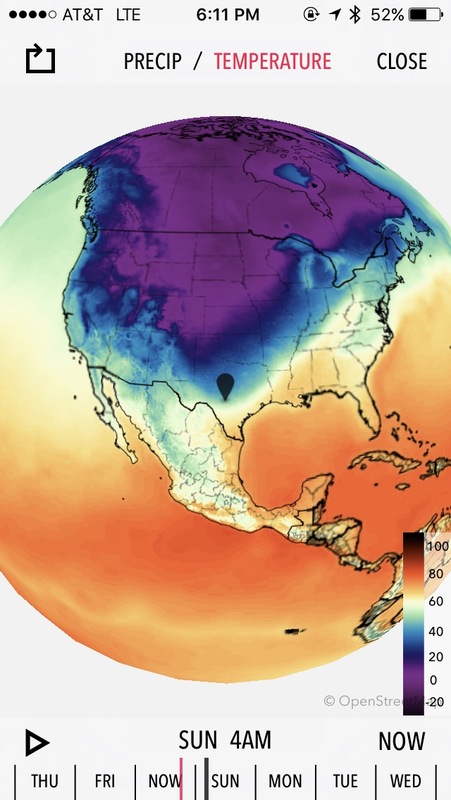 A massive cold front had crossed the Canadian border and was rapidly chilling the US. 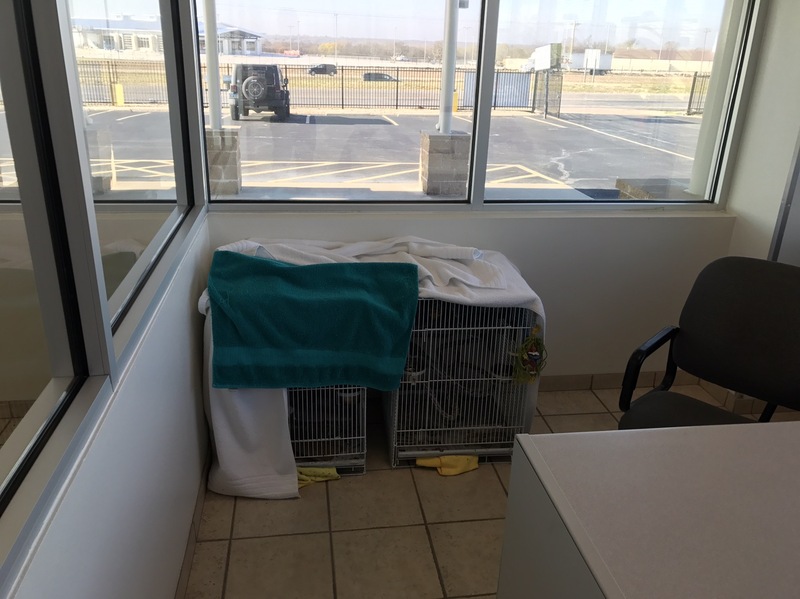 We have a date with Dallas – Alvarado actually – to get our window leak fixed. After 4 unsuccessful dealer visits and still leaking, it is time to let the factory have a crack at the leak. We made the appointment for Dec 12th back in September and we are NOT going to let weather cause us to miss our slot! So we’ll keep an eye on that weather. Meanwhile, we had a day to see the rest of Memphis. 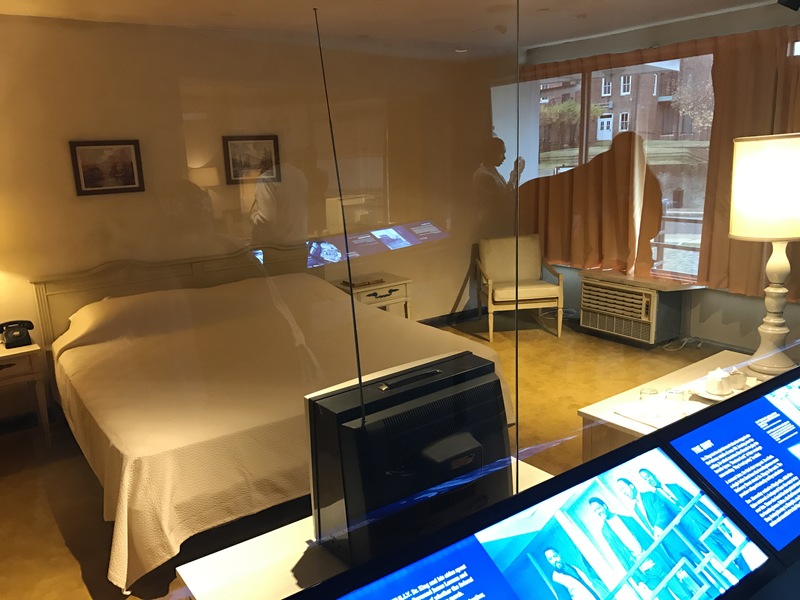 Our first stop is the National Civil Rights Museum, located at the Lorraine Motel. In 1968 Memphis was at the epicenter of the Civil Rights Movement which had been igniting tensions all over the South for years. On February 11th, African-American sanitation workers had staged a strike, filling the streets of Memphis with garbage and sending tempers soaring. At the time, black sanitation workers were paid significantly less than their white counterparts. Newspapers reported his presence along with photos showing him standing on the second floor balcony with the room number clearly visible in the background. His two light-colored cars were parked below. 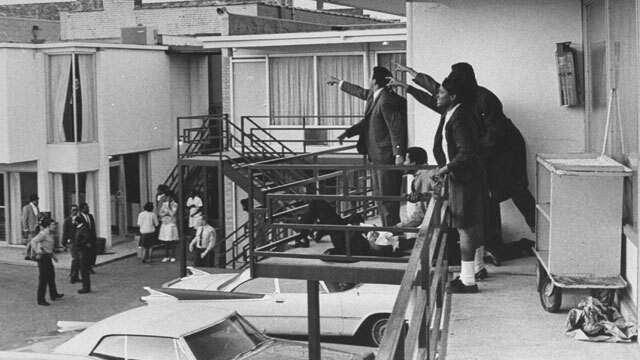 On April 4th at around 6:00pm, King stepped onto the balcony outside room 306. 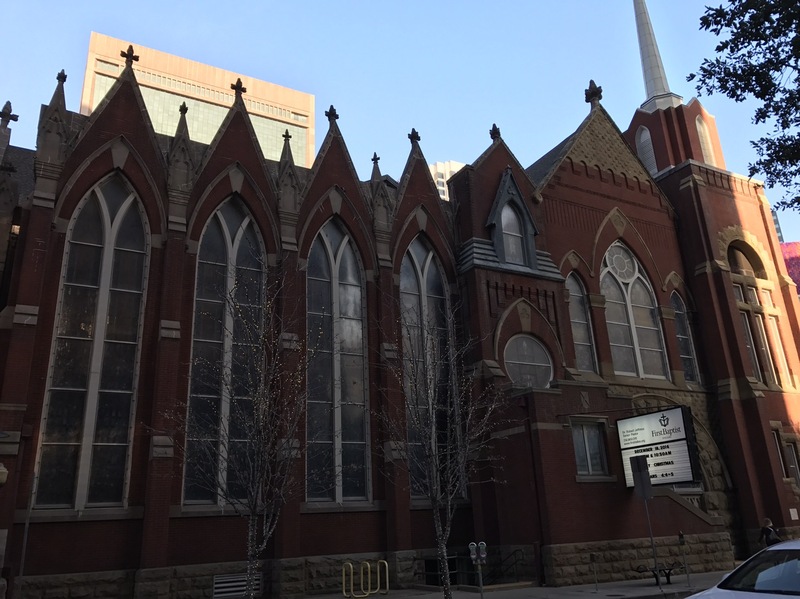 He stood near his room and spoke with musician Ben Branch about which hymn to play that evening. Suddenly, a shot rang out and King fell to the floor! Police had been assigned to protect King and were already in the parking lot below. Witnesses pointed toward a boarding house across the street. The small bathroom window visible in the upper right of the dark brown building across the street was slightly open. Police frantically searched that building for the assassin. Meanwhile, King never regained consciousness and passed away. The spot where he fell has been marked with a small square. Across the street, it was obvious that the boarding house provided the perfect sniper’s nest. The window looked right at the Lorraine Motel. A shooter looking for room 306 would have a clear shot from an elevated position. Police would start a manhunt for the assassin. One of occupants of the boarding house quickly became the prime suspect. He had used a pseudonym but police realized he was called James Earl Ray and was already wanted for escaping prison in Missouri in 1967. Ray led police, which now included the FBI, on an international chase. Ray was eventually captured in London two months later. Ray plead guilty to the murder to avoid a trial and the possibility of the Death Penalty. Three days later he recanted his confession. Ray maintained his innocence and continued to seek a trial until he passed away in 1998 at age 70. By 1992 the Lorraine Motel had fallen on hard times and was facing bankruptcy. 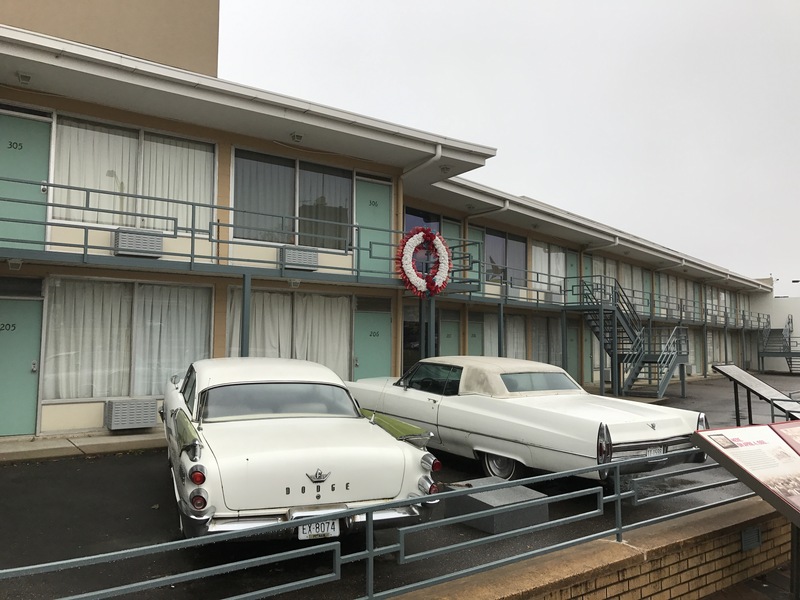 A group working with the Martin Luther King Jr, Foundation bought the Lorraine Motel. 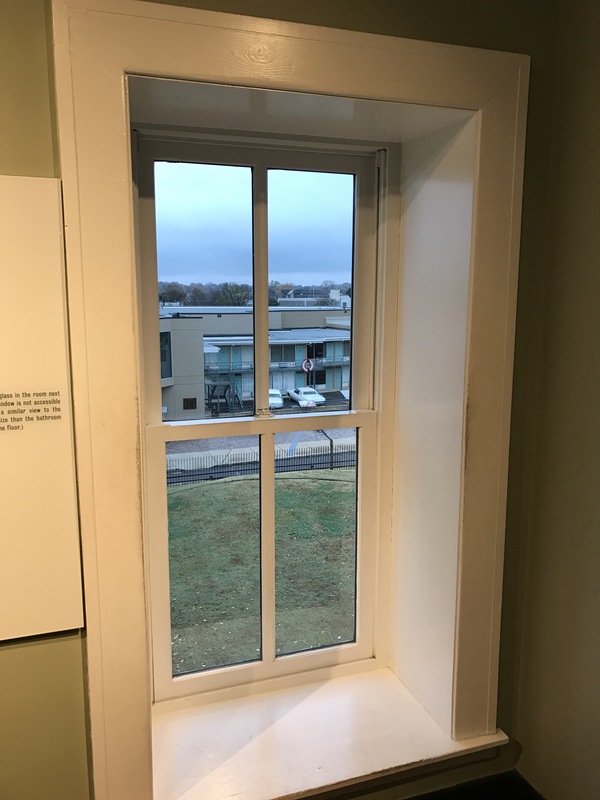 By 1998, the last tenant was evicted and work on a new museum chronicling the history the struggle for civil rights began. 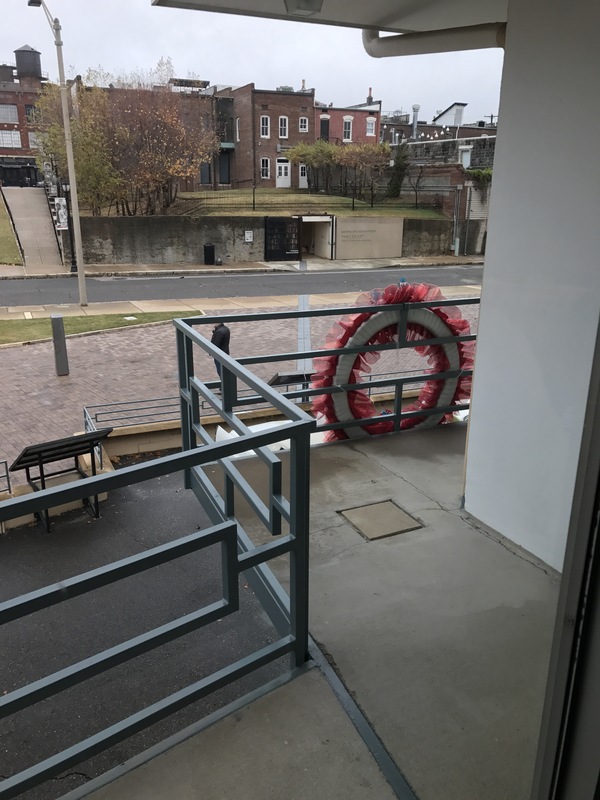 In 1991 doors opened on the National Civil Rights Museum. Today, the museum is a Smithsonian affiliate and a world-class exhibit space. The museum traces the civil rights movement from the slave trade all the way to present day. 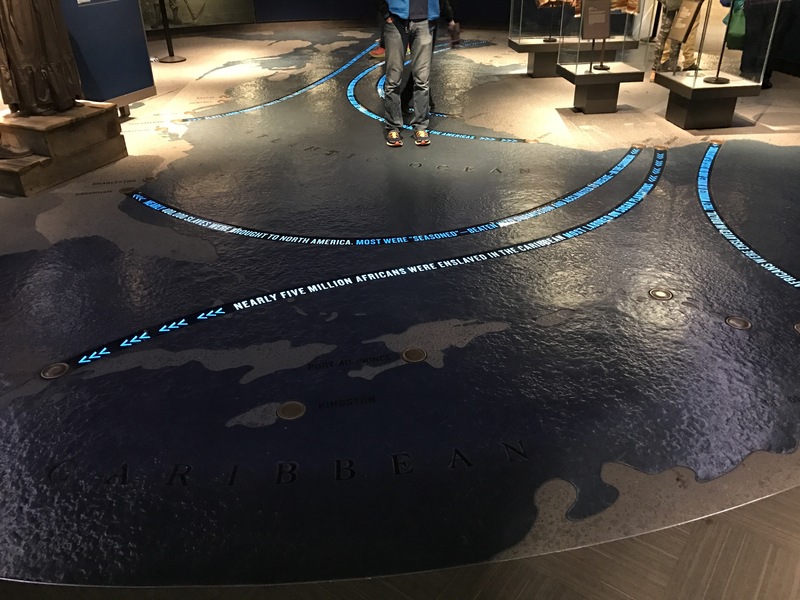 Visitors to the Museum begin with an overview of the slave trade. Because of our visits to other sites in the South, particularly Magnolia Plantation in Georgia, we knew that 90% of the slaves brought to the New World actually went to Brazil and not the US. For every African slave that came to the US, 10 were sent to Brazil. The museum does an especially good job on the events of the late 1950s and early 1960s. 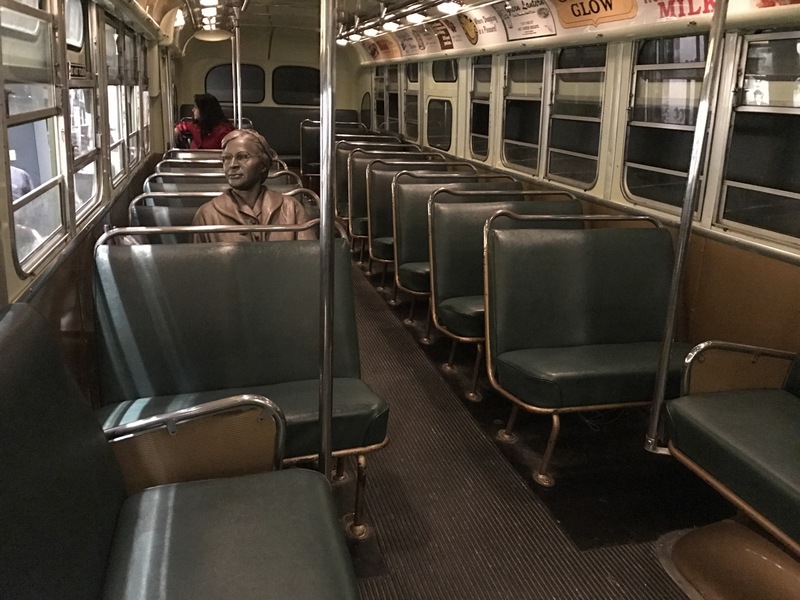 For example, the bus on which Rosa Parks famously refused to give up her seat to a white man is shown complete with a statue of Rosa still seated. 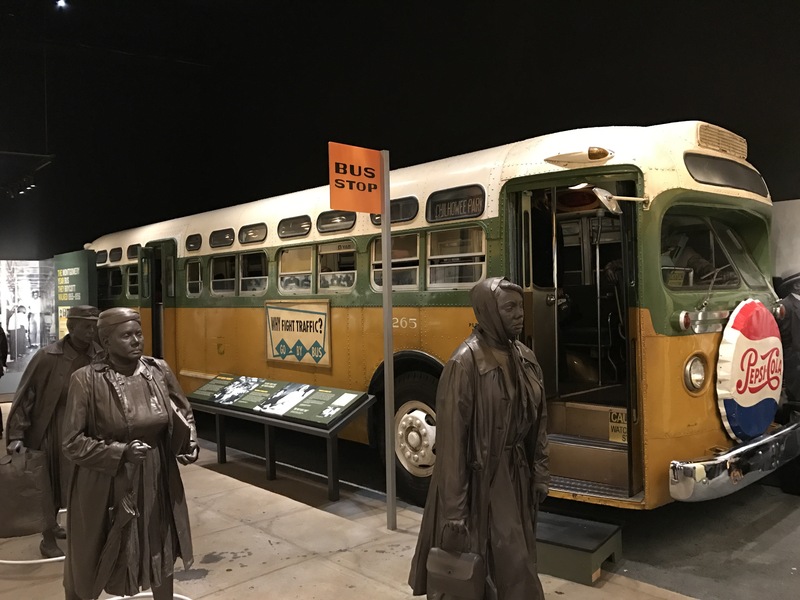 Buses took on a big role in the civil rights movement. They were heavily used by black Americans and were often ground zero for conflicts. None was more significant than the Freedom Riders. Before 1960, many public buses were segregated. Particularly buses travelling between states. Buses for white riders were much nicer and more frequent than buses for black riders. This was in spite of Supreme Court decisions Morgan v. Virginia (1946) and Boynton v. Virginia (1960), which outlawed “separate but equal” segregation. In practice, many Southern states simply ignored the Supreme Court ruling and continued their policies of segregation. The first Freedom Ride began on May 4, 1961. 13 riders (6 black riders and 7 white riders) left Washington DC on Greyhound and Trailways busses. Birmingham Alabama Police Commissioner Bull Connor, collaborating with the Ku Klux Klan, arranged to provide the Klan 15 minutes in which to attack the riders when they stopped in Birmingham. On May 14 – Mother’s Day – the mob attacked. Tires on the buses were slashed and a bus was forced to stop a few miles out of town where it was firebombed. 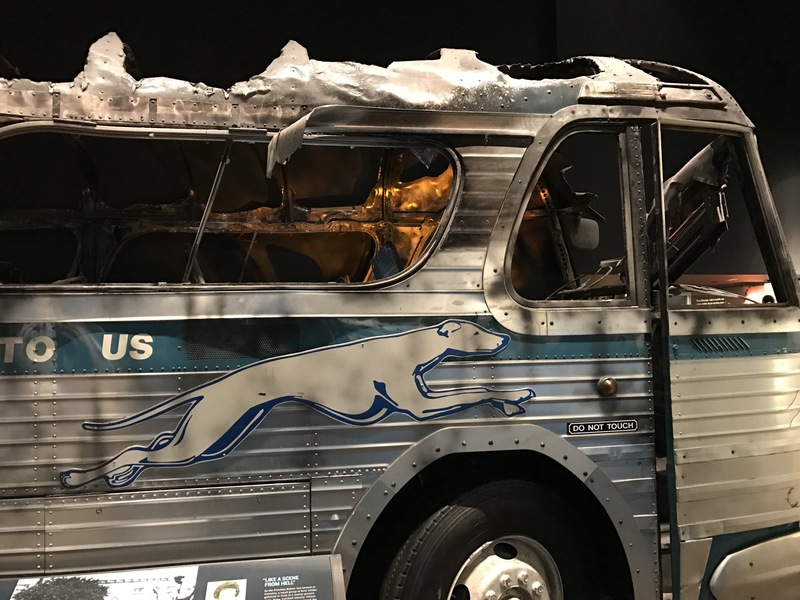 Klan members intended to prevent the passengers from exiting the bus, thereby burning to death inside. However, something startled the Klansmen and they fled, allowing the passengers to escape. The bus burned to the ground. The ride halted at that point, but the attention of the nation turned to Birmingham. One of the last stops in the Museum are the rooms King and Abernathy occupied. Room 306 and 307 are preserved just as they were on April 4, 1968. 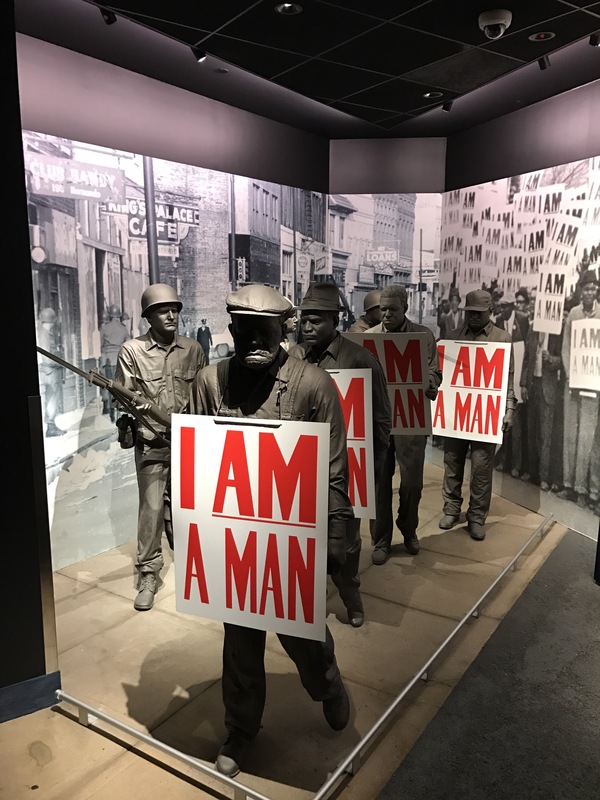 The National Civil Rights museum is a remarkably well presented collection that tells the story of the civil rights movement. I highly encourage you to visit and experience the museum for yourself. It is not possible to leave the museum without feeling an overwhelming sense for the tensions of the period and reflect on the progress we have made…progress that continues. 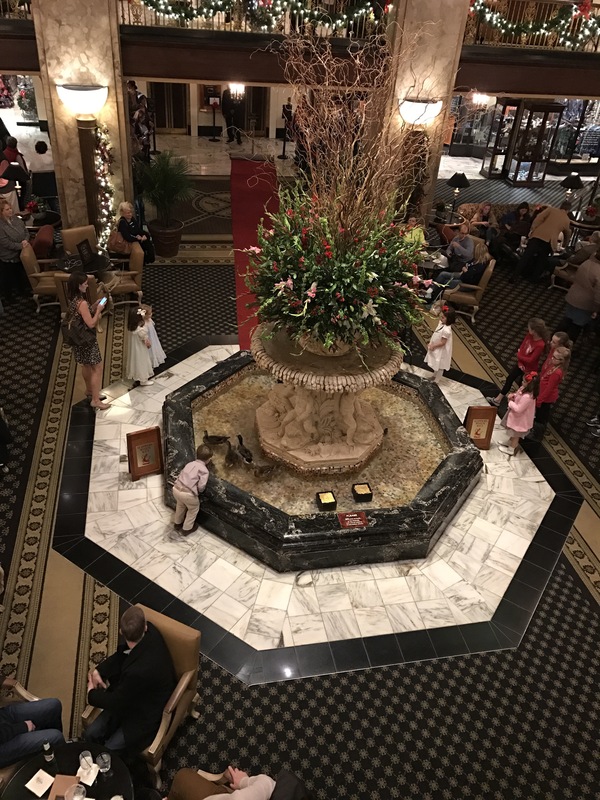 Meanwhile, we wanted to see the famous Peabody hotel and its famous Peabody ducks! 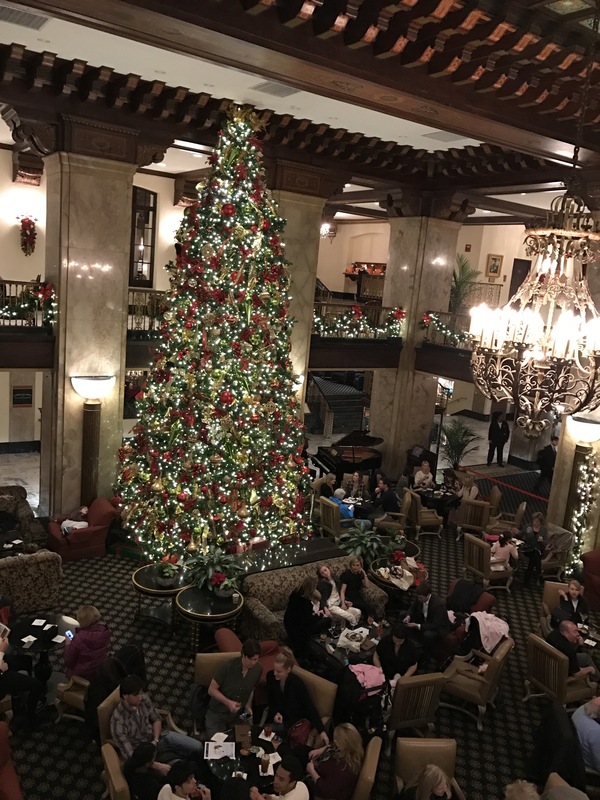 The lobby was festively decorated for Christmas with a giant tree. The famous ducks were on duty in the fountain. They work from 11:00am to 5:00pm. The ducks started as a joke. In the 1930s, the hotel General Manager George Schutt had gone duck hunting in Arkansas. In those days, live ducks were used as decoys and Schutt found himself with a carful of live ducks when he returned to the hotel. Word has it that Tennessee whiskey played a role on the trip as well. Schutt thought it would be funny if he put the ducks into the hotel fountain, which he did. He then went to bed. In the morning, the ducks were peacefully swimming in the founting while hotel staff were frantically trying to decide what to do with the ducks. Guests overheard and begged the hotel to keep the ducks. In 1940, a Bellman and former circus animal trainer named Edward Pembrook volunteered to take charge of the ducks and became the Peabody Duckmaster. He taught the ducks to take the elevator down from their penthouse home and march along a red carpet into the fountain. Strains of “King Cotton March” by John Phillip Sousa play. At 5:00pm, the ducks march back along the red carpet to the elevator again. Pembrook served as Duckmaster for 51 years. We explored the historical room at the Peabody. I looked down and noticed some of the tiles in the floor looked strange. I bent down and sure enough – swasticas! 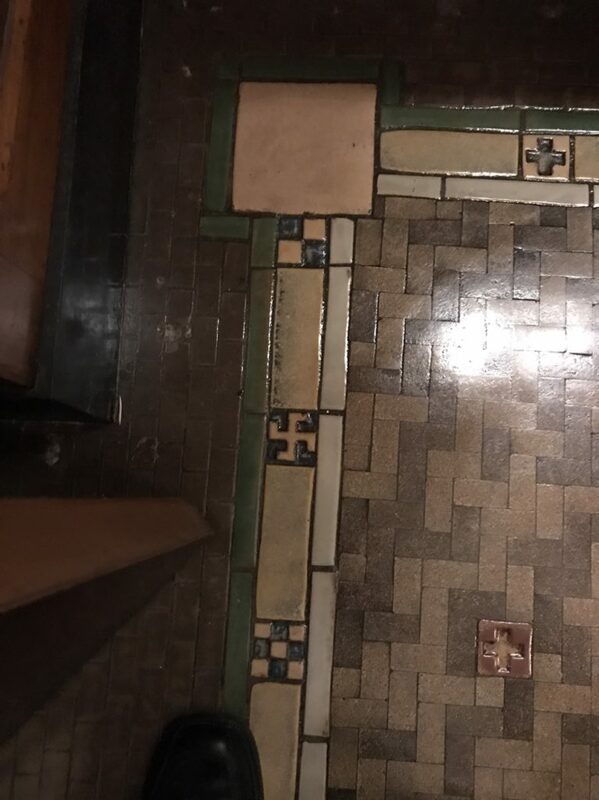 There aren’t any Nazis here though, the tile was installed in 1925. We tend to forget that the swastica symbol has been around for over 10,000 years as a symbol of peace and hope before the Nazi’s used it on their flag. 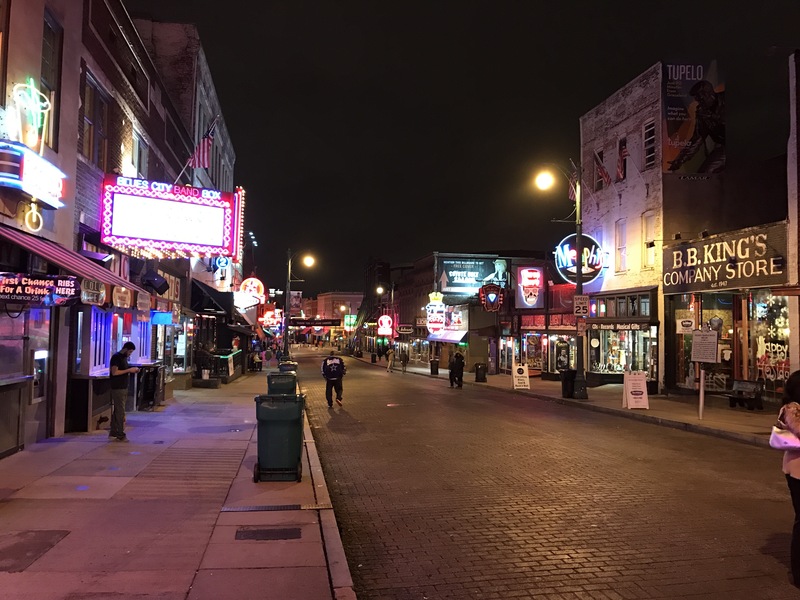 Our last stop was the legendary Beale Street. Weather was cold and the streets were largely empty. The last time I was here, visitors had to pay $20 just to walk past those barricades. Apparently, there is quite a challenge with transients or panhandlers or something, so a cover charge is required. Tonight, it was free and there wasn’t any issue with crowds. 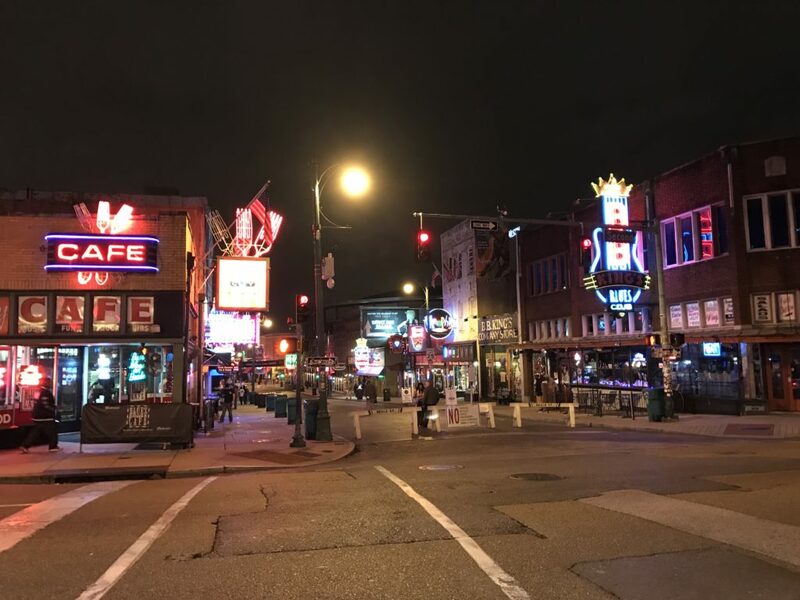 Beale Street is known as the birthplace of the Blues. 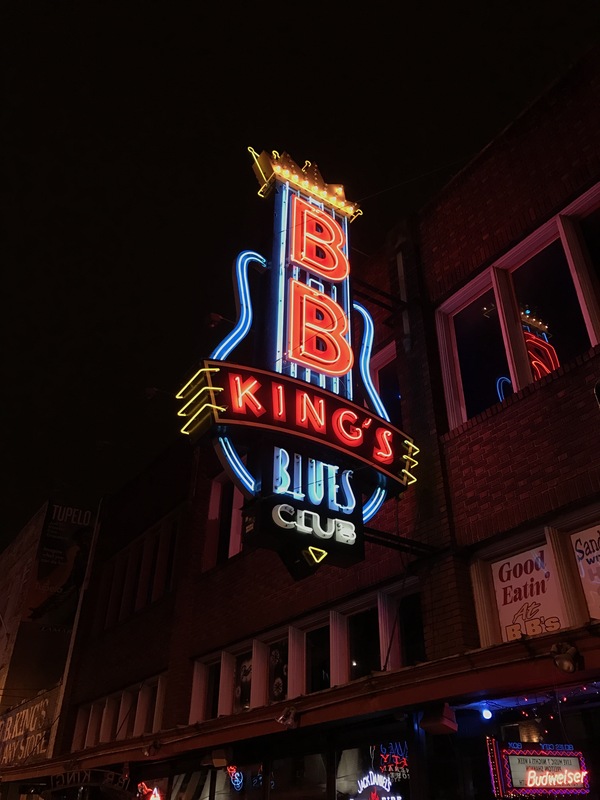 While that may not be completely true, Beale Street is home to some incredible Blues joints. Tonight our destination was BB King’s. BB King died in 2015 at the age of 89 but his memory will live forever. Preston Shannon, the reigning “King of Beale Street” was set to perform. We arrived early and took up seats right at the front of the stage. 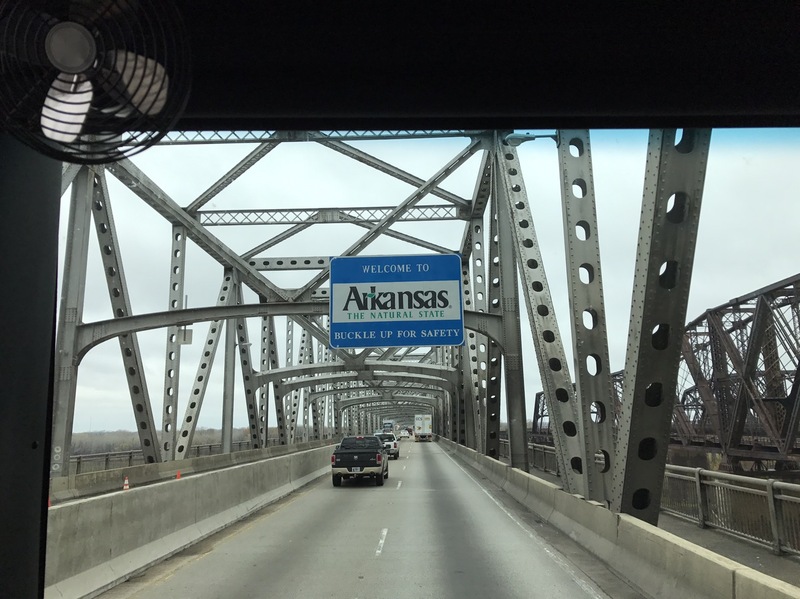 We had a great time in Memphis, but we need to hit the road to avoid that cold weather. Its one thing to be parked in below-freezing weather. Its another to be driving in it. We pulled into the Memphis Jellystone campground, which is actually in Mississippi just across the state line. 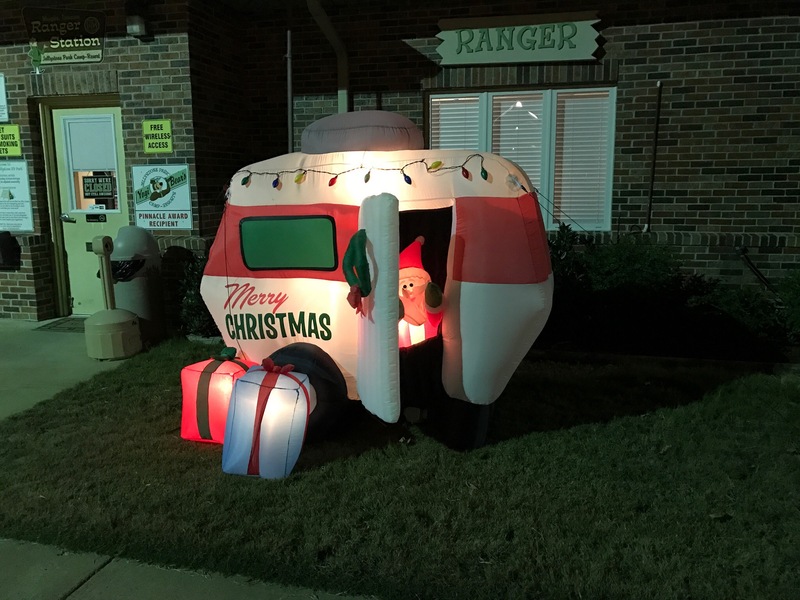 Santa and his inflatable camper, complete with air-activated door, was there to greet us. Getting out of Nashville was just as messy as getting into Nashville. It felt like we were just driving from onramp to offramp to onramp for about 15 miles as we crossed from one side of the city to the other. Fuel stops along the Interstate are always busy and this legs was no exception. We tend to prefer Pilot/Flying J above other fuel stops and clearly a lot of other people do to. They are always busy. Several reasons. First, our Good Sam card gets us a discount per gallon on diesel. Flying J also has a rewards card which enables us to exceed $100 max transaction at the pump. Now, you might not have thought about the per-pump max charge since back in 2008 when gas was $4.50 a gallon ( in California). With prices about half that, few cars or trucks will reach $100 to fill up. However, our MoHo has a 100 gallon fuel tank, and while I never let it get lower than 1/4 (and usually no lower than 1/2), that’s still a hefty tab. Without the ability to exceed $100, we have to fill up with $100 worth of fuel and then start a second transaction for the rest. Also, Flying J is friendly to RVs. Not all truck stops are. 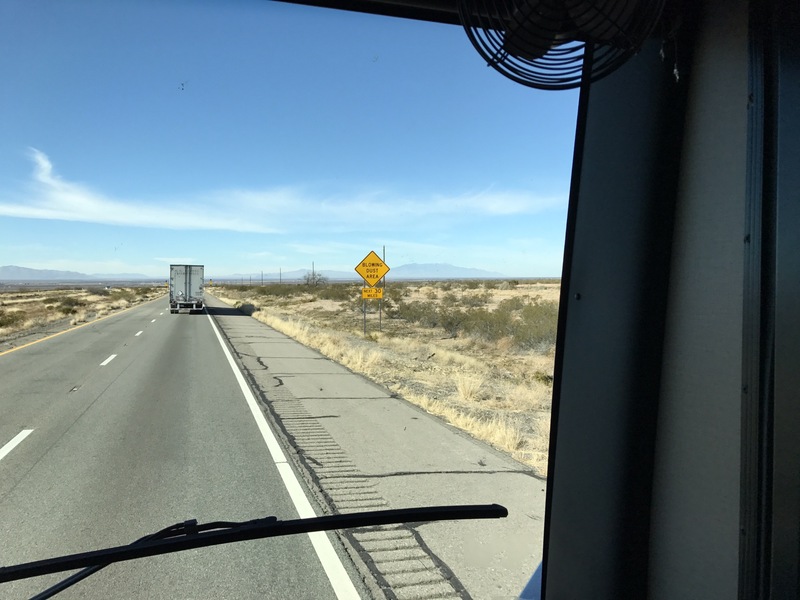 Some are outright hostile to RVs pulling into the diesel truck “big rig” lanes, although for the life of me I can’t understand why. Our money is just as green as the truckers. We have never been refused service, but a couple of places were less than cordial. That’s rare, by the way. But it happens. 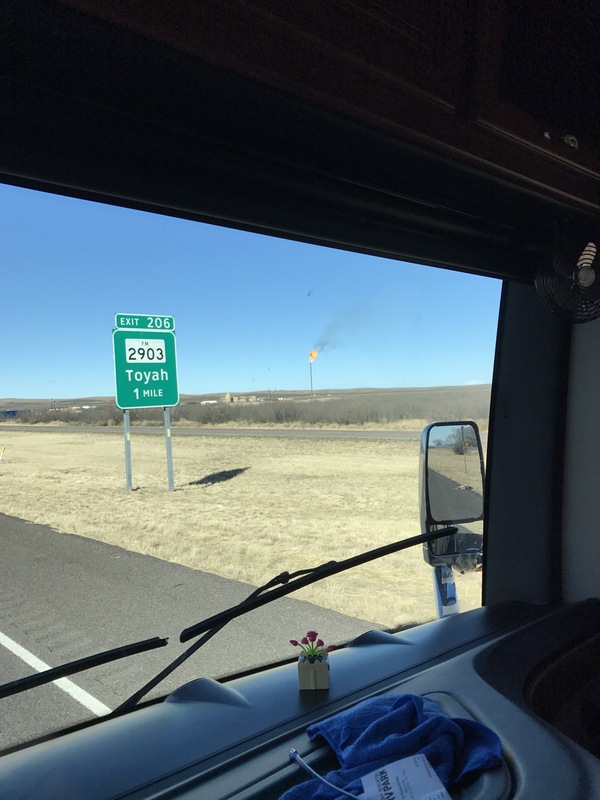 Flying J is very open about RVs being able to use the big rig lanes anytime. Anyway, we made it and set out for some Memphis sightseeing. In cold drizzle we made our way to home of the King. 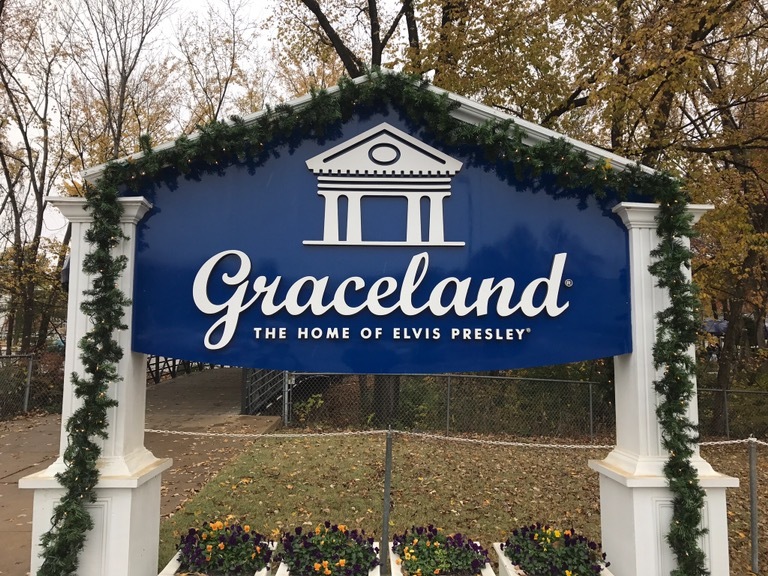 Which I suppose makes Graceland a Castle? One of the beautiful things about living MoHo is touring in the off-season. We’ve tried to do that whenever possible with all of our travels and generally we have been much happier with our trips because of it. The parking lot was almost completely empty and there were no lines of any kind when we arrived. Which is good because Graceland gets BUSY in the summer. 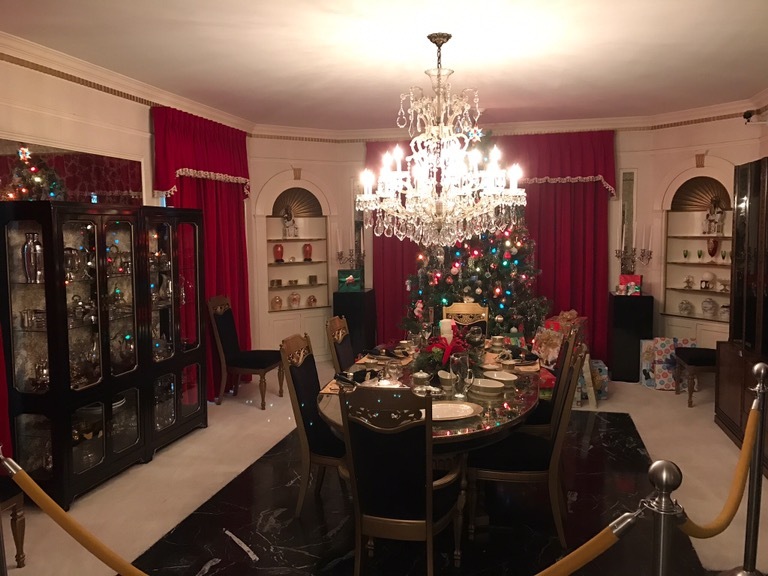 We, however, strolled right into Elvis’ living room. Tours are almost $50 per person. I guess even in death the King still knows how to make money. We were given iPads with an interactive self-guided tour. The last time I was here (almost 20 years ago), we had a tour guide who rushed everyone through the house. The new format allowed us to wander through at our own pace. 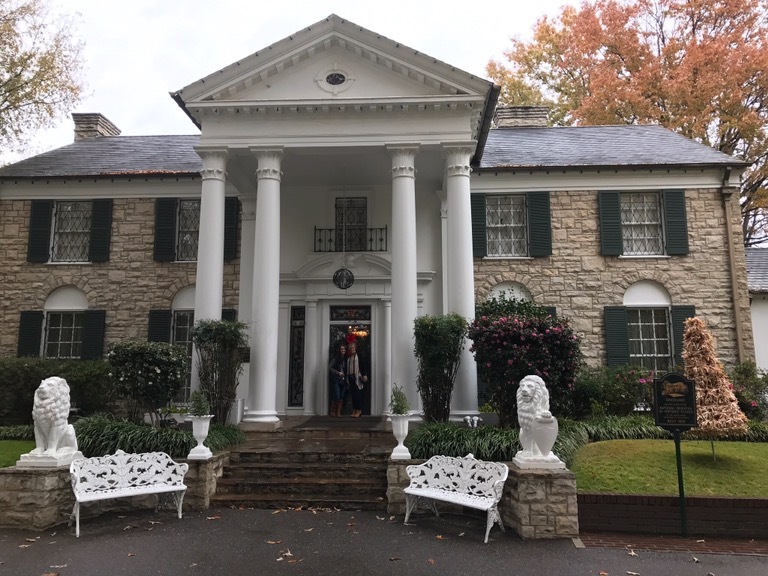 As we walked through the front doors, I was immediately struck by how home-like Elvis’ house is. I mean, this guy was THE most successful recording artist in history. His record for, uh, records remains unbroken to this day. Literally no musician has sold more albums and had more hits than the King. On top of that, he starred in close to 30 movies. I expected his house to be over-the-top, like one of those mansions we saw in Newport a few months ago. 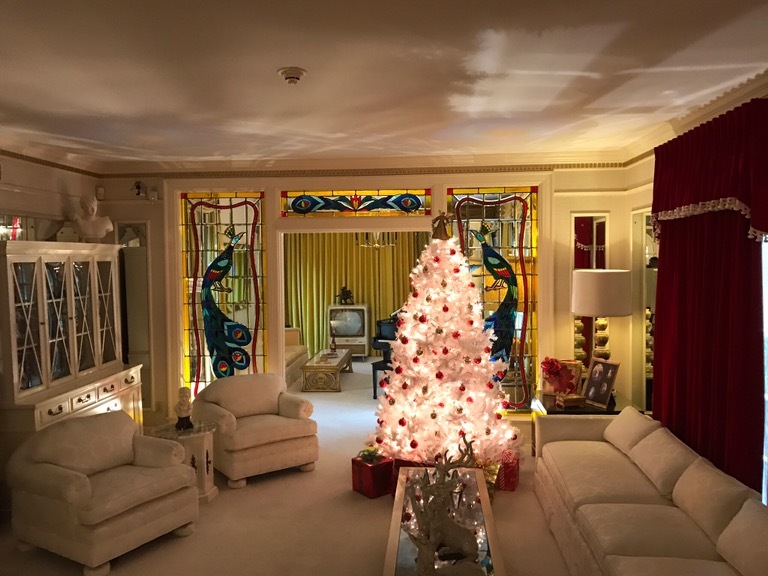 Graceland is basically a regular house. The house is just over 17,000 square feet with 23 rooms, but it doesn’t feel that large. Of course, not all rooms are open to the public. The entire upper floor is closed off, for example. Still, I bet many of you reading this have a home that feels nearly as large inside. Certainly more lavishly decorated. This is not the home of a Vanderbilt or a Guggenheim. Elvis paid $102,500 for the property in 1957 and spent an additional $500,000 with additions and remodels. Other than the peacock stained glass in the middle of the living room, this could be at the home of anyone you know. The kitchen was equally amazing because it is so normal looking. Well sure it is dated, having been last remodeled in the early 1970s. But its smaller than most kitchens in a modern home of today. I think my house in Folsom had more counterspace and Heather constantly complained that there wasn’t enough counterspace to do any real cooking. I guess peanut butter and banana sandwiches don’t take much room to prepare. Downstairs is one of my favorite rooms. 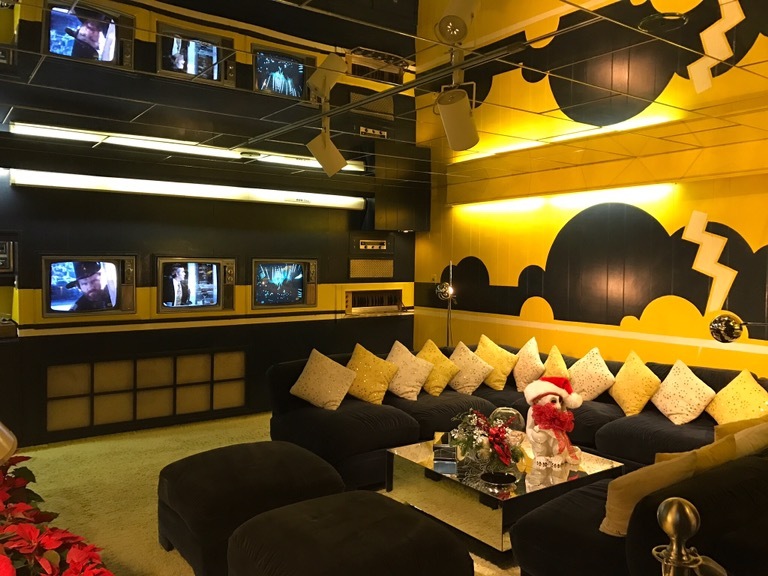 Elvis liked to watch TV here in the room with bold yellows and blacks. His trademark lightning bolt with the TCB lettersis visible on the right side of the photo. Of course, Taking Care of Business in a flash is what that means. 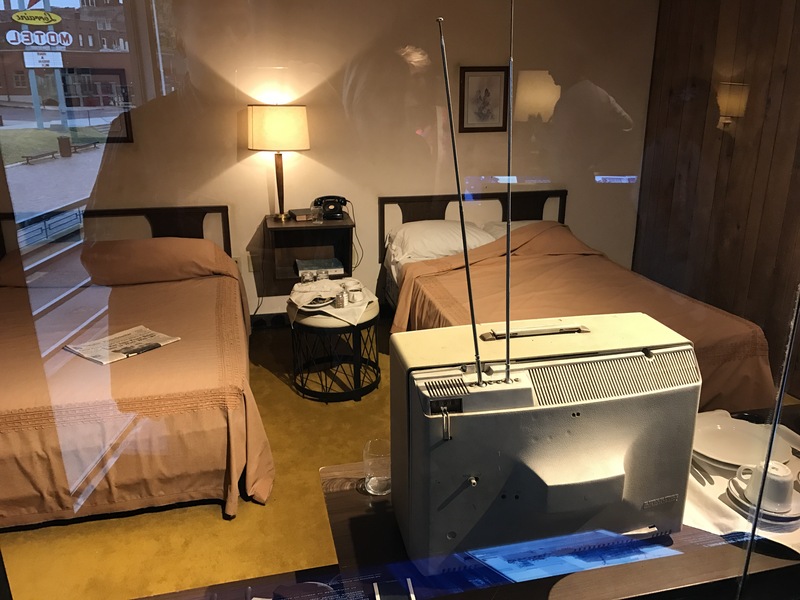 There were 3 TVs in here and Elvis reportedly used to watch all 3 at the same time. With that kind of multi-tasking he would have made a great Millennial! 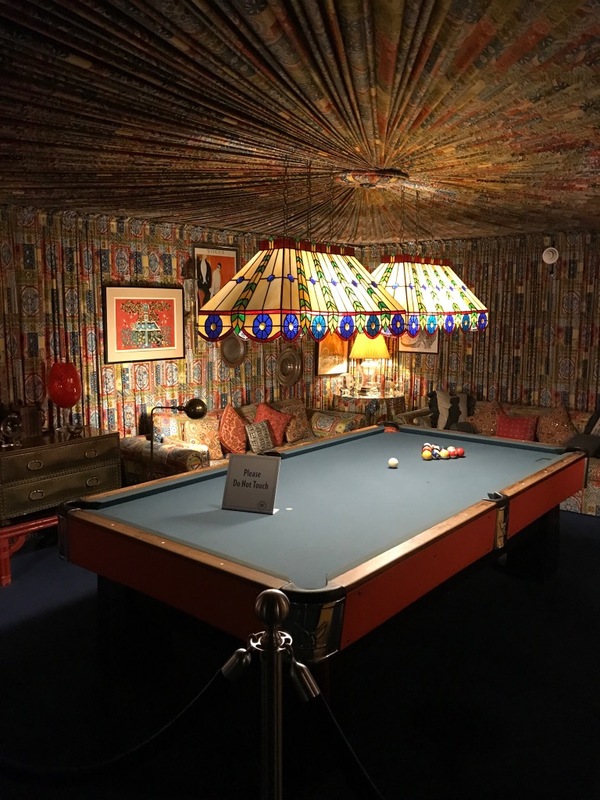 Next door to the media room is the billiards room. Every wall and the entire ceiling is covered with a fabric. Every inch. The fabric gives the room an interesting almost European feel but the overall decoration can only be described as LOUD. Reportely, this room encouraged people to get rowdy and there are many stories of crazy antics taking place here. 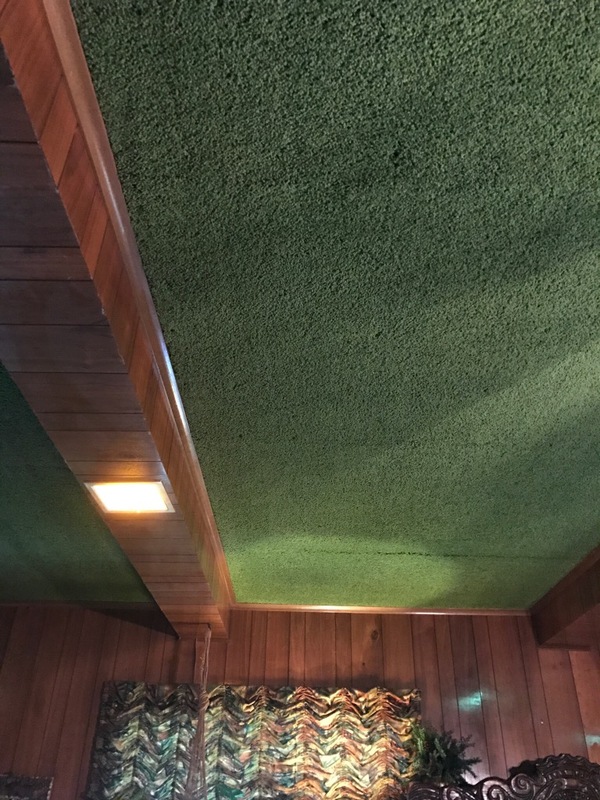 Elvis was a big fan of Hawaii and perhaps the most famous room at Graceland is the Jungle room. It is right behind the kitchen. 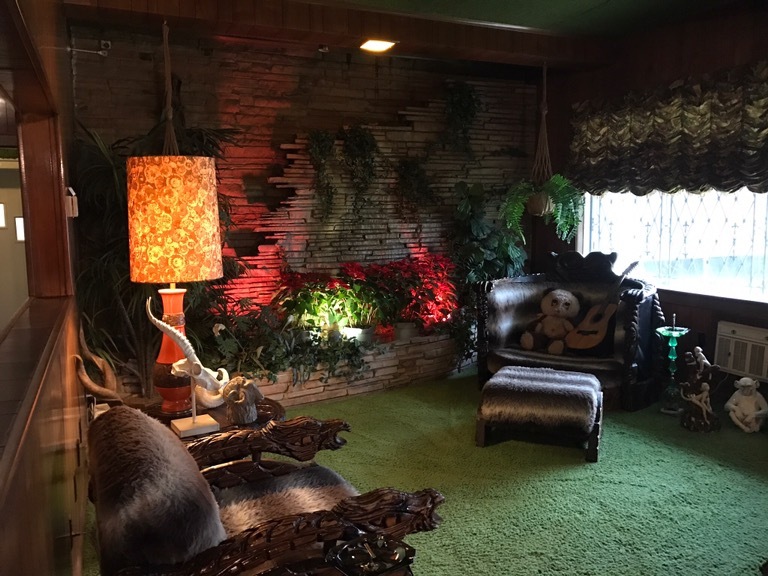 The Jungle Room is decorated like a Polynesian village, complete with green shag carpet on the floor AND the ceiling, hand-carved wooden and fur furniture, fake plants, and a water fall built into the wall. 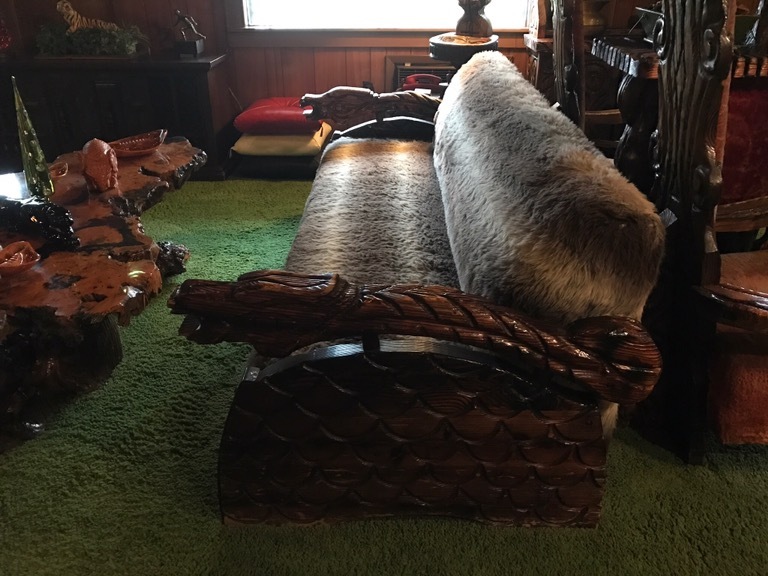 The interior tour ends at the Jungle room. From here the tour continues outside. I looked back at the main house and was again struck by how normal it seems. I don’t know if that’s because houses today are just bloated and oversized or this house really wasn’t that large. Probably a bit of both. The three windows on the lower right with the 3 wall air conditioners? That’s the outer wall of the Jungle room. Kind of amazing that there was no central air conditioning. 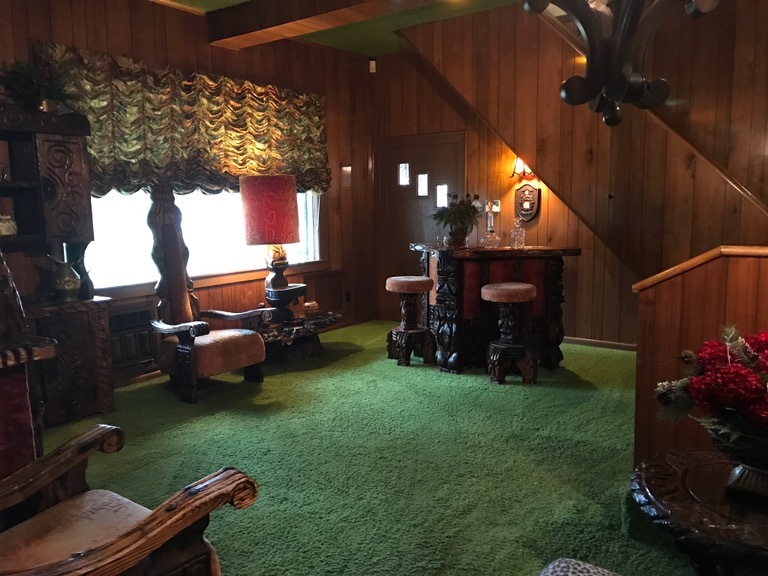 The Jungle room was an addition and was not part of the original house. 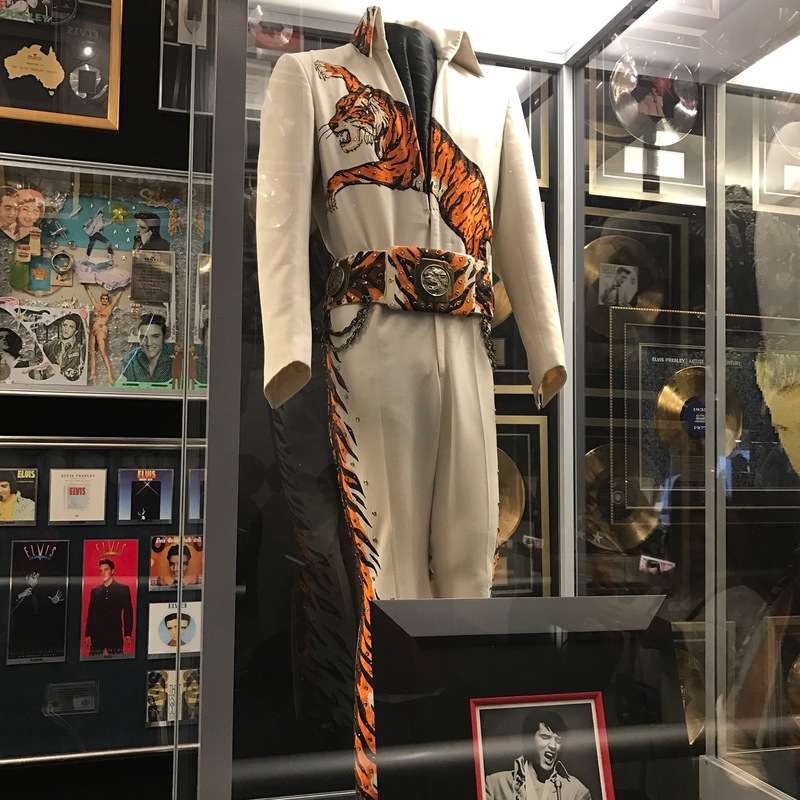 Stepping next door we find Elvis’ “trophy” room. This building was also an addition to the main house. 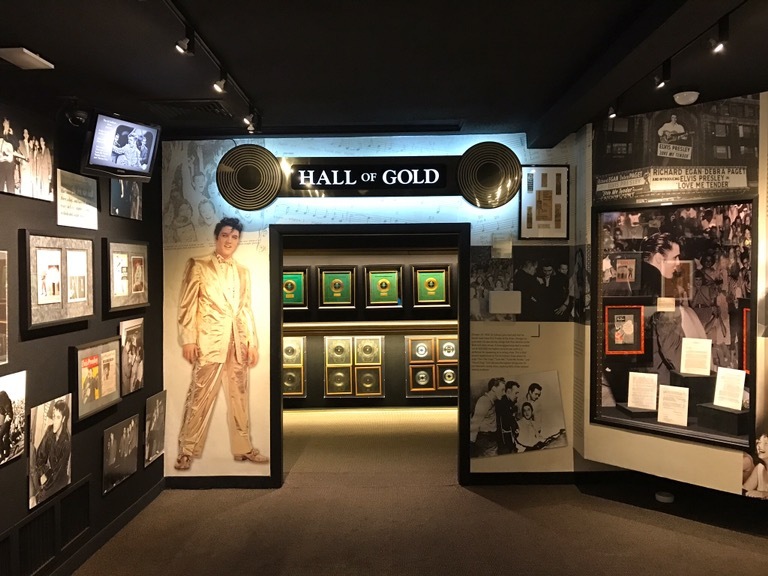 It holds most of Elvis’ gold and platinum records along with memorabilia from his career. Having one hit on the Billboard Top 40 is a lifetime achievement. Blink-182, I’m talking to you. Elvis had 18 songs that were not just on the chart, but #1 on the chart! Another 38 that were in the top 10. Incredible! 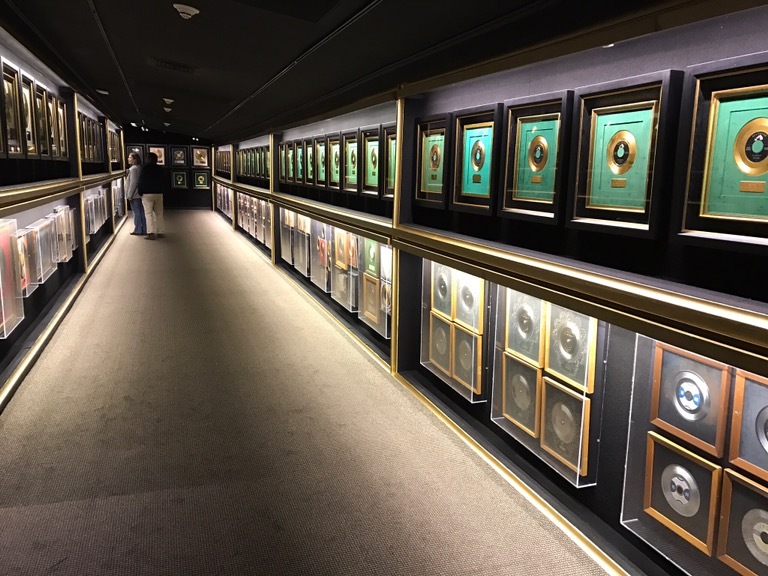 That point is driven home with a stroll along this corridor that is lined from ceiling-to-floor and end-to-end gold records. 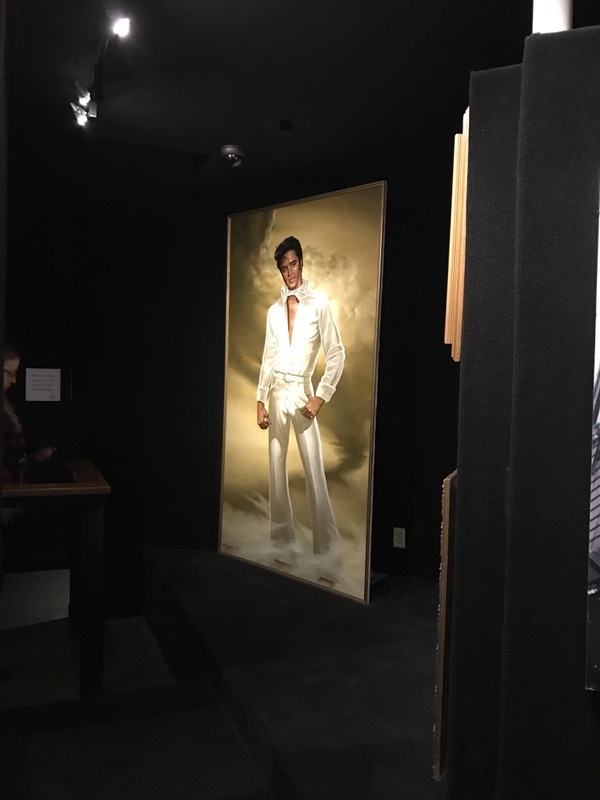 This part of the tour really reinforces the image of Elvis as a legend. I kind of wanted this life-size painting to hang in my living room. . . but it wasn’t on velvet so I passed. The next building is one of the most recent on the property – the racquetball court. Elvis became very interested in racquetball and personally oversaw the design and construction of his own court. Today, the court is full of even more records and awards…plus a collection of his more outlandish performance outfits. 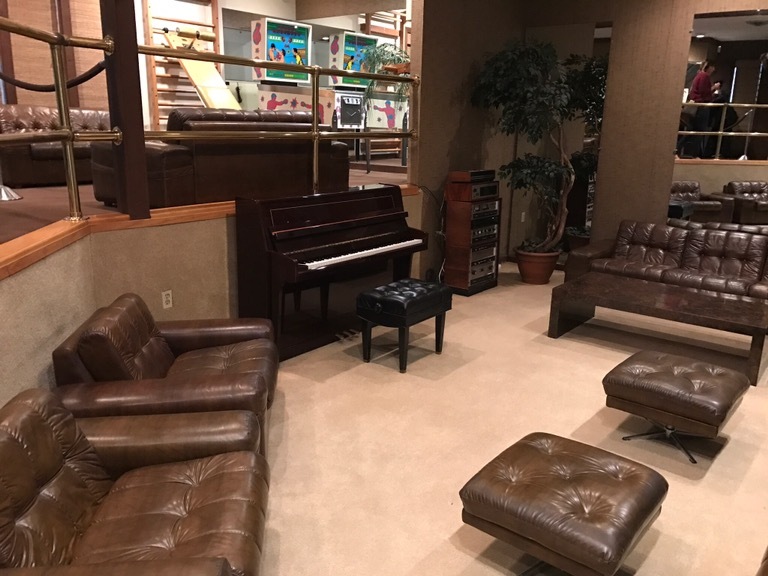 The racquetball court has a lounge, complete with a piano. Because, of course, Elvis. On the morning of August 16, 1977, Elvis sat on that bench seat while he played a few tunes on this piano and sang songs with his family. Several hours later, he would be found dead on the floor of his bathroom. By the time he was 42, he had become the most successful recording artist in the world. (His record has been beaten only once, by Garth Brooks). He also starred in 33 movies, every one of which made money, making him a bona fide movie star. I’m 45. And I don’t feel old. 42 feels very young to me. By just about every measure, he was far more successful than me. Except at one thing. Living to 45 is something I’ve got him absolutely beat! 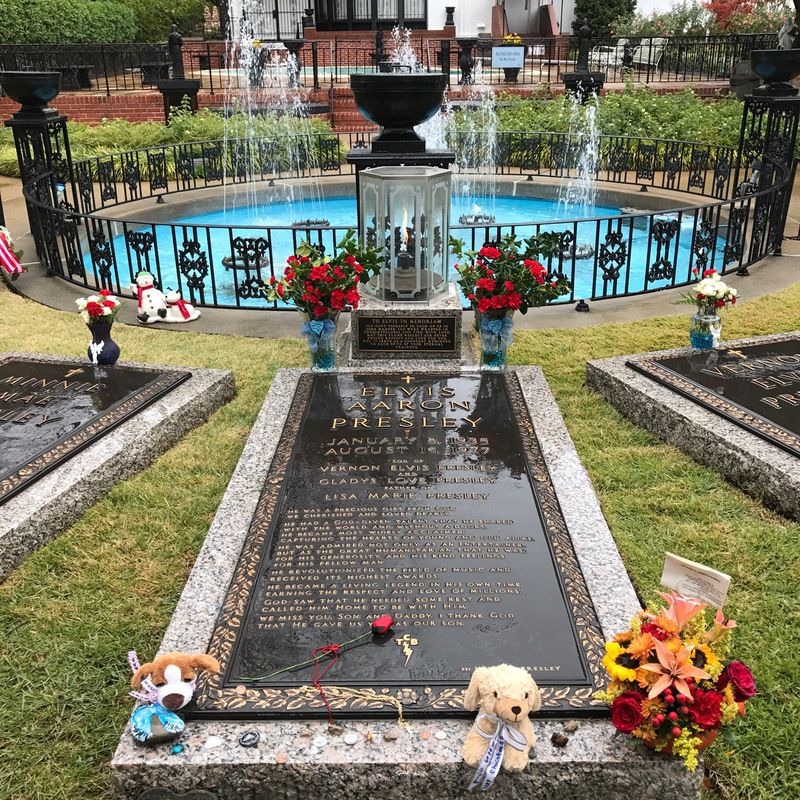 Elvis is buried outside in an area called the Memorial Garden. His parents are also buried here. Lisa Marie Presley was 9 when Elvis died. Elvis’ father Vernon was executor of his estate. When Vernon died in 1979, Lisa Marie was just 11 years old, and too young take over the estate. Vernon took a big risk and chose Elvis ex-wife Priscilla as executor of the estate. By this time only $1 million dollars or so remained of Elvis’ fortune. Graceland cost $500,000 a year to maintain. Priscilla made a huge gamble and hired a CEO to turn Graceland into a tourist attraction. The gamble paid off and by the end of the first year they had recouped all of their costs. 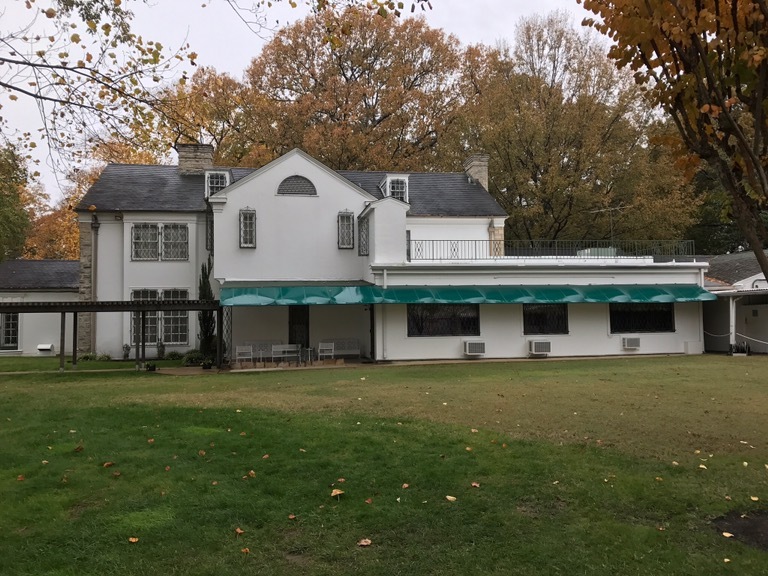 Lisa Marie inherited Graceland when she turned 25. 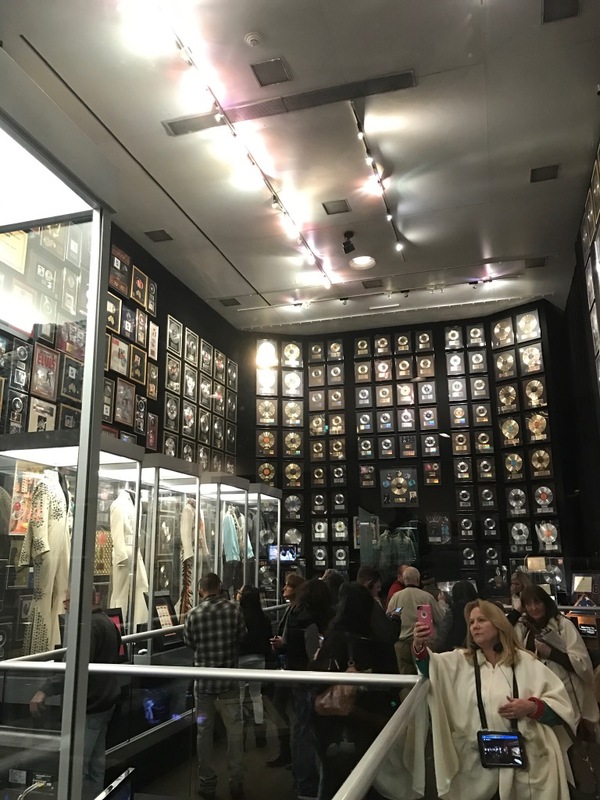 By that time, proceeds from Graceland had soared to nearly $100 million. Today Graceland is preserved along with the main “museum” complex across the street. 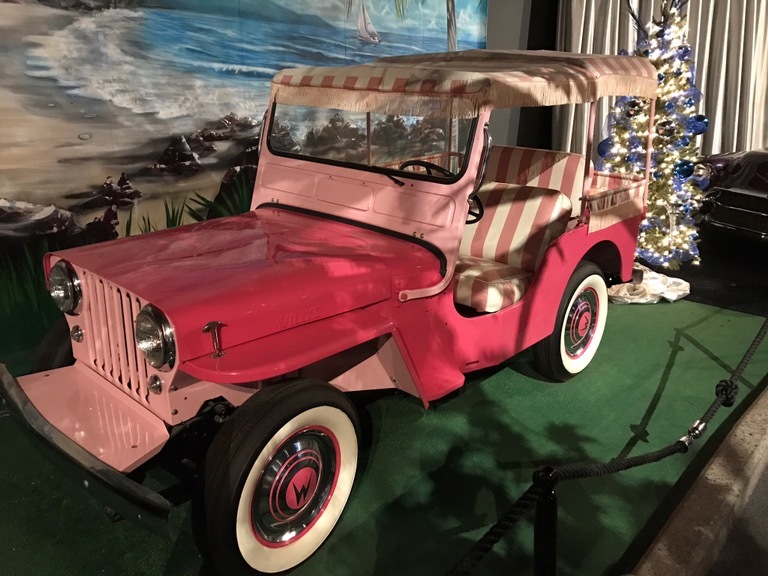 Exhibts include some of Elvis’ cars like this pink Jeep which was used by the security staff. Looks pretty threatening. Elvis hated to fly, but the demands of his travel schedule made ground travel by bus impractical. He relented and sent one of his agents on a search for an airplane. 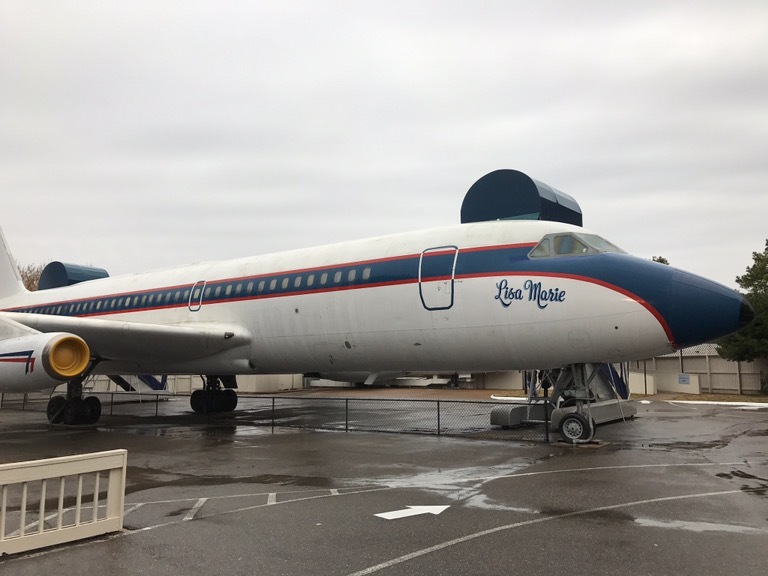 The agent found a used Convair 880 preserved in the desert and bought it. The 880 had been part of Delta Airlines fleet but now it would serve as “Hound Dog One.” The same Texas company which built Air Force One was in charge of the refurbishing. 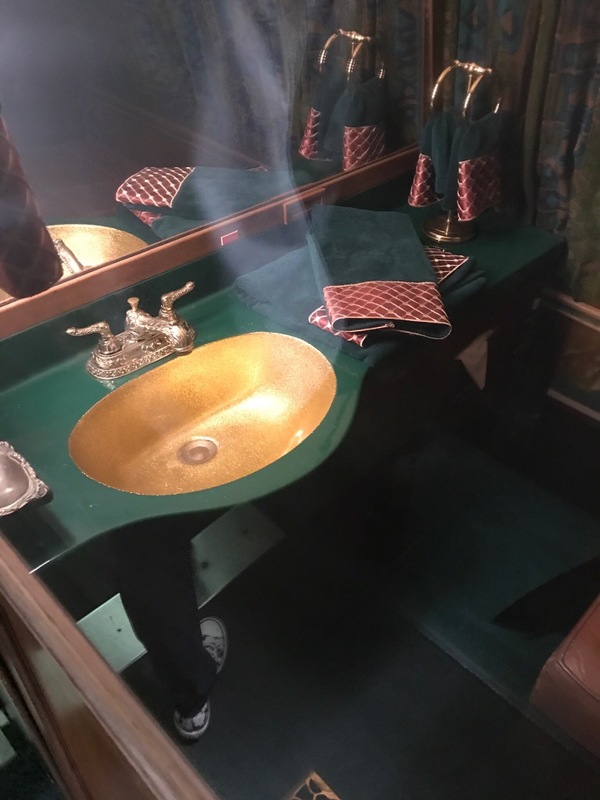 After refurbishment, the 880 was Christened the “Lisa Marie.” She was capable of seating 32 passengers in pure Elvis fashion, with gold-plated sinks and seatbelt buckles, plush leather chairs, and a private bedroom for Elvis to catch a few hours of sleep while on trips. Elvis loved the plane and used it frequently. Once, he took Lisa Marie and some friends to Denver so they could have peanut butter and banana sandwiches from a sandwich shop he liked. Lisa Marie has 51 speakers and is a hi-fi stereo system with wings. 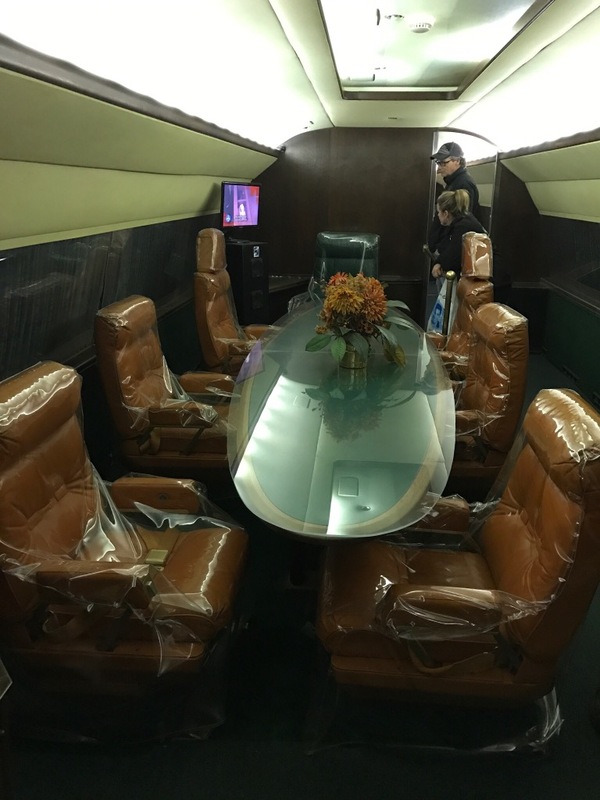 After his death, the plane was transported to Graceland. The wings had to be cut so that the aircraft could fit on city streets! 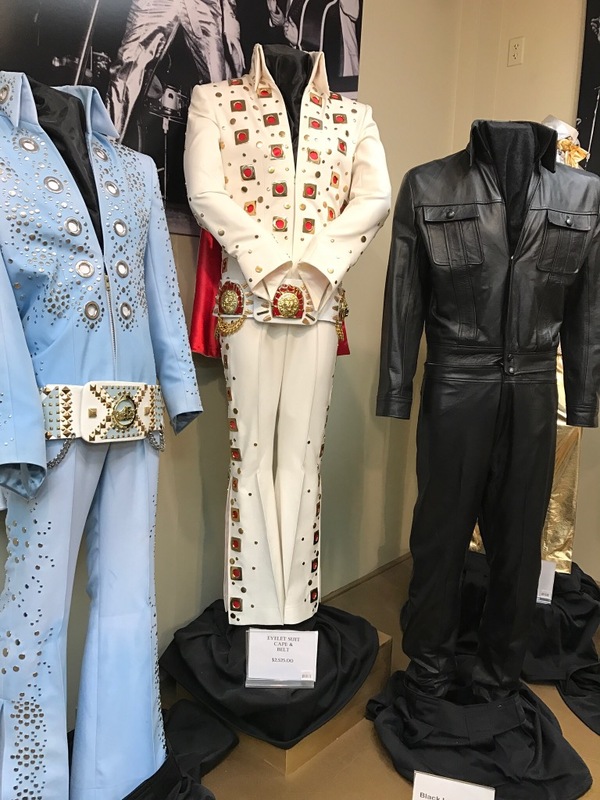 There are at least 10 gift shops at Graceland. Impressively, each one sells (mostly) unique items! One of them even sells authentic replica outfits. The white and red beauty can be yours for only $2,275. A bargain! 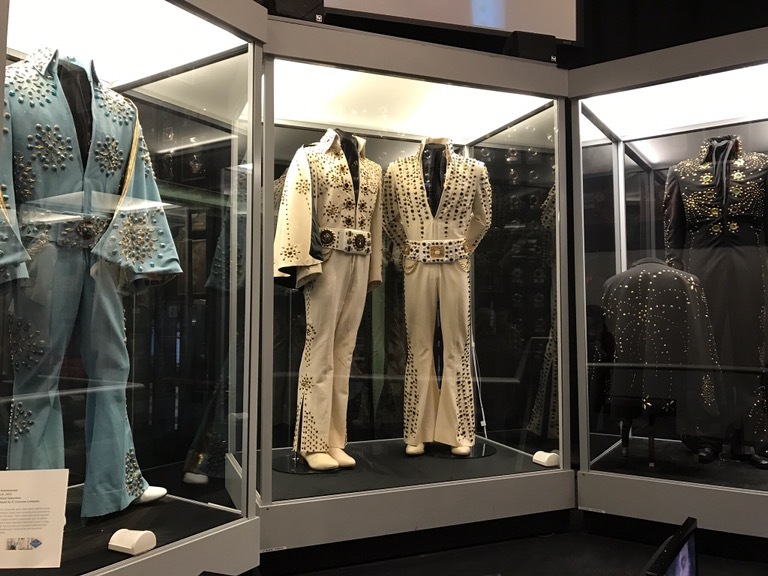 If you find yourself in Memphis, you really have to make a trip to Graceland. Even if you aren’t much of an Elvis fan. Quite possibly, you will be one after you leave!